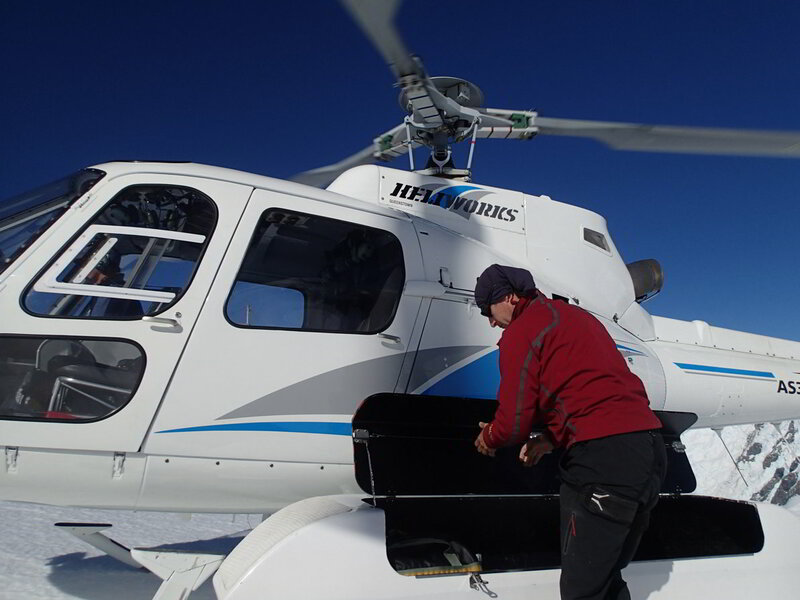 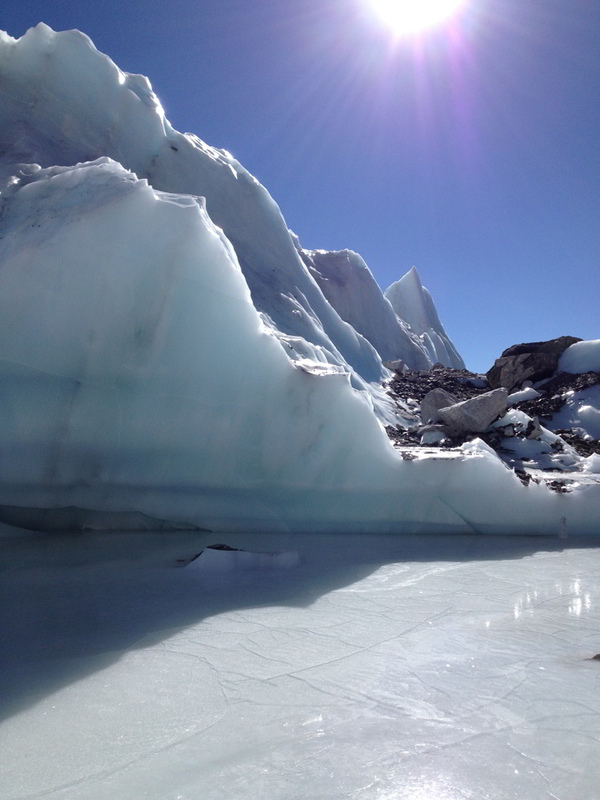 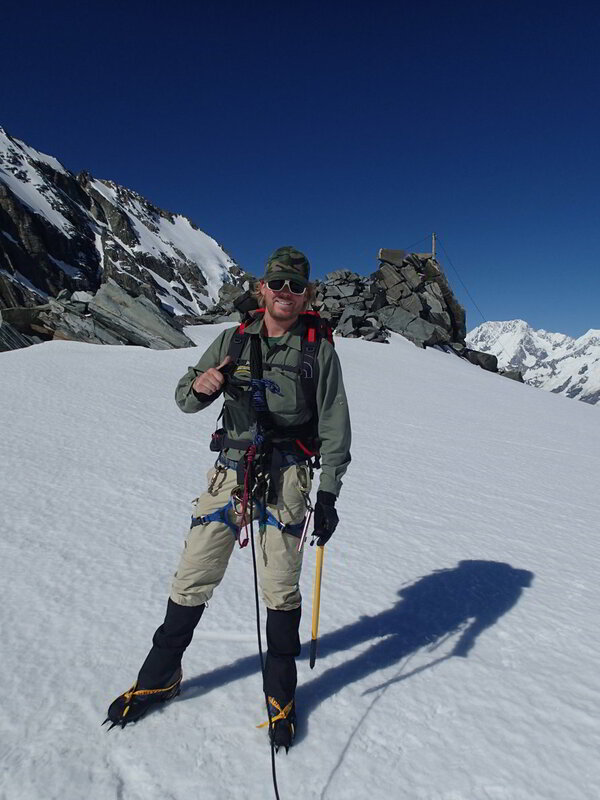 …I started planning my Everest expedition in January/February 2012, after having done research about the project and being introduced to the leading expedition company by an experienced climber relative of mine. 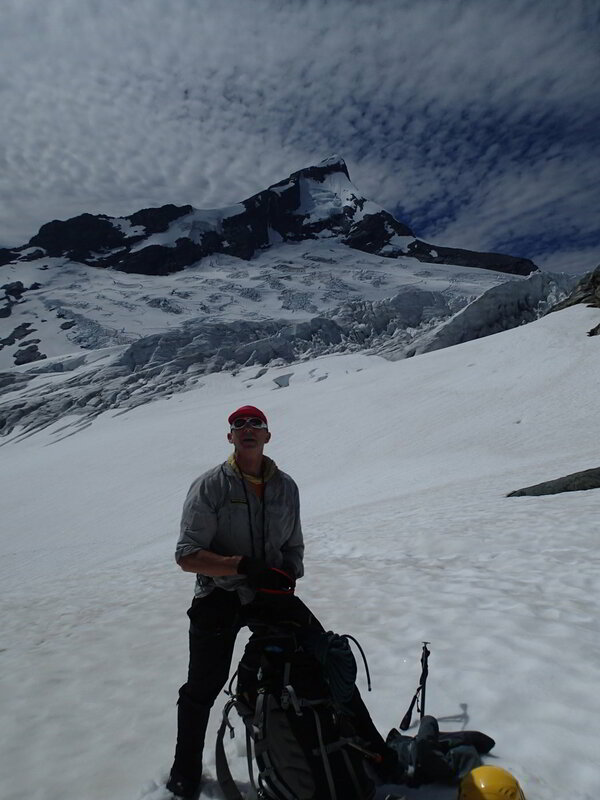 Since leaving London in early April 2012, I have been on a year-long program of general physical training focused on endurance exercise – in combination with traveling around the world. 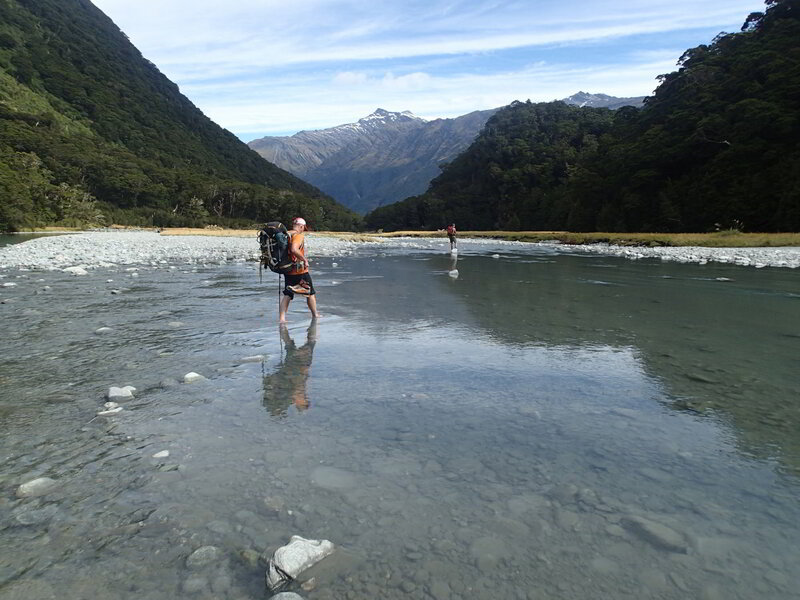 A lot of my friends thought I was just chilling out, hanging out on beaches and only exercising my beer swinging arm, but the reality is that I combined the opportunity to visit places that I have never been to – and that are more unique than a beach (which are more or less the same everywhere) – whilst exercising as much as possible everywhere – running, hiking, biking, cross-training – as well as doing specific climbing training in many locations, including wall climbing, rappelling and rock climbing. 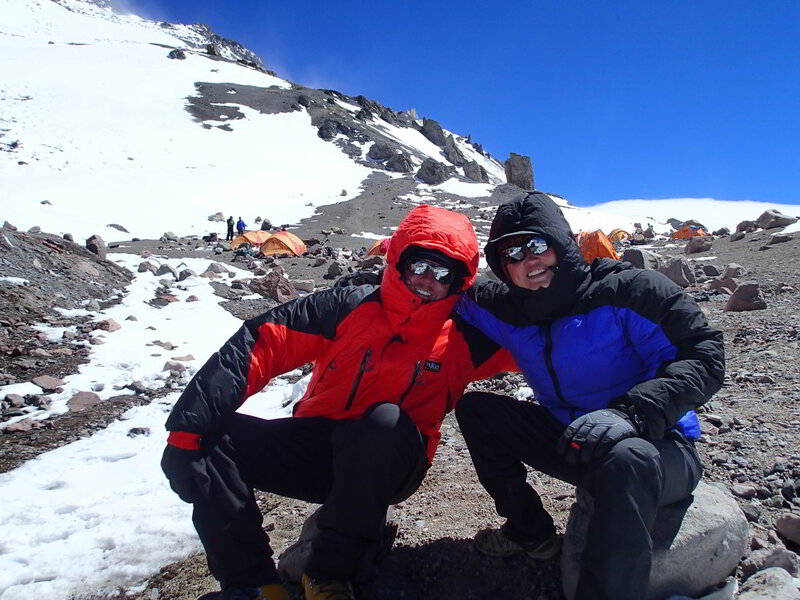 After New Year’s, I have been engaged in a full-time mountaineering training program, with technical mountaineering training in New Zealand, and a climb of Aconcagua (6,962m – the highest mountain outside the Himalayas). 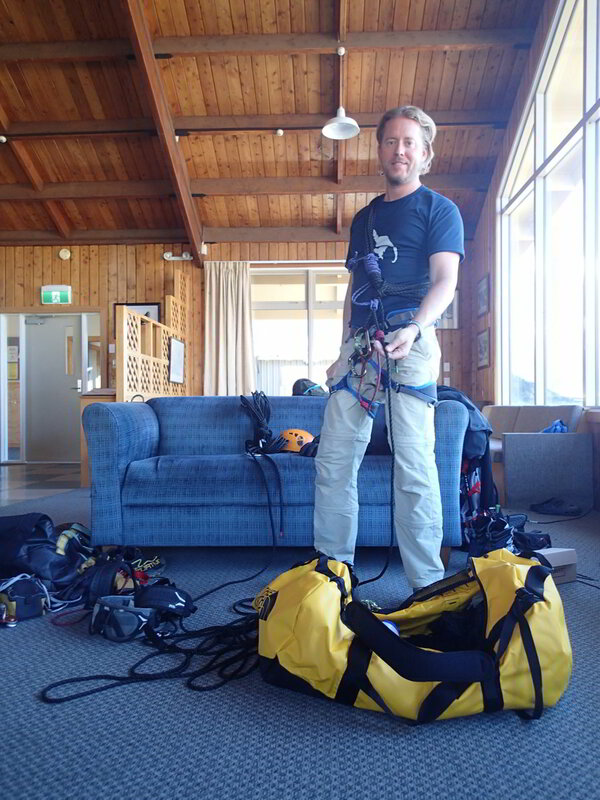 I finished the mountaineering preparation program by mid-March, and am currently passing through Australia for two weeks on the way to Nepal. 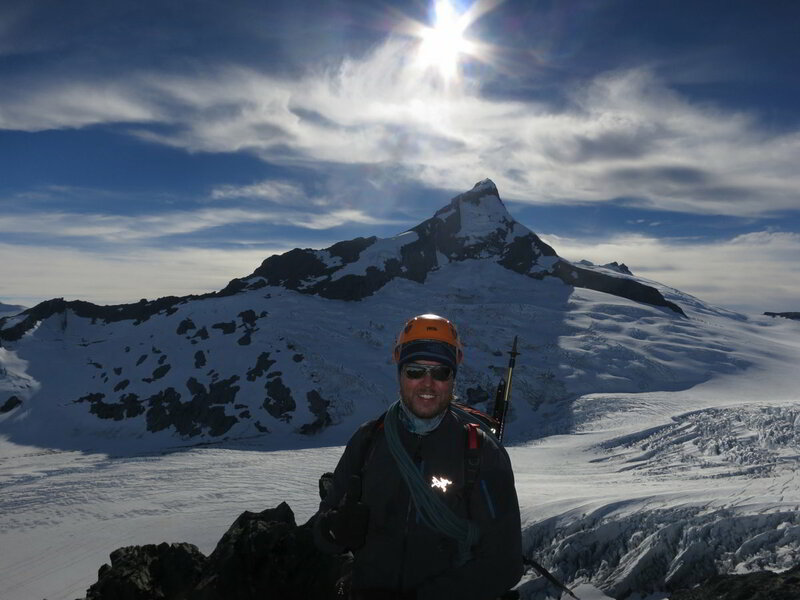 During these last days before Nepal, I am still trying to work out for several hours a day because one of the guides I was training with in New Zealand (who has been on Everest 8 times!) 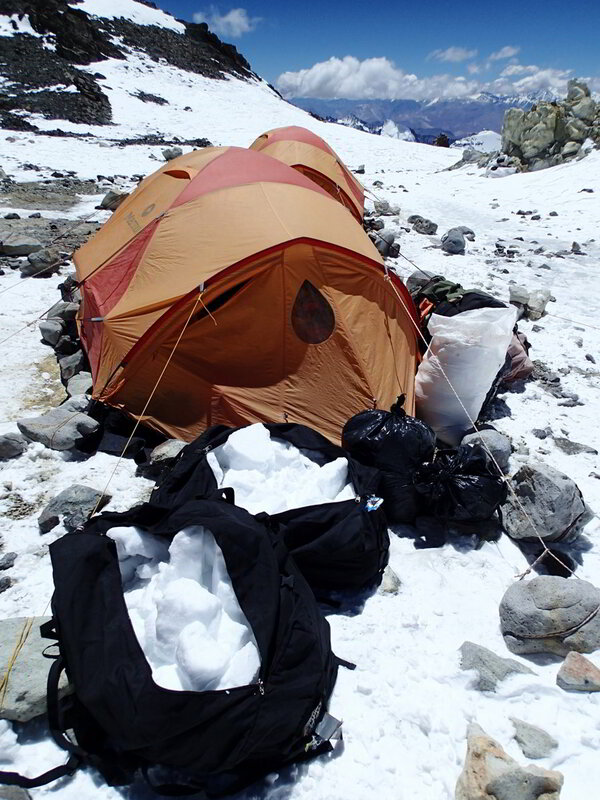 said: “Whatever shape you arrive with in Nepal – that is the shape you have; once you start the expedition you are not really improving your shape much – because of the altitude making recovery more difficult – and then it’s all about (a) keeping your shape, and (b) conserving your strength and energy.” I also took the opportunity to visit two friends in Melbourne, Jon and Adam, who were both on my Aconcagua expedition. 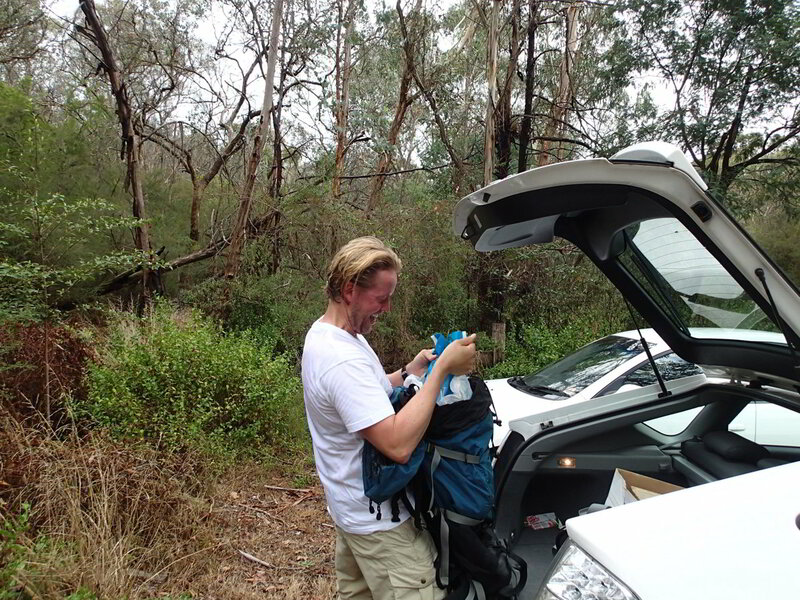 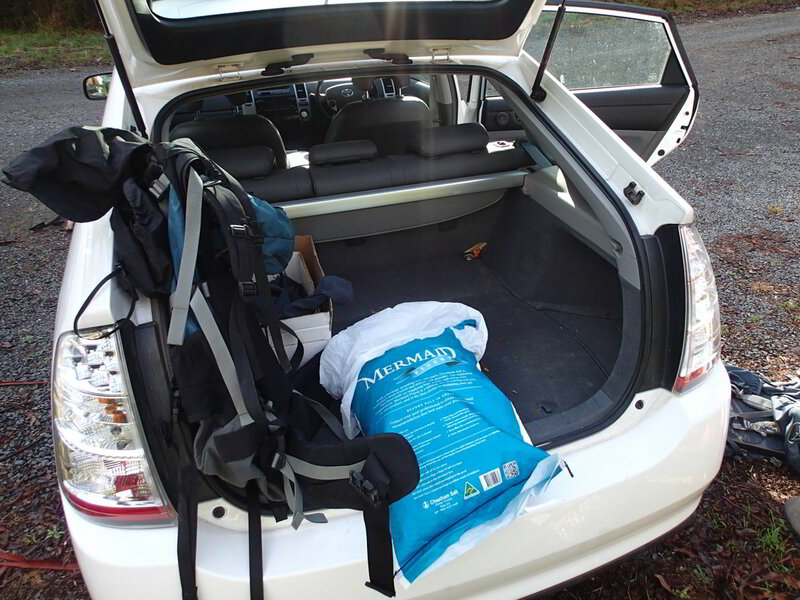 Jon had a supply of 20kg bags of salt, used for cleaning swimming pools, which we put into backpacks and went hiking around the hills outside Melbourne – which was a great exercise! 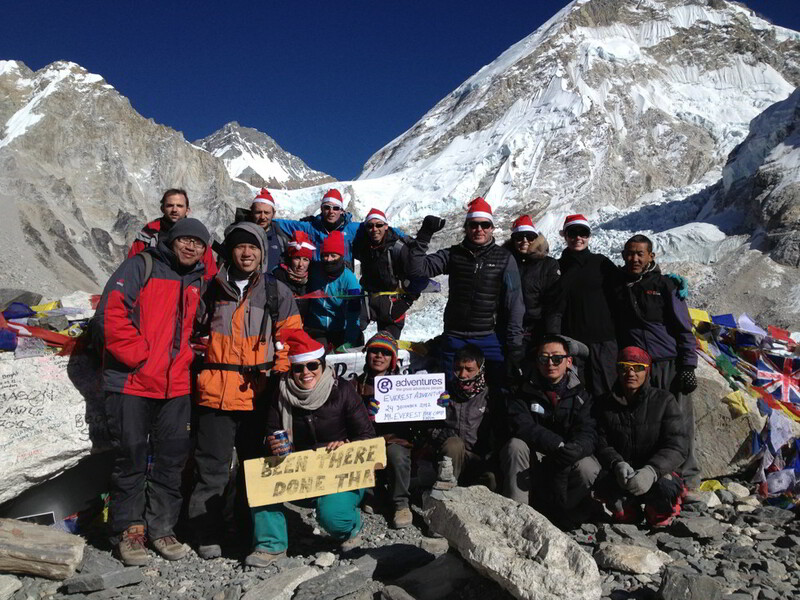 In December, I joined a group of about 15 people for a trek to Everest Base Camp. 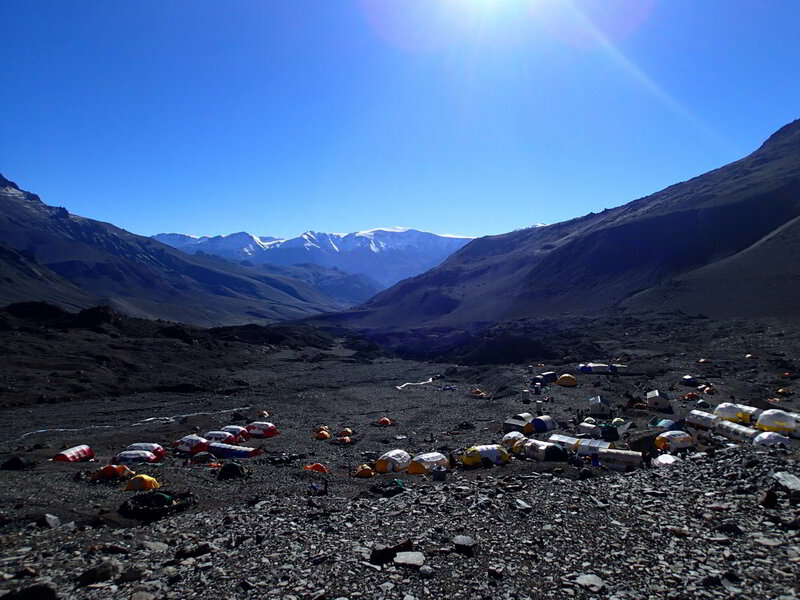 We started off in Kathmandu, taking a flight to the mountain village of Lukla at 2,800m altitude and from there trekked over approx. 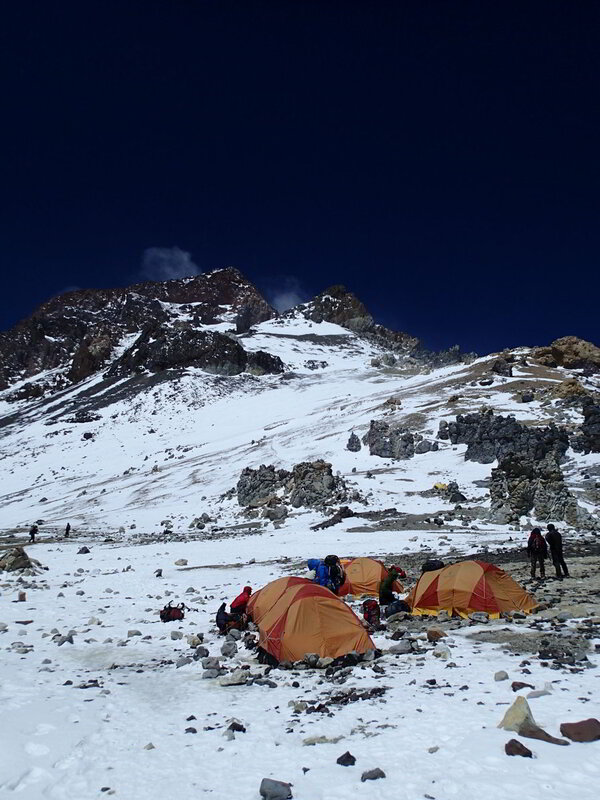 8 days to EBC and then back to Lukla in 4 days. 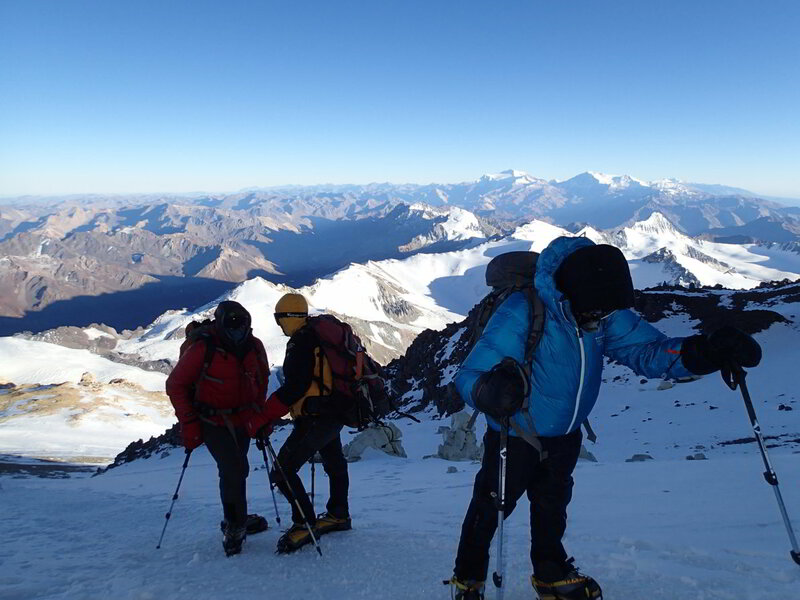 On the Everest climbing expedition, we will trek at a slower pace (10 days Lukla to EBC) because it’s more important to (i) acclimatize and (ii) not expend your energy too soon when you are going for the summit. 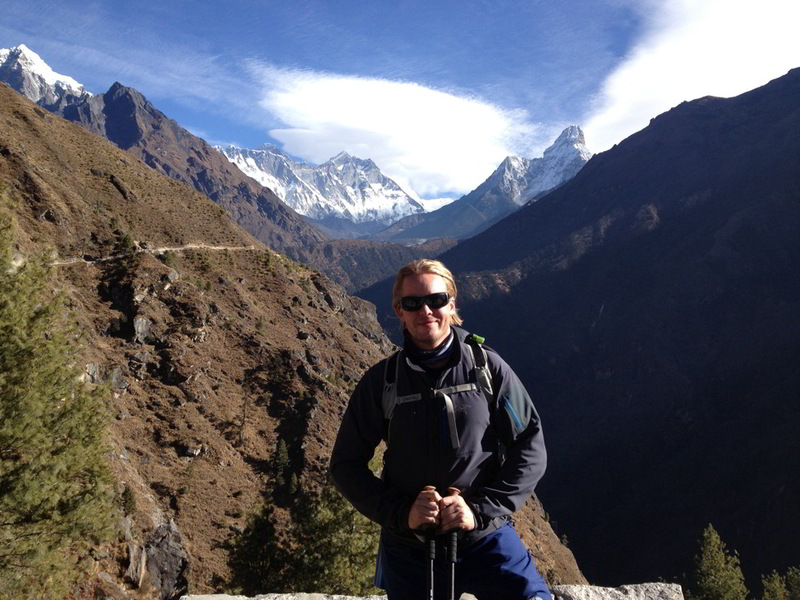 (No push-ups in Namche Bazaar this time!) 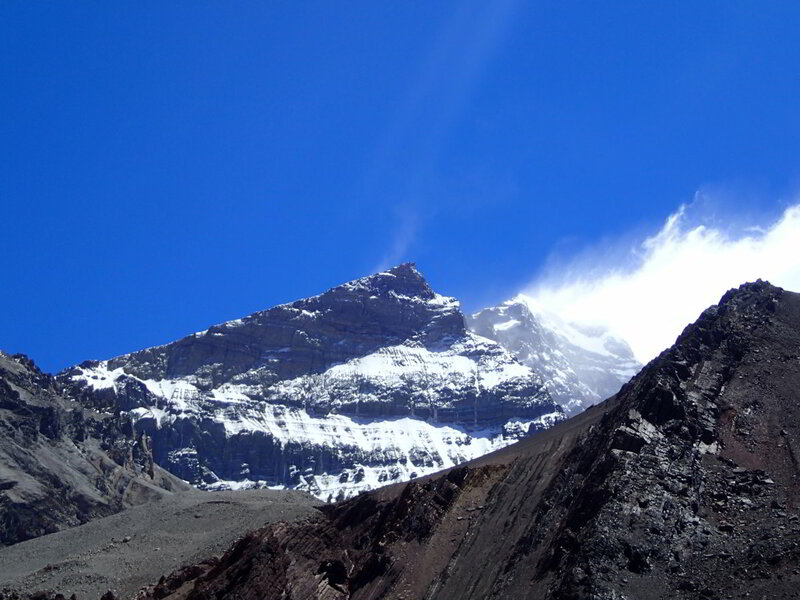 The Lukla-Everest trekking trail goes through beautiful nature and passes through small charming villages. 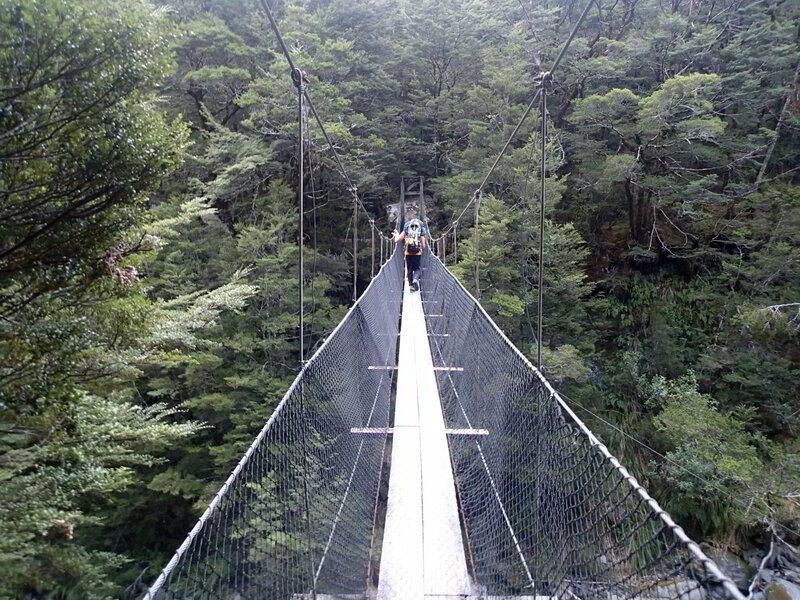 The trail is mainly on the sides of a river that runs down the valley, and there are several hanging bridges that one needs to traverse. 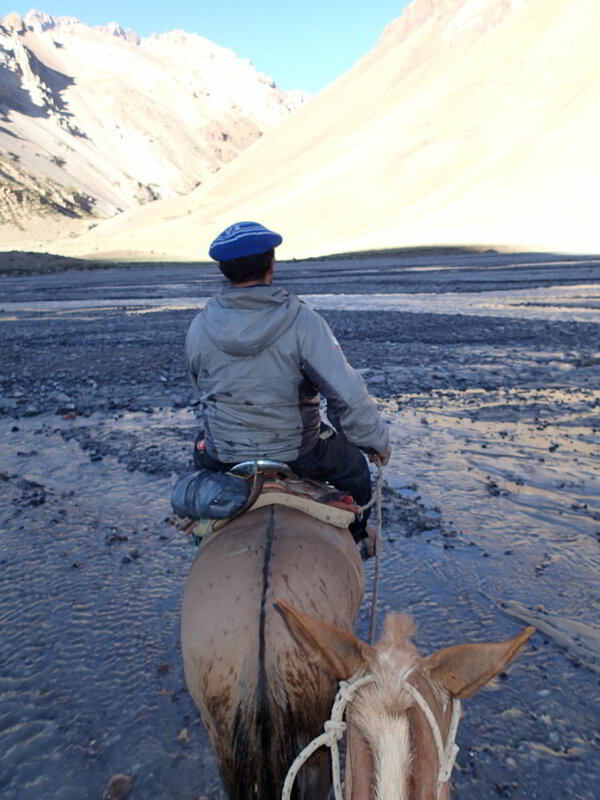 Every now and then, one has to step aside for scores of donkeys transporting loads up or down the mountain. 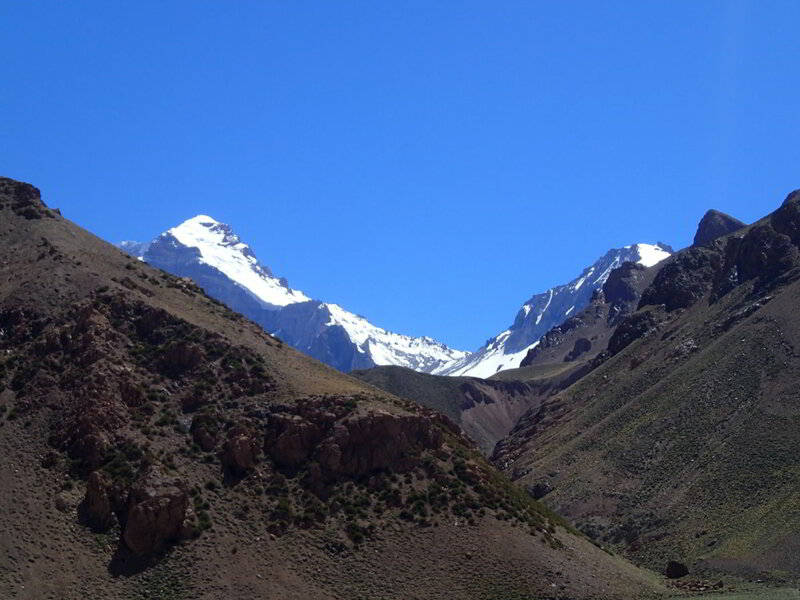 Higher up the mountain, donkeys are replaced by yaks – a furry cow-like animal living at high altitude (according to our Sherpa guide, Nepalese yaks cannot survive below 3,000 meters). 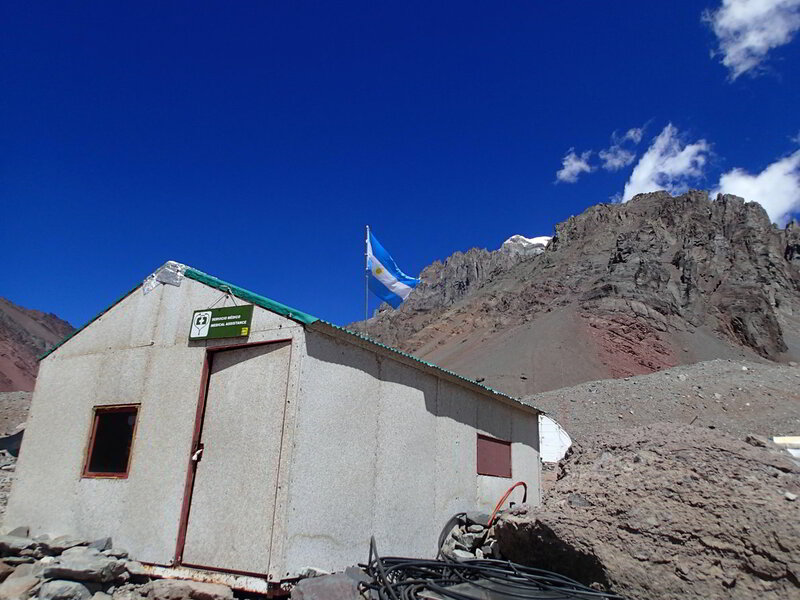 Along the trek, we were staying in small “tea houses” – and accordingly I think I almost drank more tea during that trip than in the rest of my life combined. 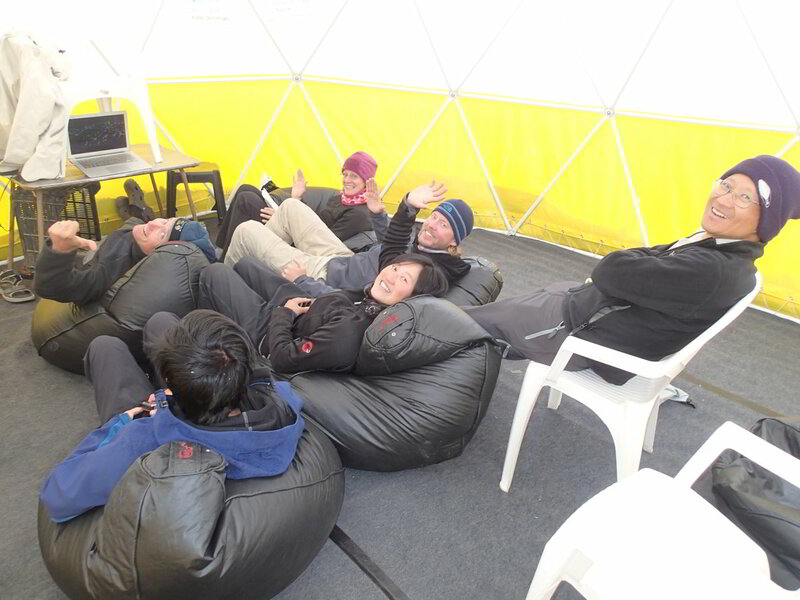 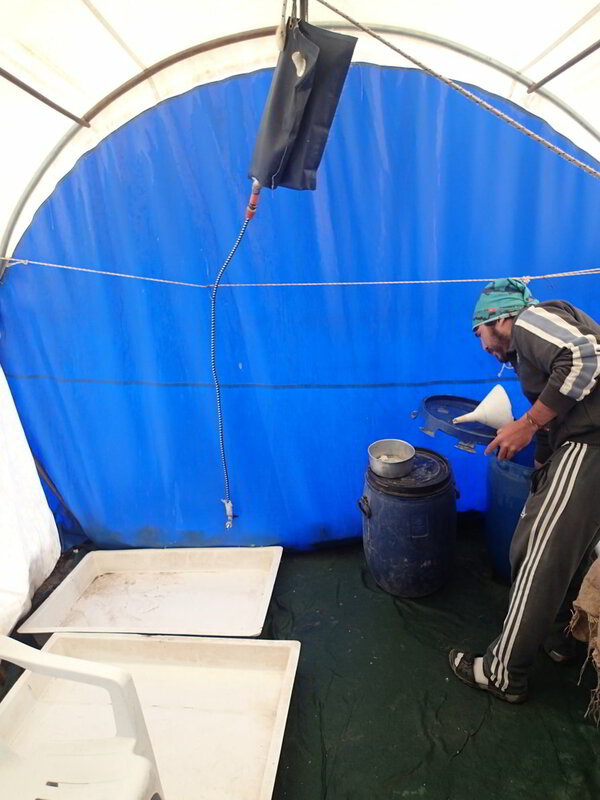 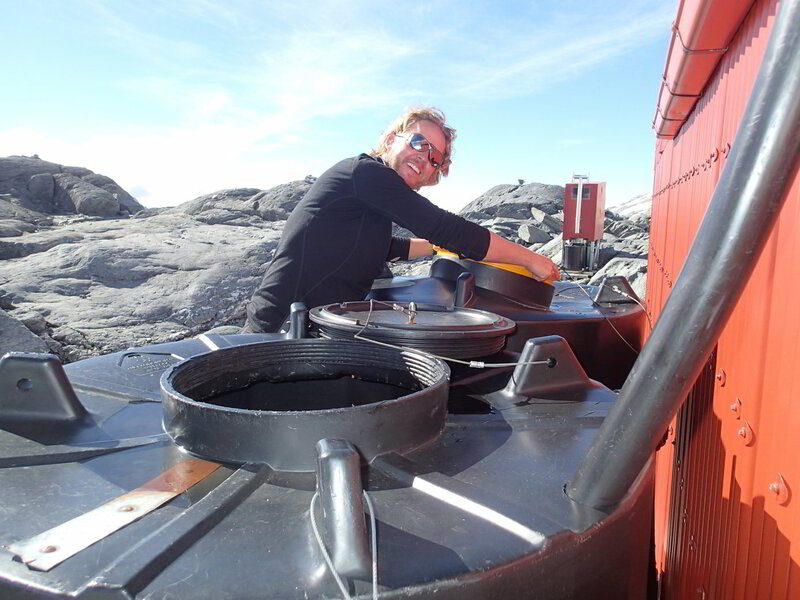 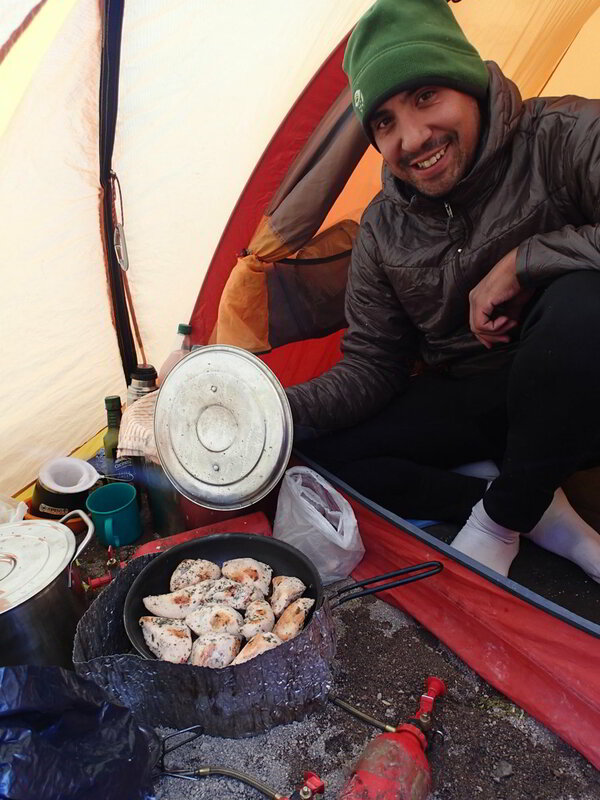 In December, it was freezing cold at night (-10 degrees Celsius – in the room!) 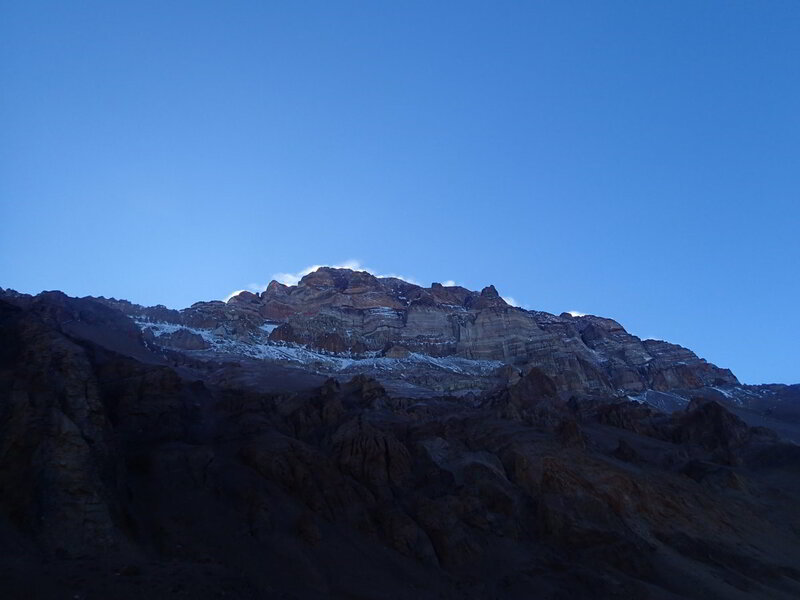 but an agreeable temperature daytime ~ +10 degrees Celsius. 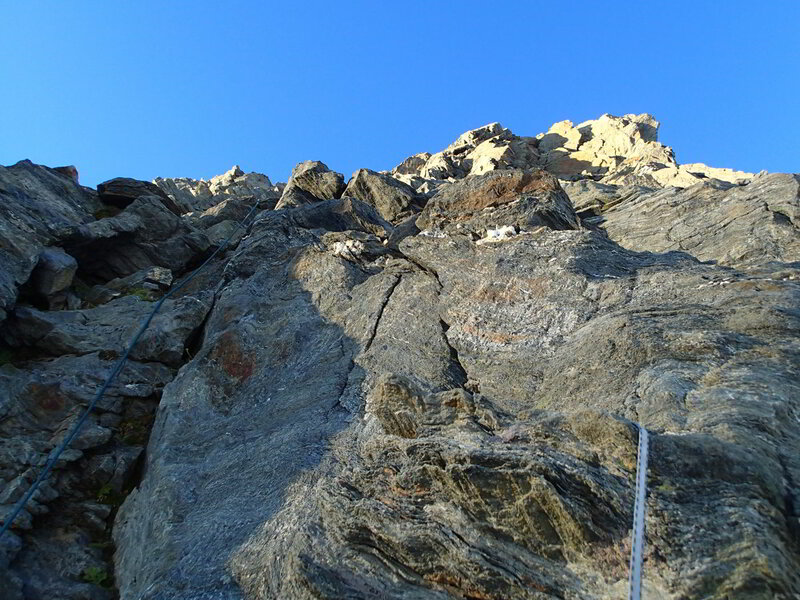 The advantage of going in December is that it’s a lot less crowded. 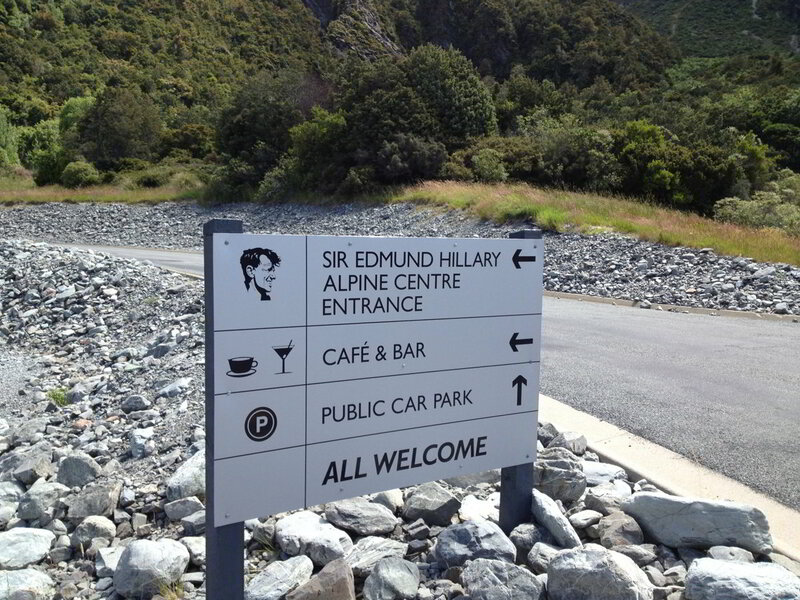 I expect it to be a lot busier now when I get back. 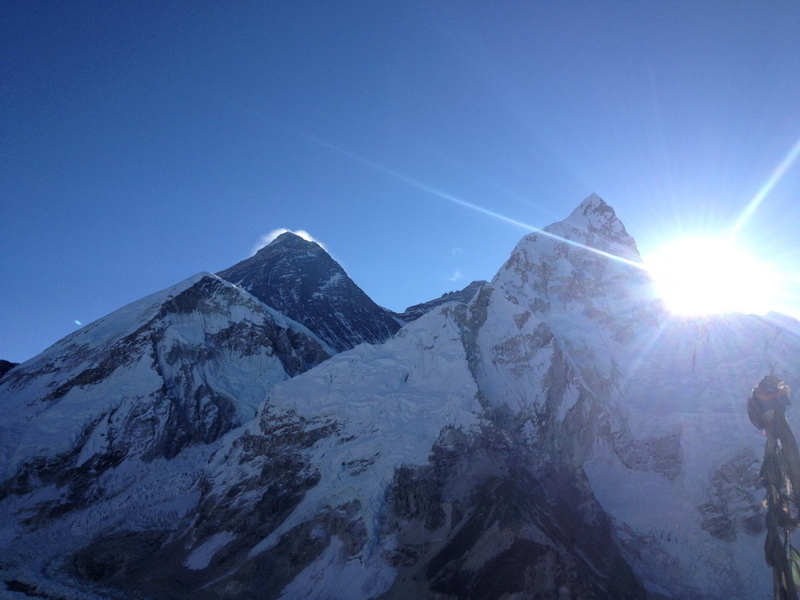 We reached EBC on Christmas Eve, and a smaller group of brave souls among us gathered at 5am on Christmas Day morning to ascend to Kala Patthar at ~ 5,600 meters altitude to watch the sunrise over Everest (8,848m) and Nuptse (7,861m). 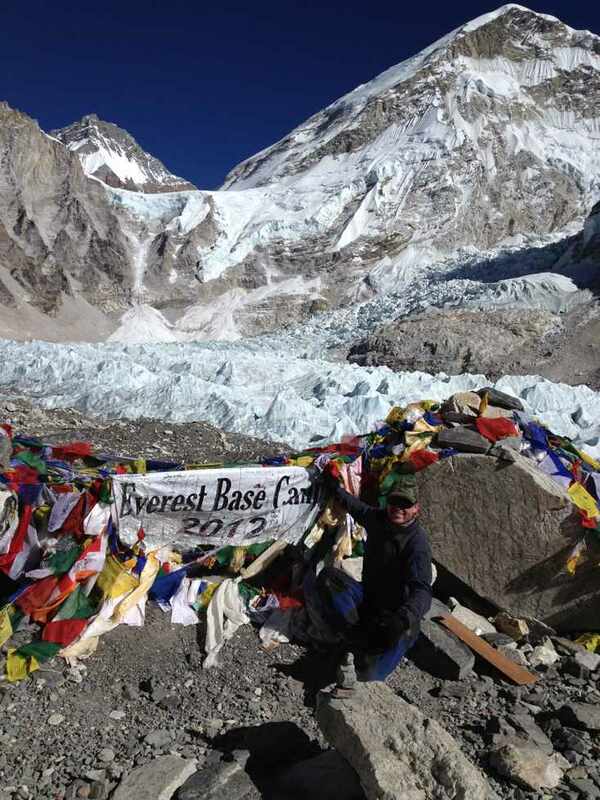 You cannot actually see the summit of Everest from the base camp, and the view from Kala Patthar is incredible (the high resolution base camp picture linked to from the “Background” page is taken from Pumori, I believe, which is just behind/above Kala Patthar). 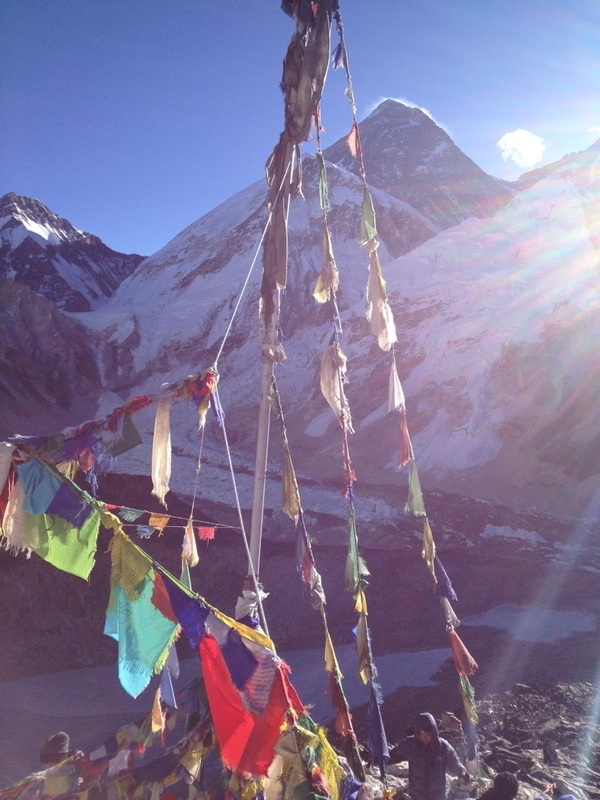 I would definitely recommend doing the EBC trek for anyone as it is a scenic landscape, and a great view to experience the Nepalese culture and friendly people. 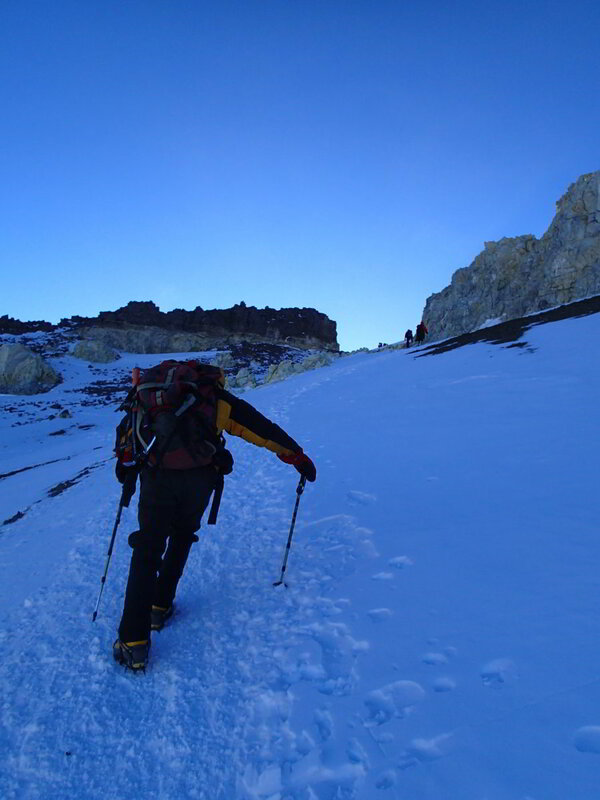 It is a good challenge in itself, reaching EBC at 5,350m and in particular the last trek up to Kala Patthar. 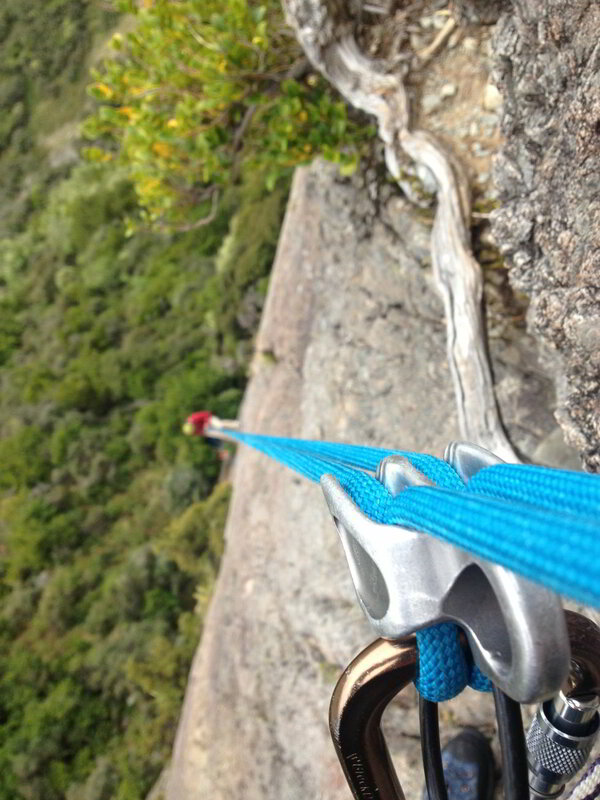 No climbing skills are required, simply good stamina for trekking. 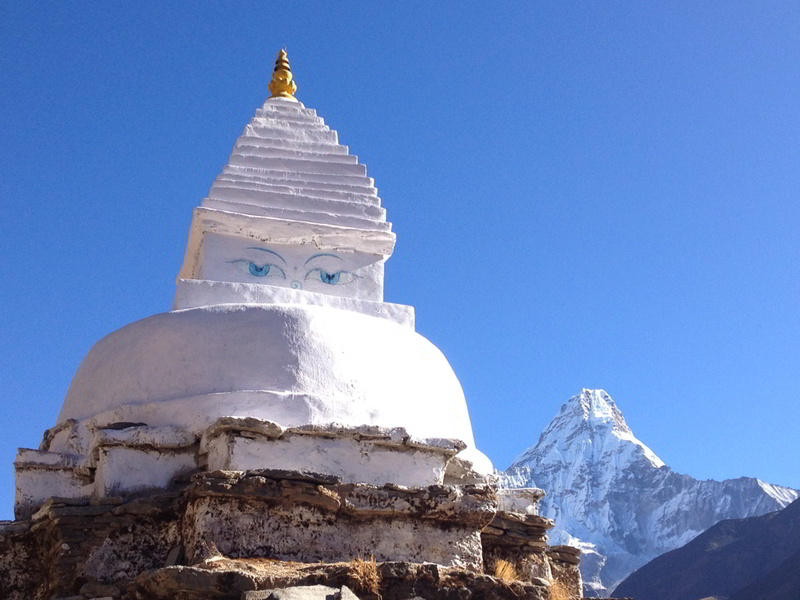 Much of the charitable investment going into Nepal has gone into the region from Lukla to Everest, including significant charity work by Sir Edmund Hillary (the Kiwi who together with Tenzing Norgay Sherpa was the first to summit Mt Everest in 1953) who did an amazing job in improving conditions for the people who live in that region. 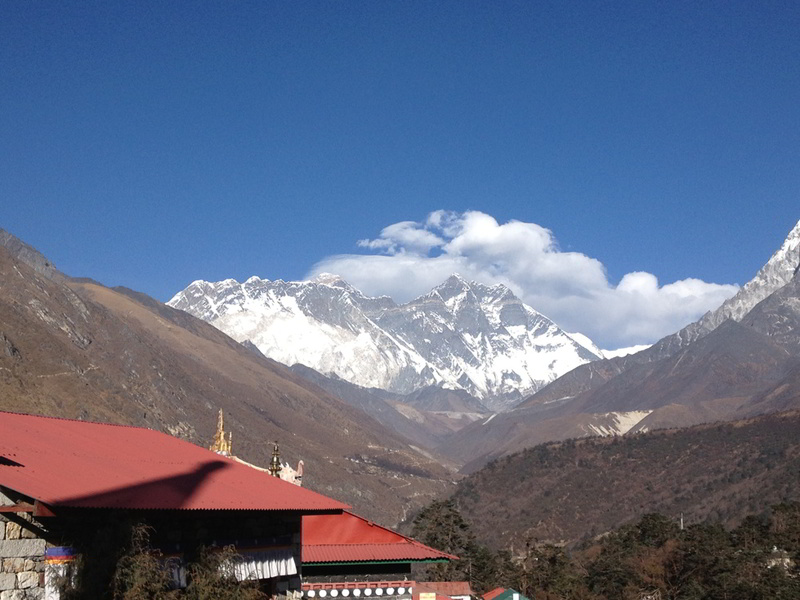 The dZi Foundation charity that I’m fundraising for is targeting an area much more remote, where no tourists venture, and it is significantly less developed than the main Lukla-Everest strip is today. 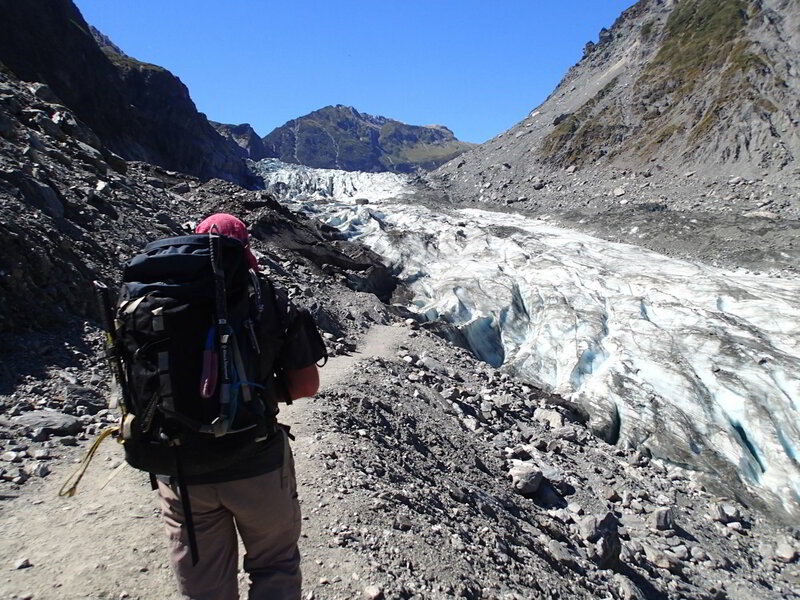 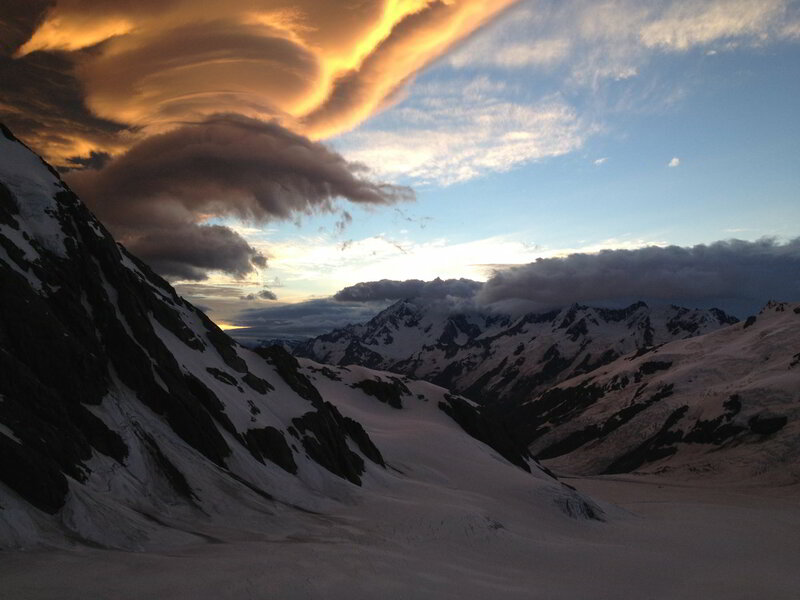 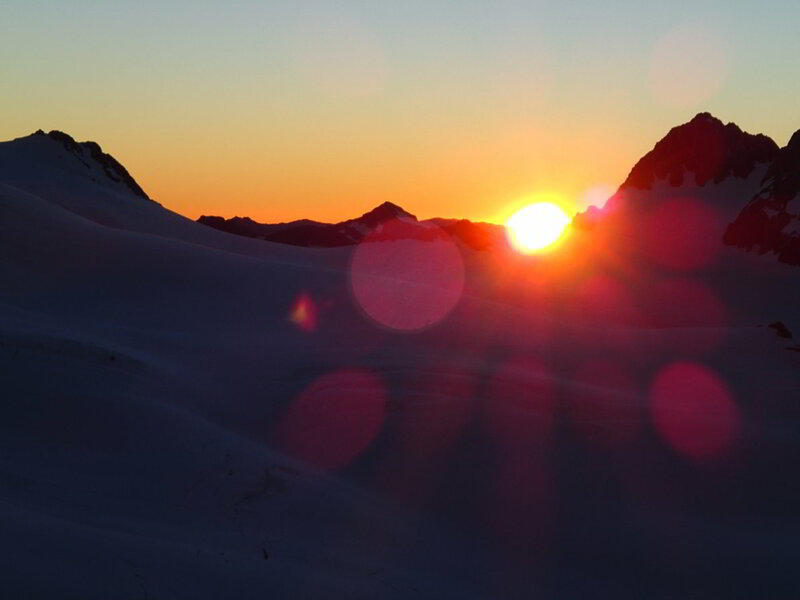 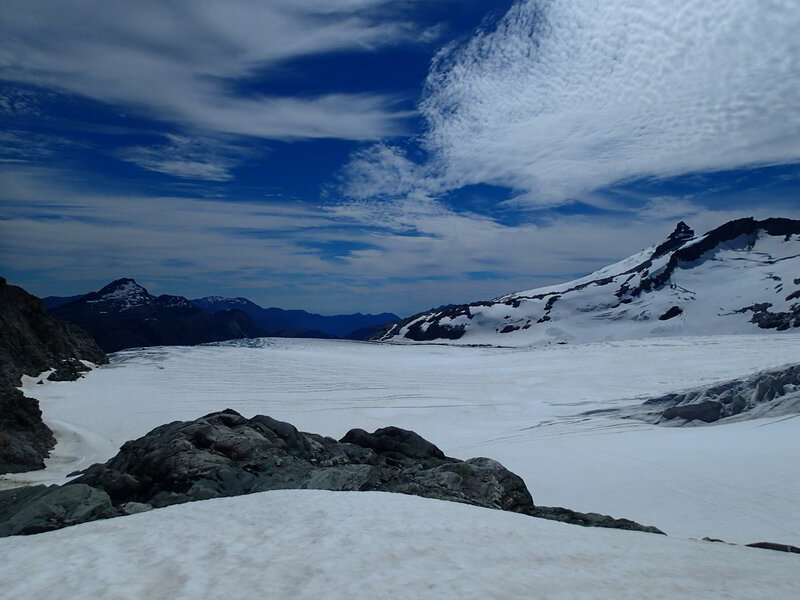 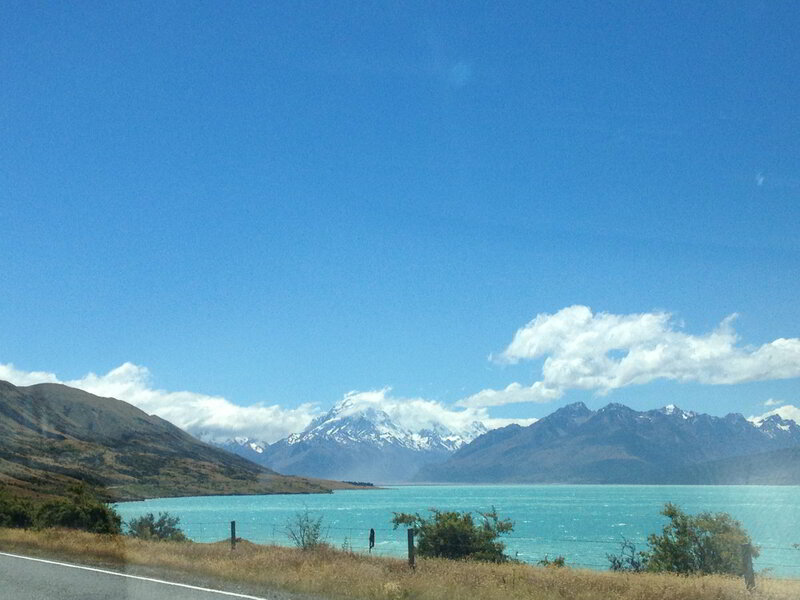 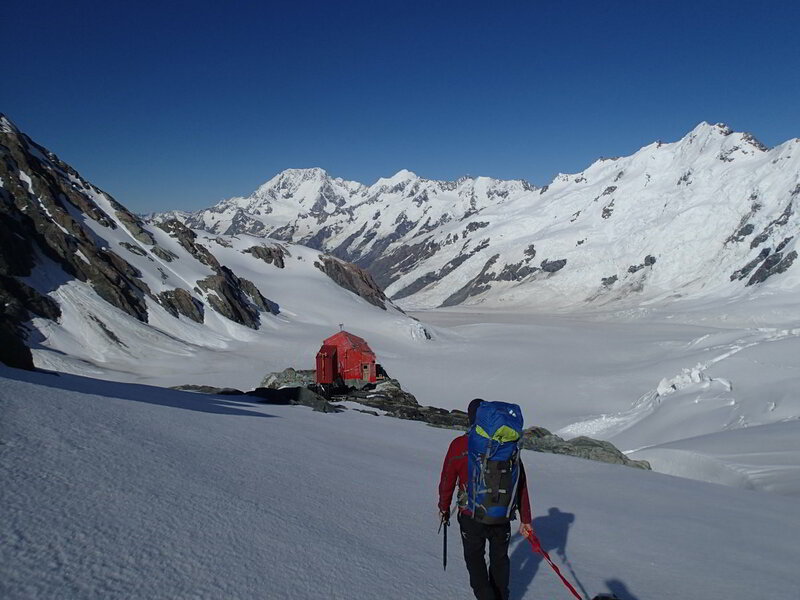 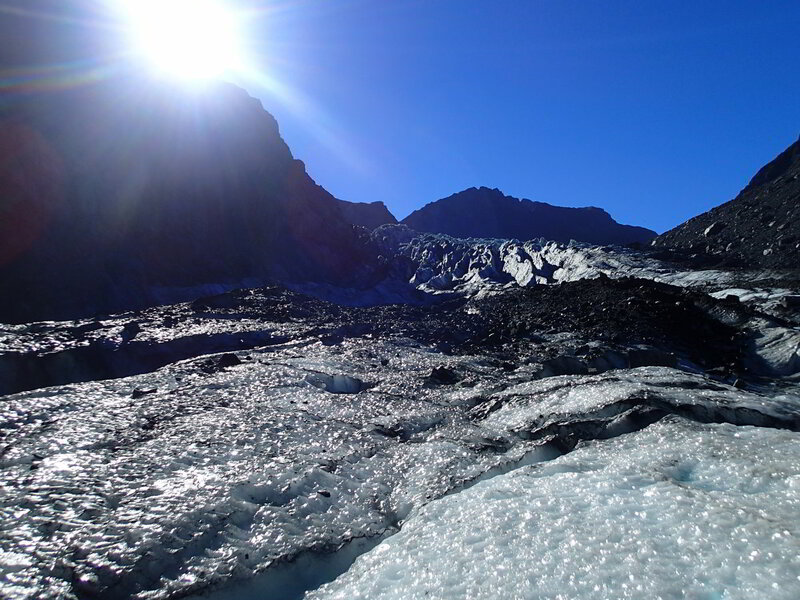 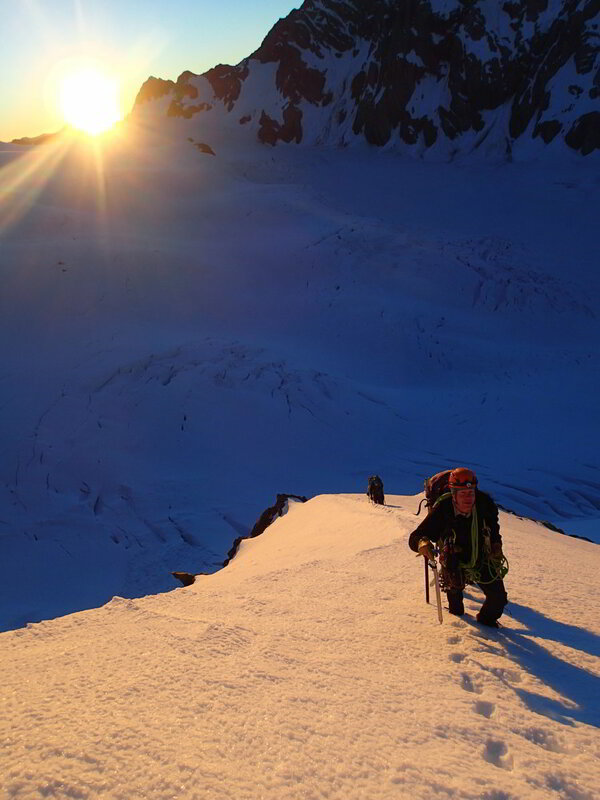 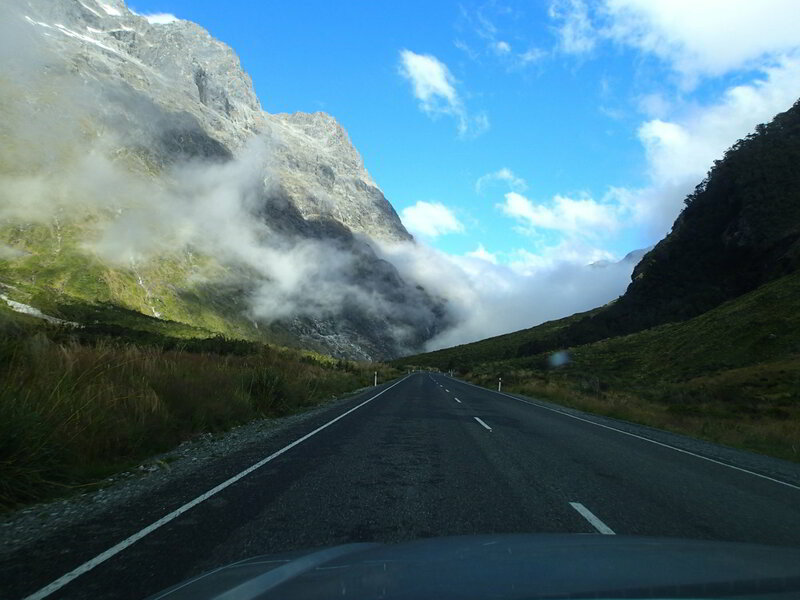 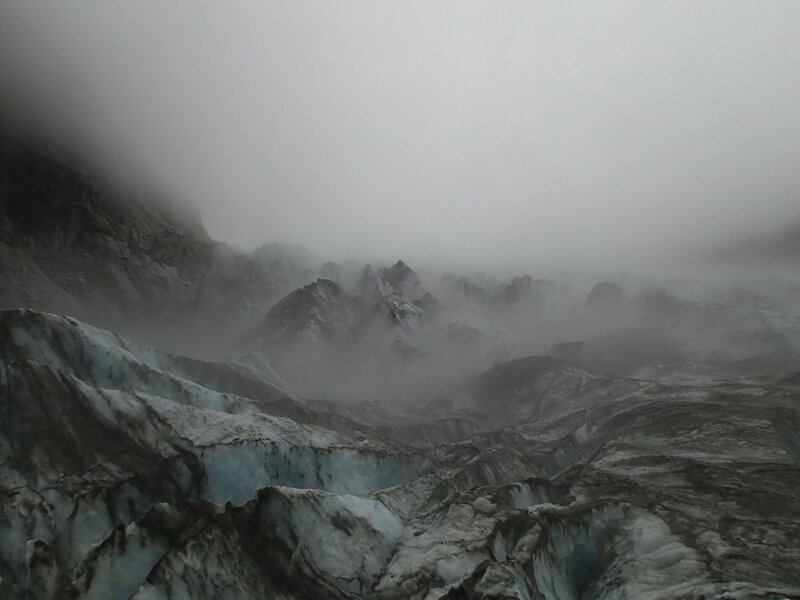 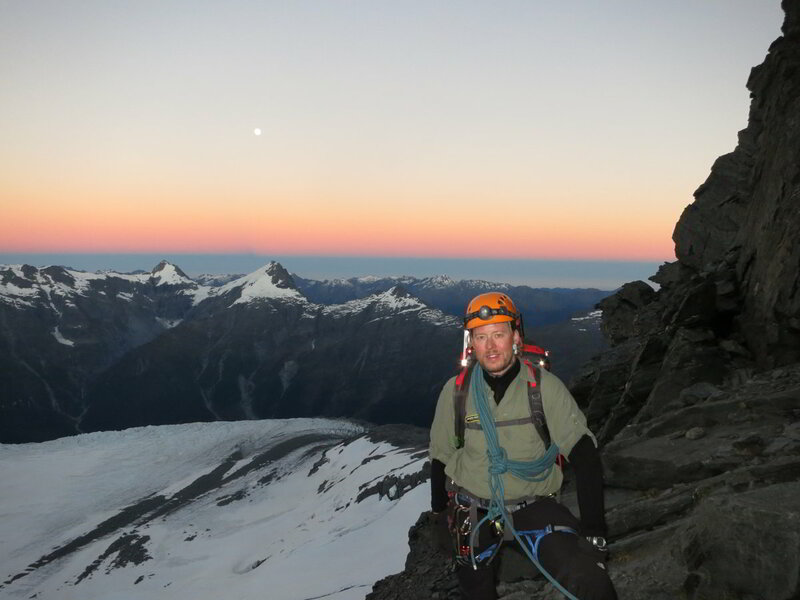 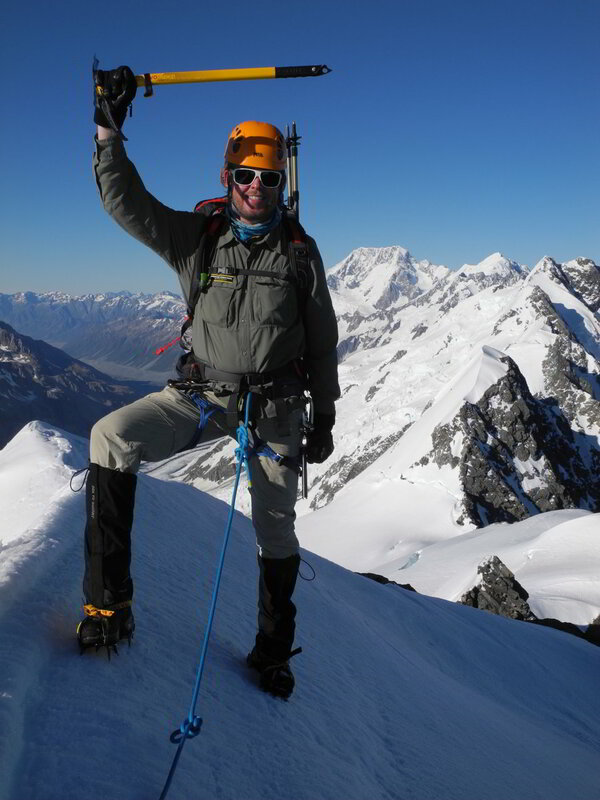 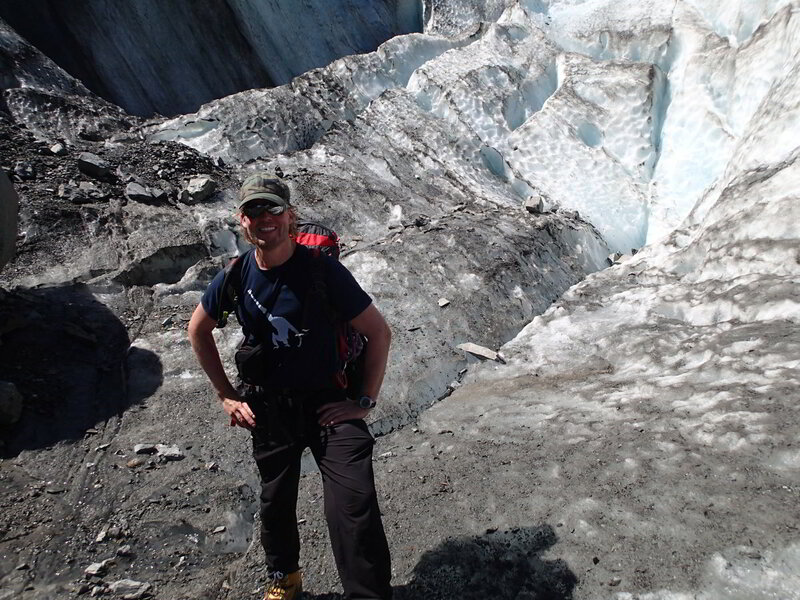 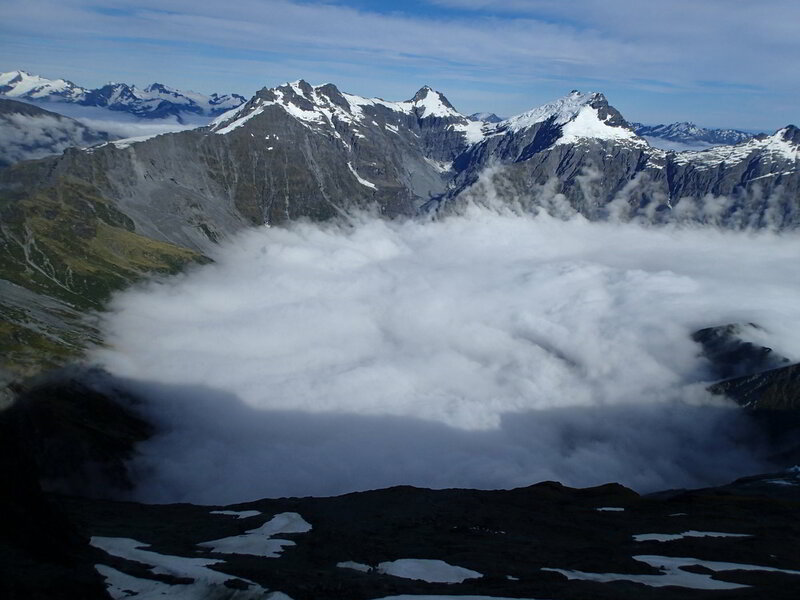 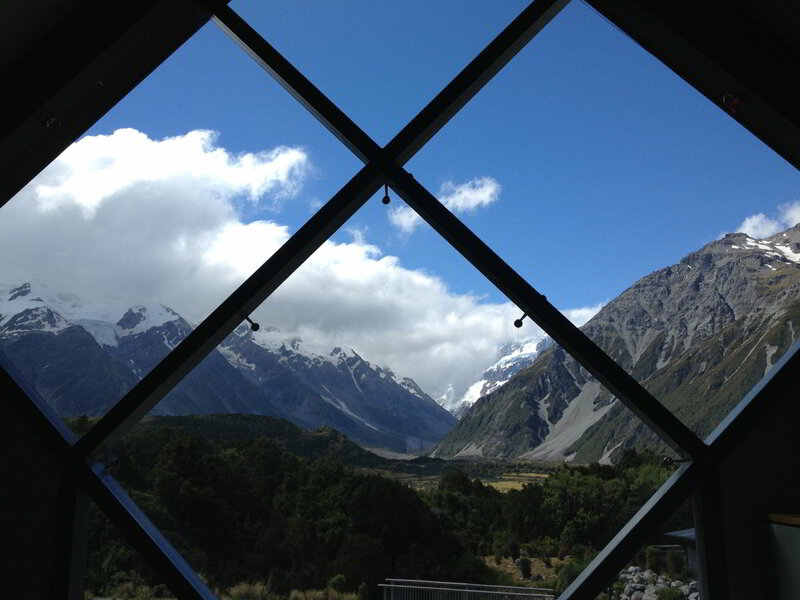 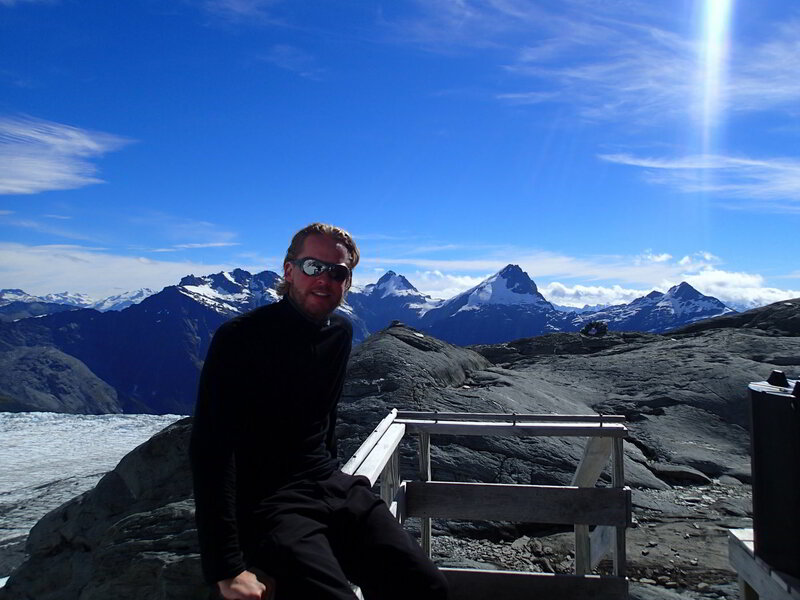 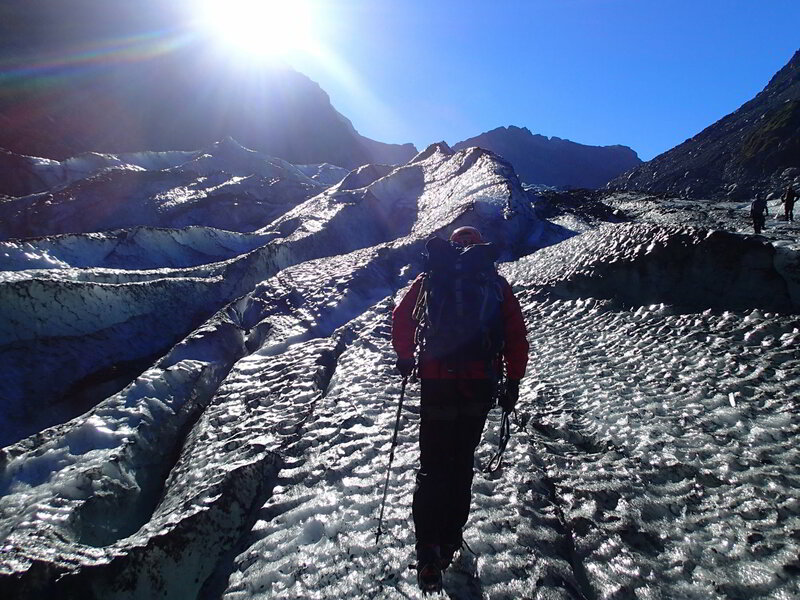 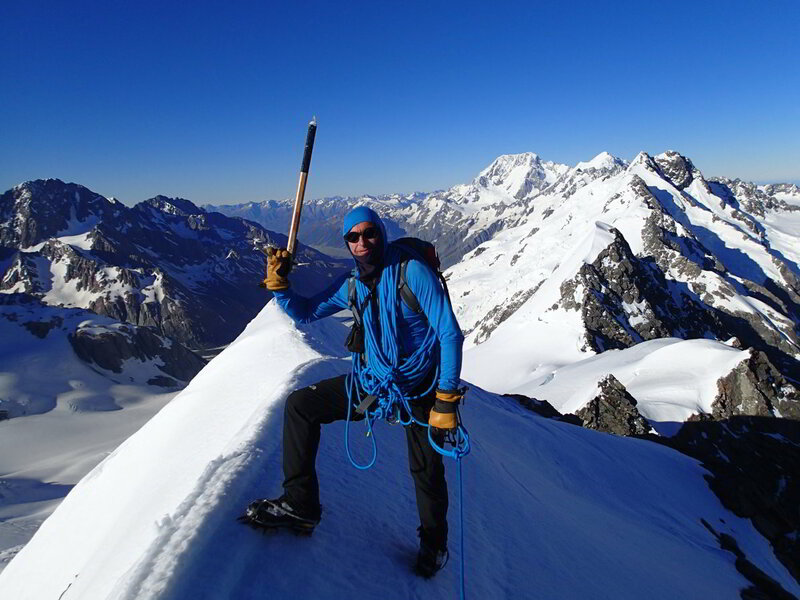 I started off training in the Mount Cook region of New Zealand’s South Island. 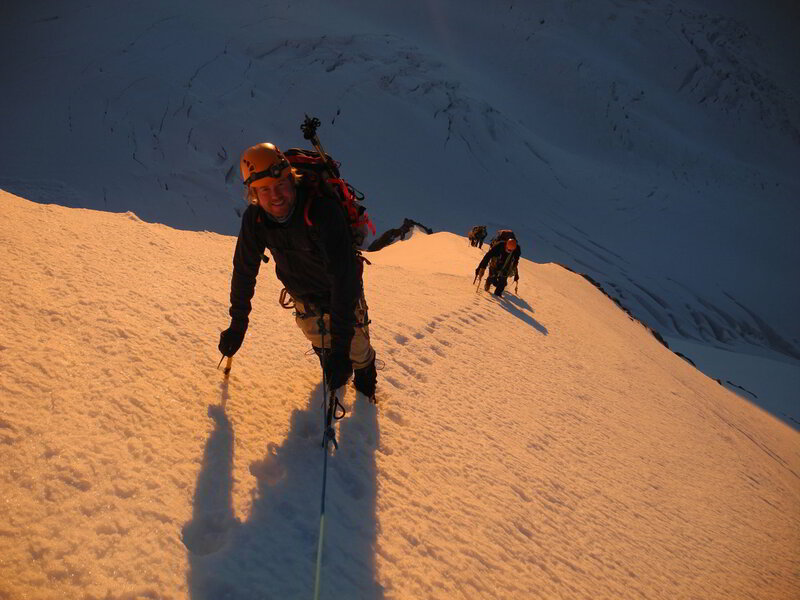 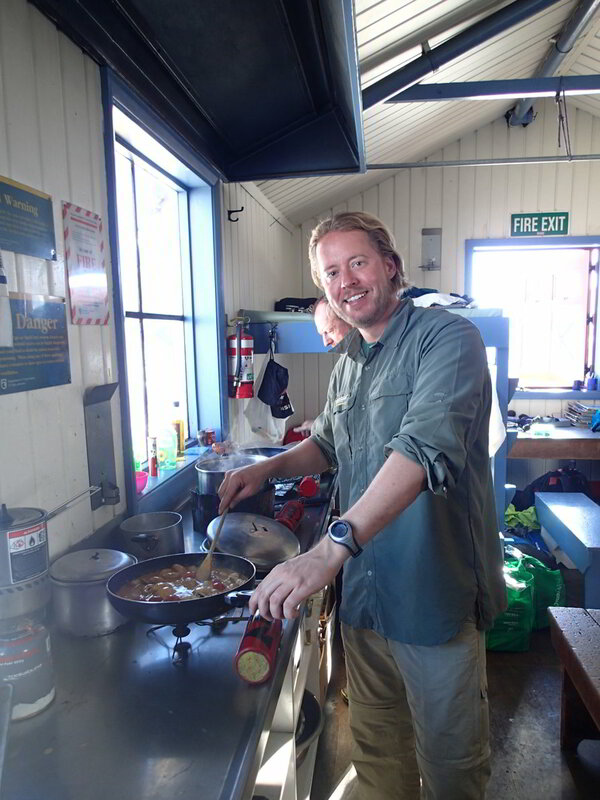 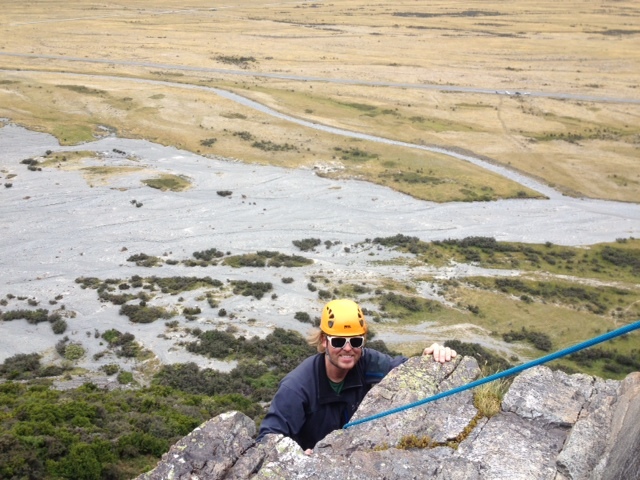 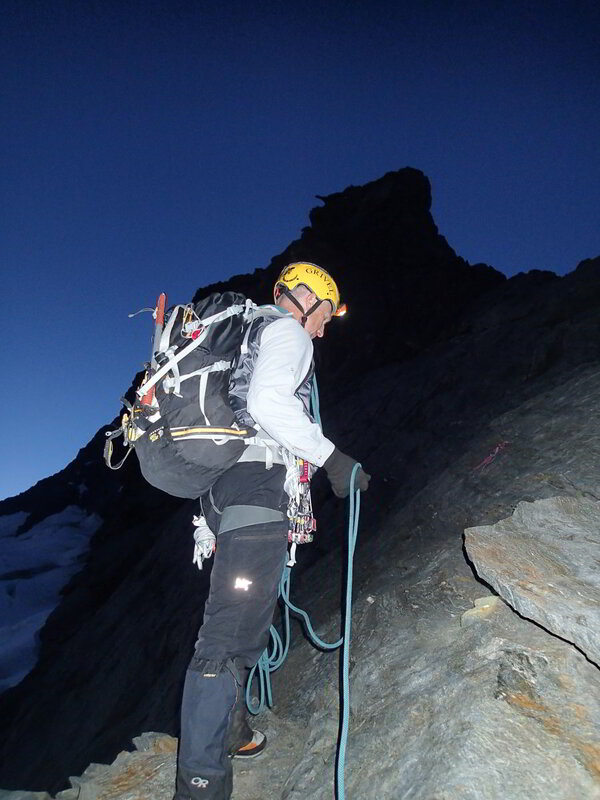 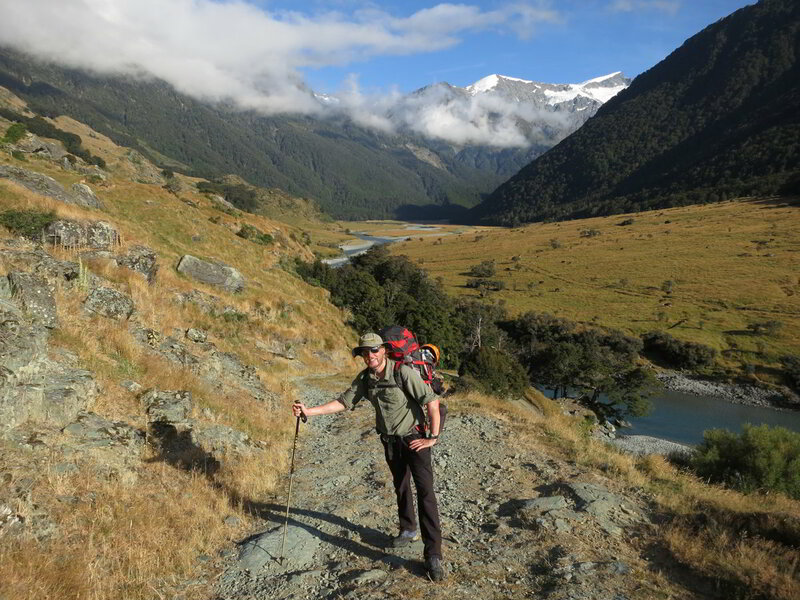 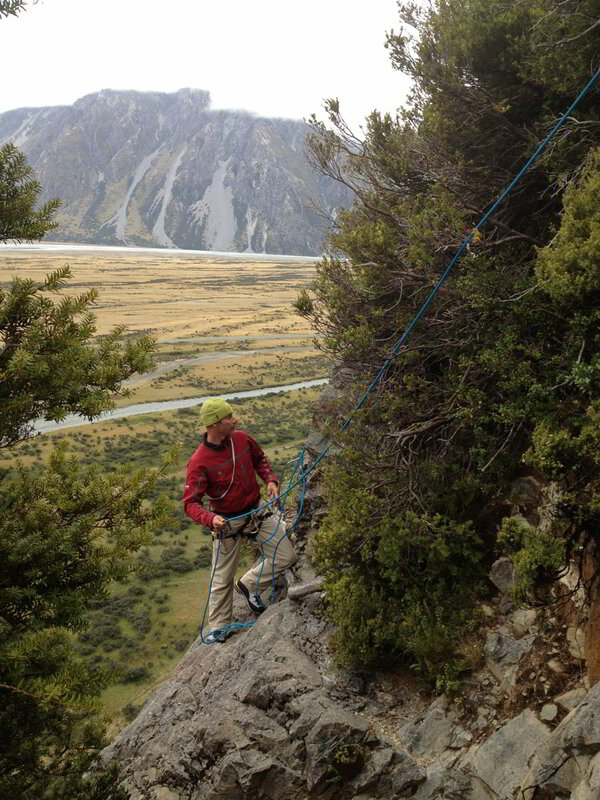 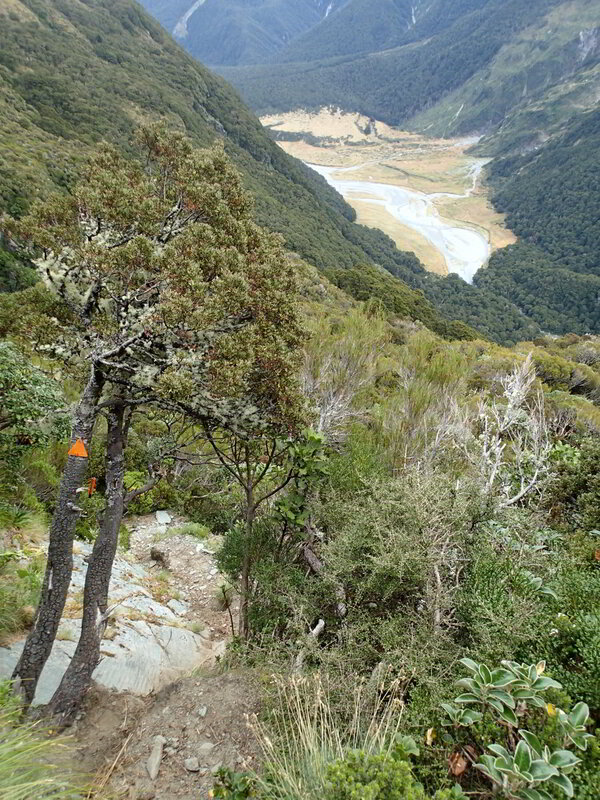 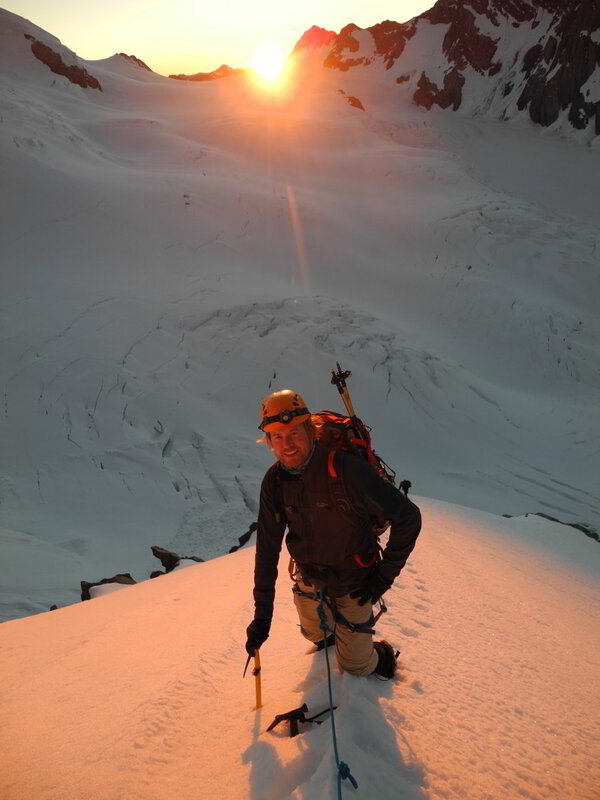 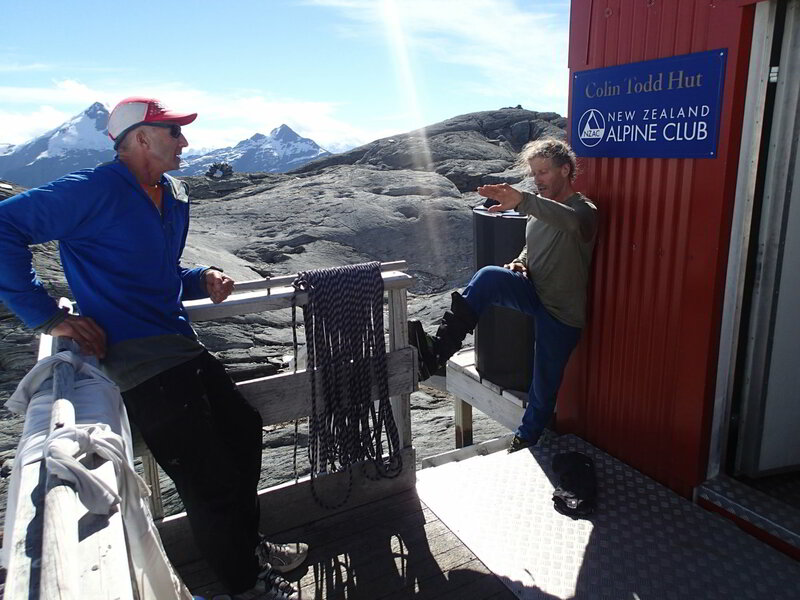 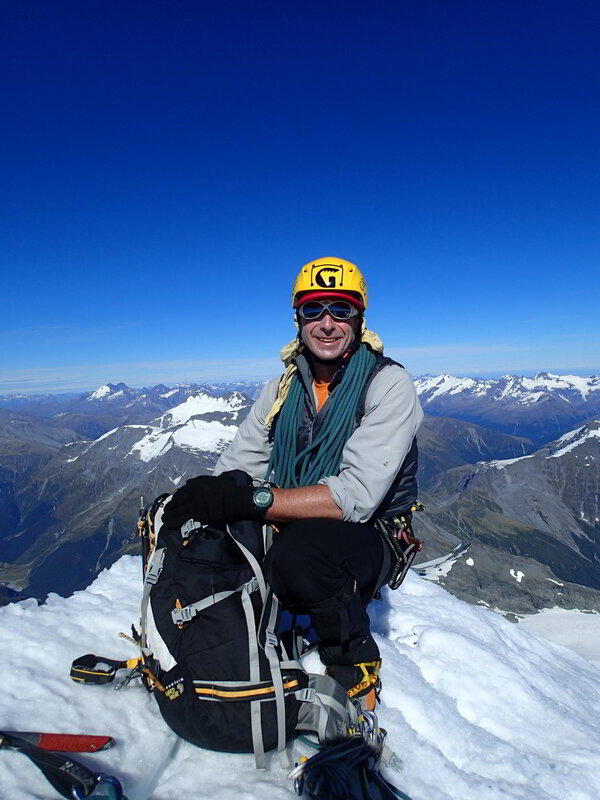 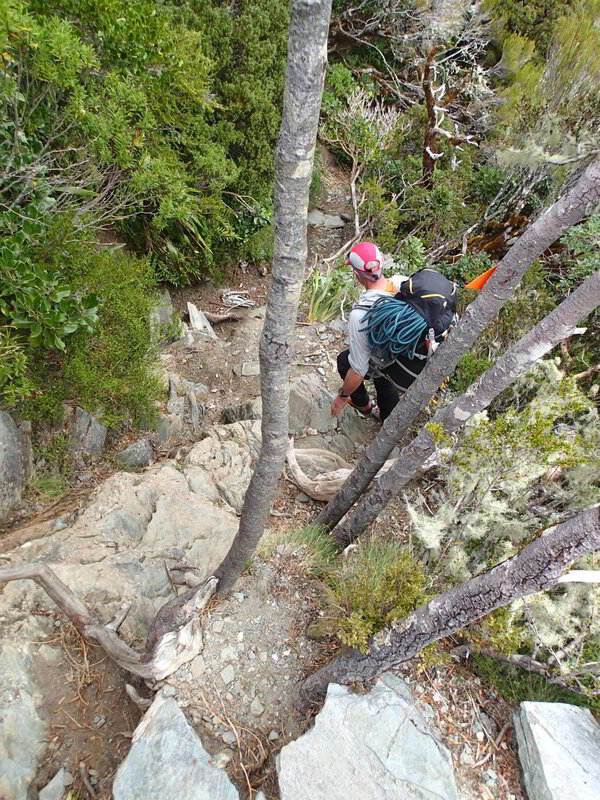 I was training with a very experienced guide, Paul – a Brit – who moved many years ago to Kiwi land. 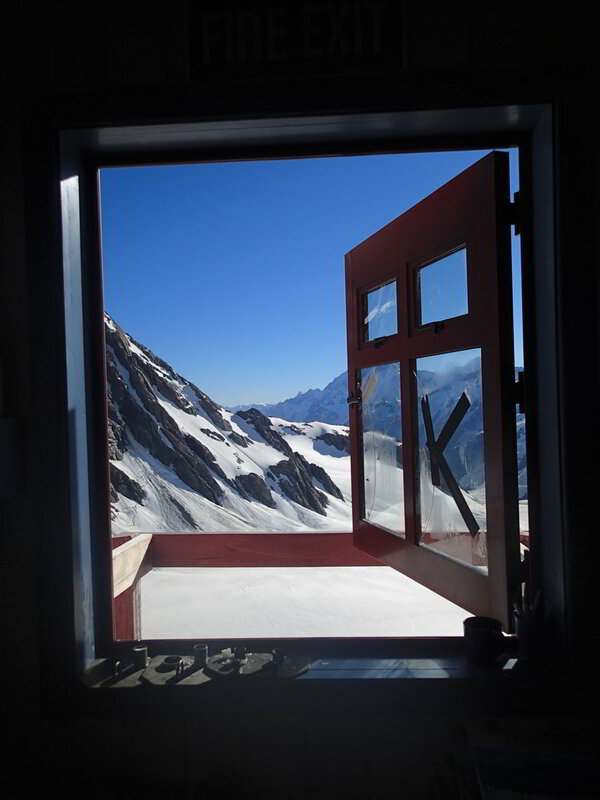 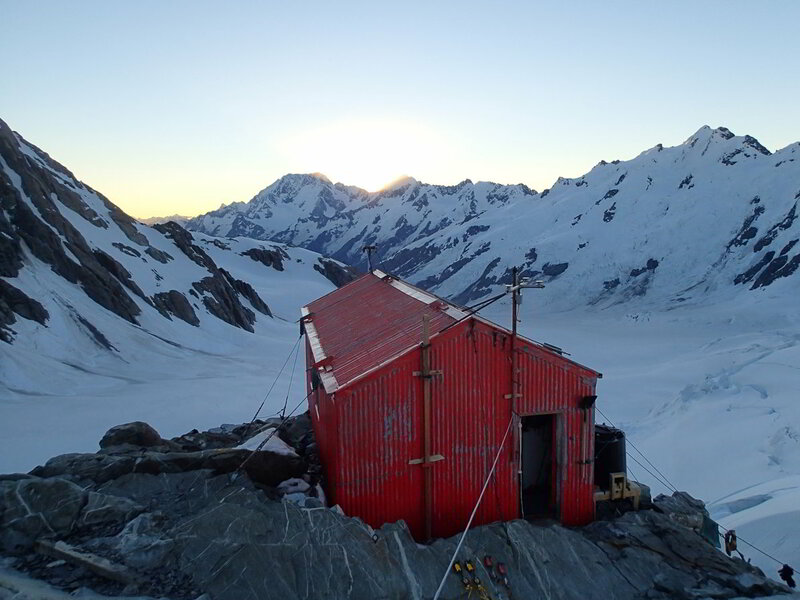 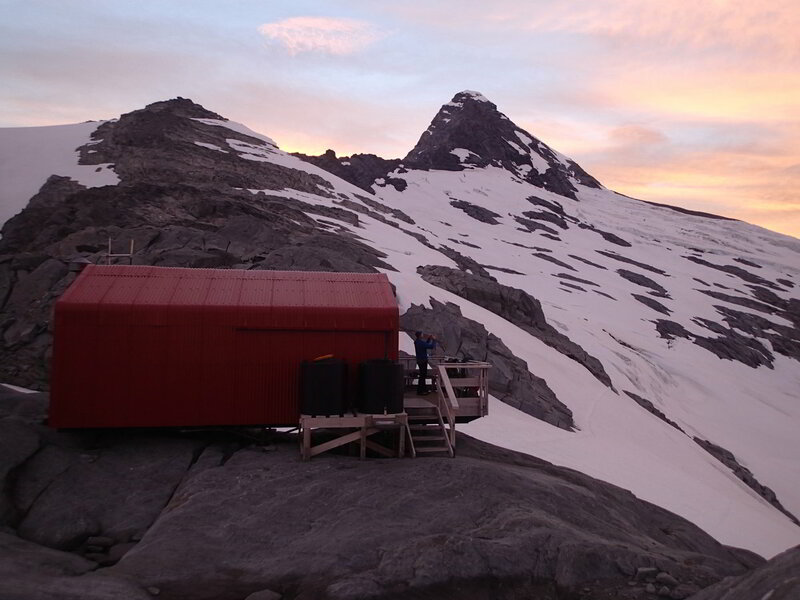 We had a fabulous time in the Tasman Saddle Hut with excellent views of Mt Cook (New Zealand’s highest peak), which offered particularly stunning views in the sunset. 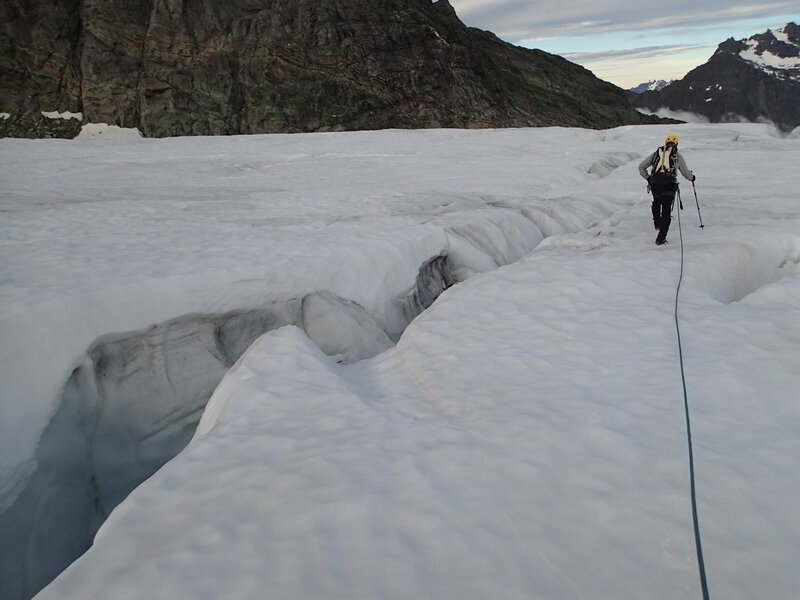 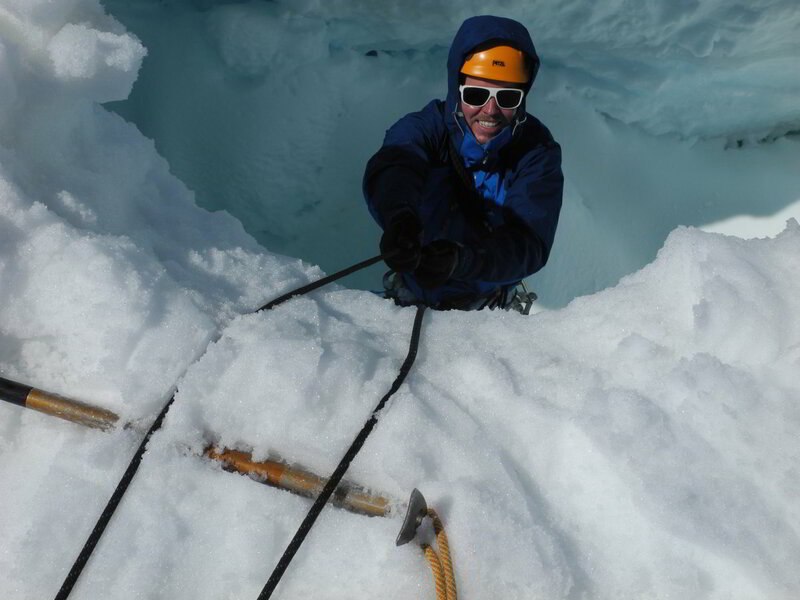 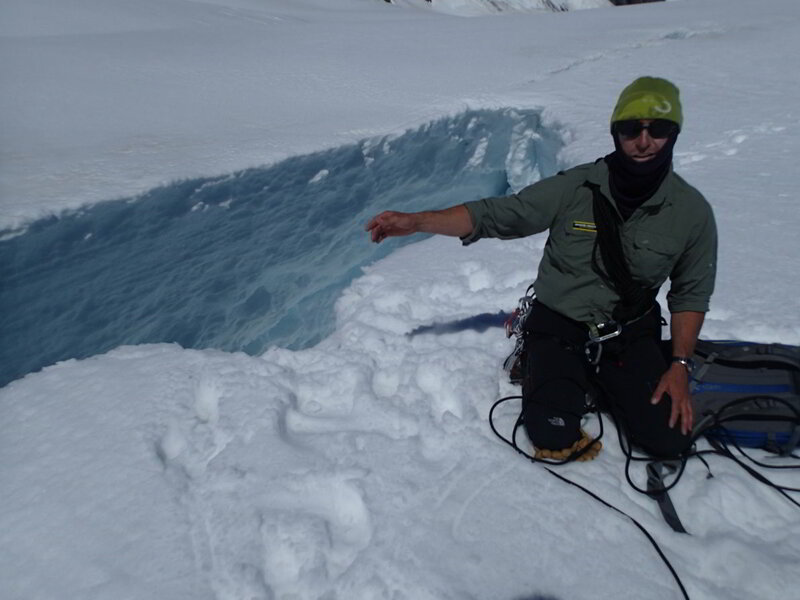 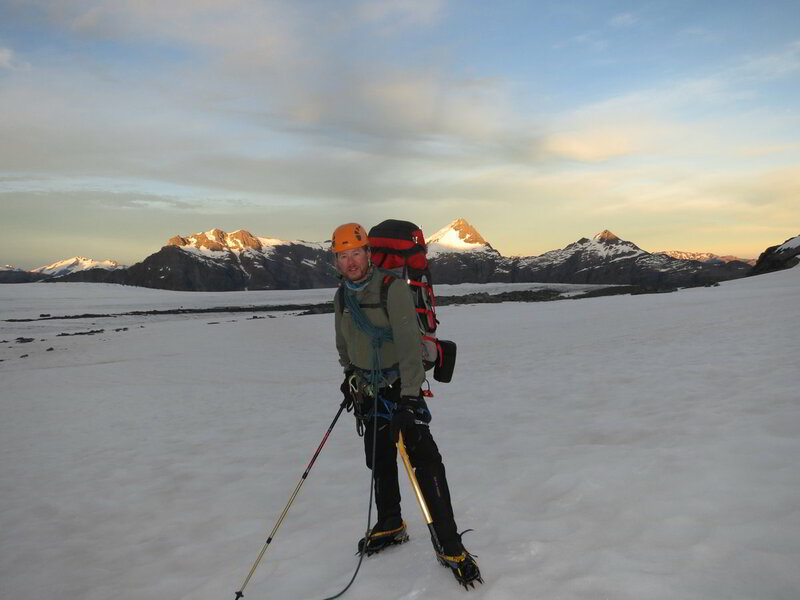 Paul started off by lowering me down into a huge glacier crevasse – my initial reaction was “Jeez, this guy can’t like me much!” But the purpose was to practice crevasse rescue. 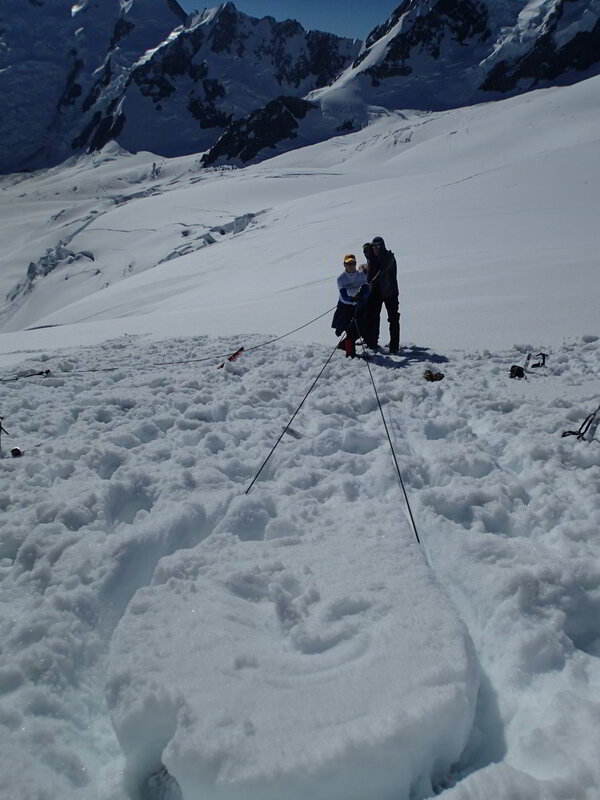 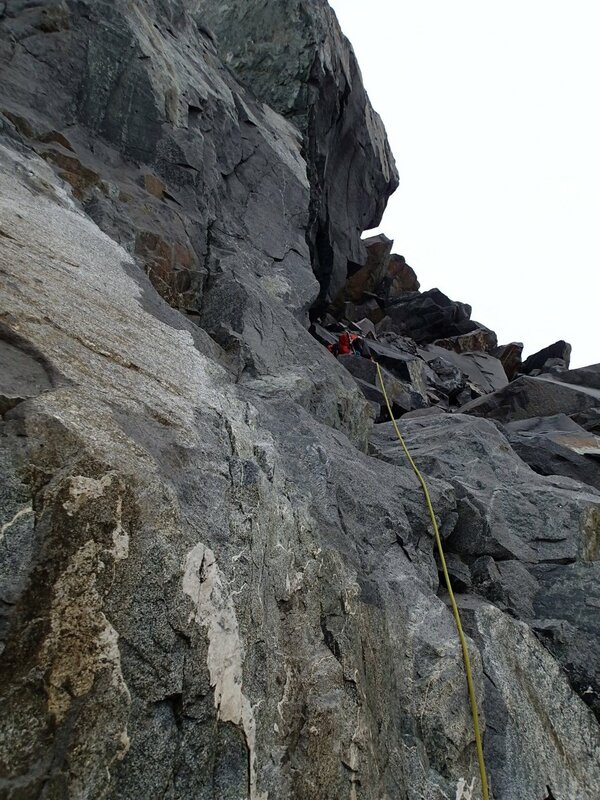 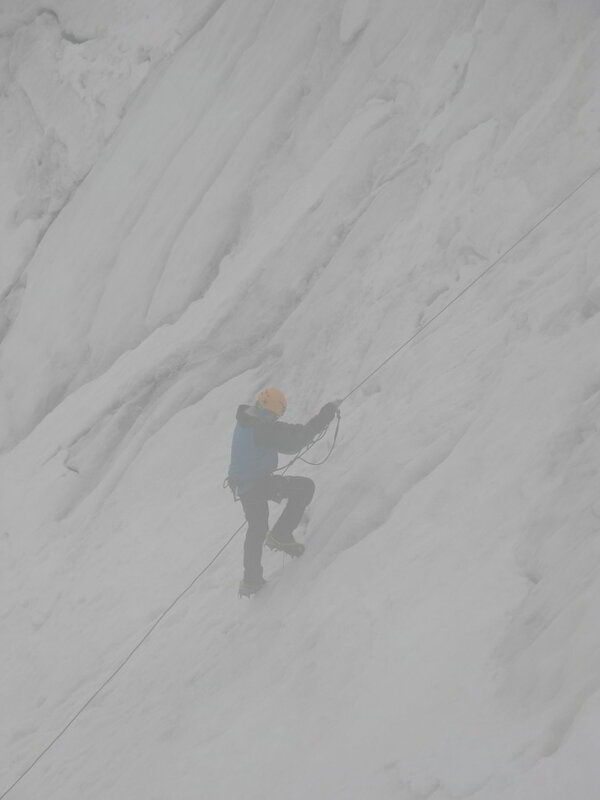 We worked on several technical skills such as creating snow anchors, belaying techniques, ascending fixed ropes using a jumar/mechanical ascender, and rope skills. 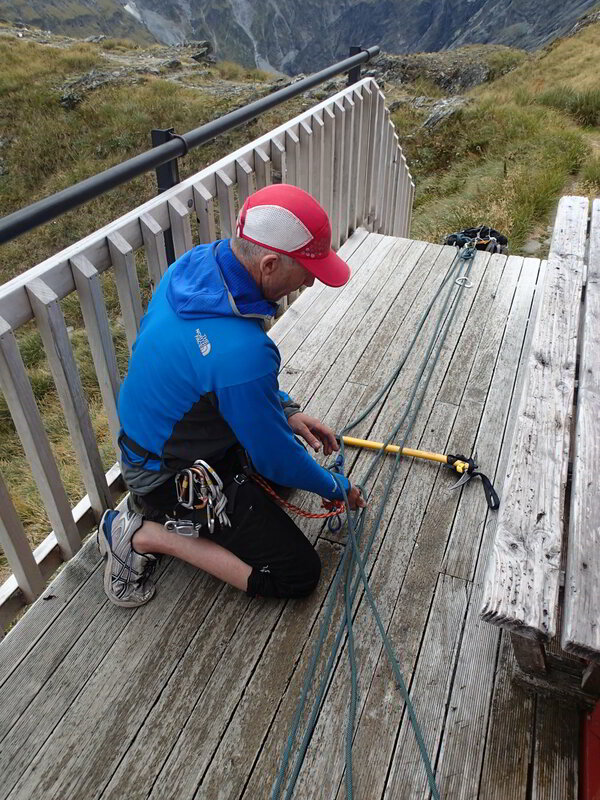 Paul immediately gave me thumbs up for my ability to learn knots and how to handle the rope in general – and I explained that this was because as kids me and my sisters grew up on sailing boats where we spent most of our summers, and our dad had an obsessive-compulsive disorder (haha) when it came to making perfect knots – and folding / laying down / assembling the rope to military perfection, and any imperfect knot/rope assembly by us kids would upon inspection have to be remade in a perfect manner. 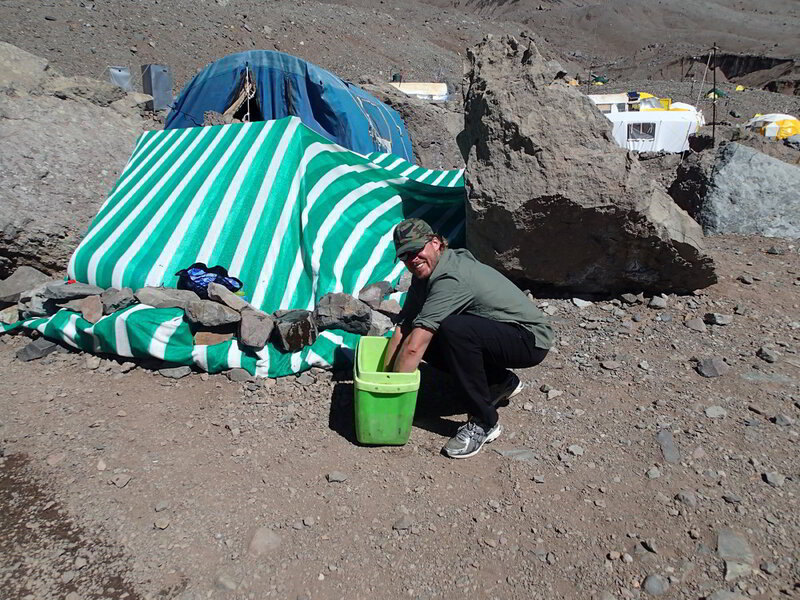 As painful as it was back then, I guess I should say “Thank you Dad” now! 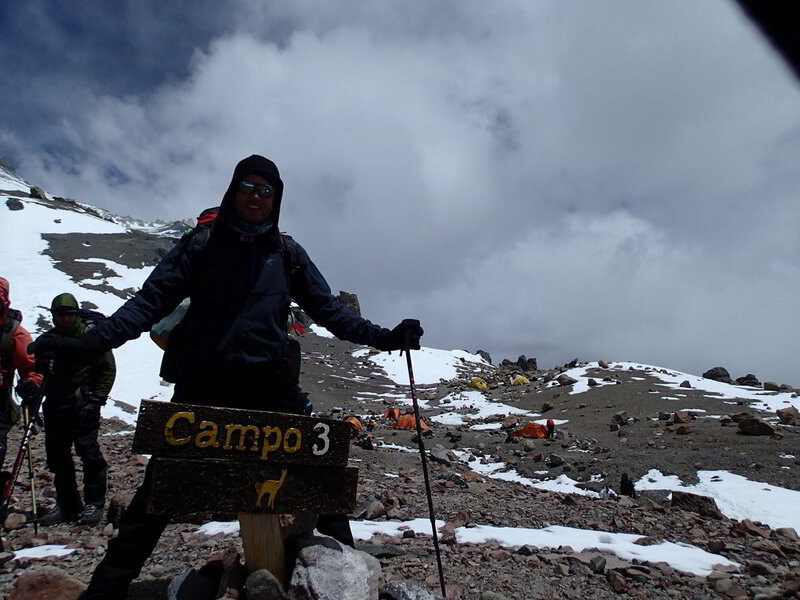 Aconcagua at 6,962m is the highest mountain in South America (and thereby one of the “Seven Summits of the World”), and the highest mountain outside the Himalayas/Karakoram. 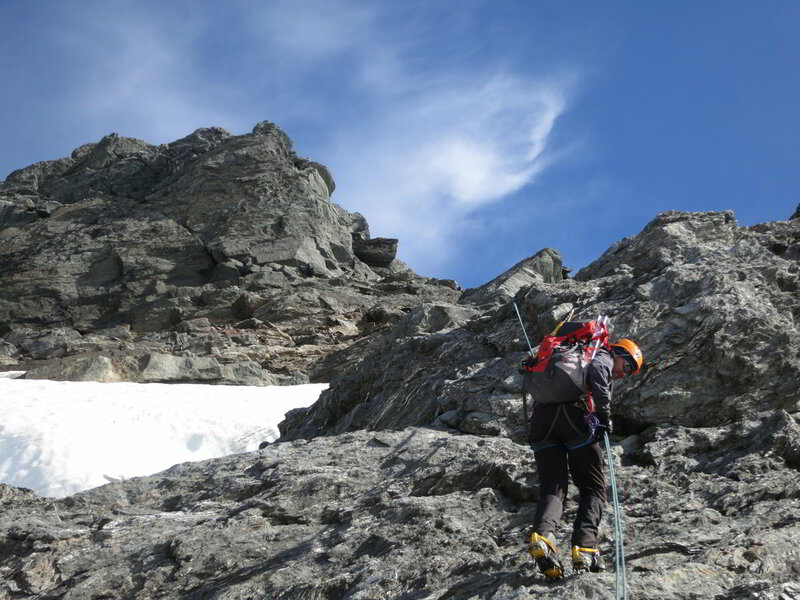 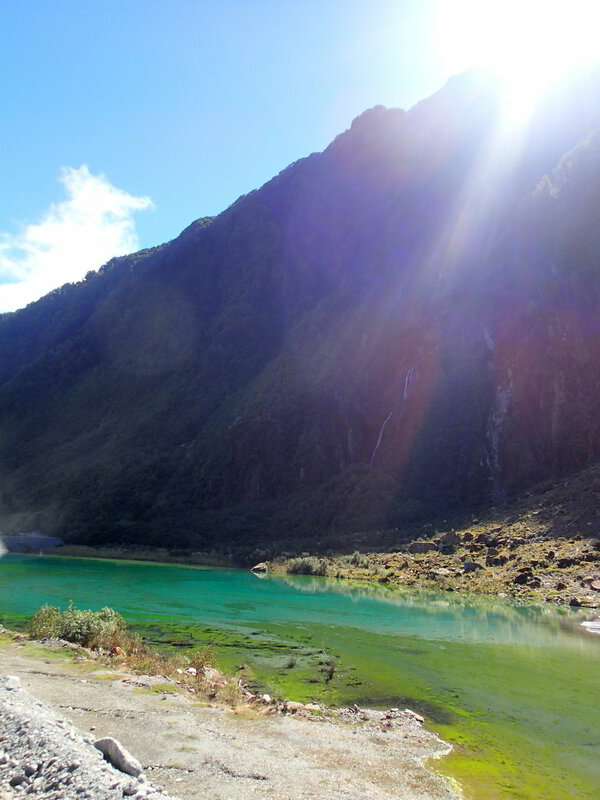 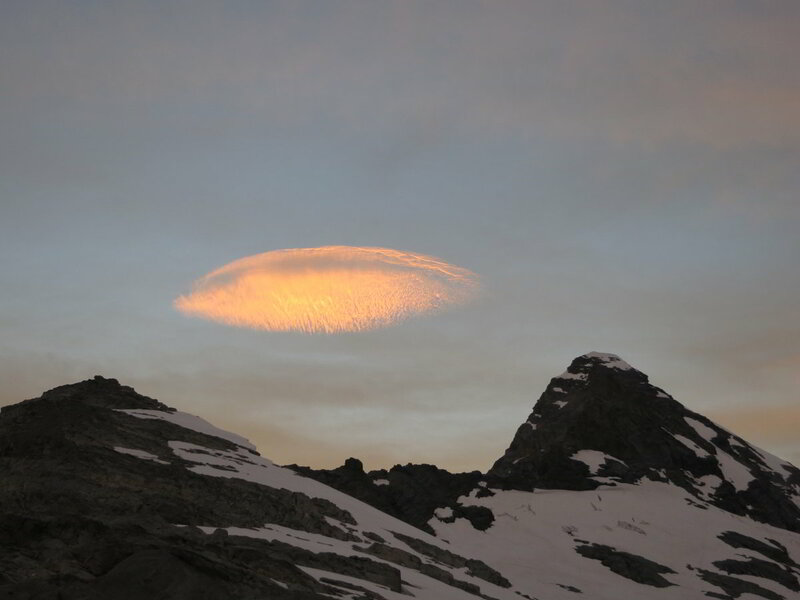 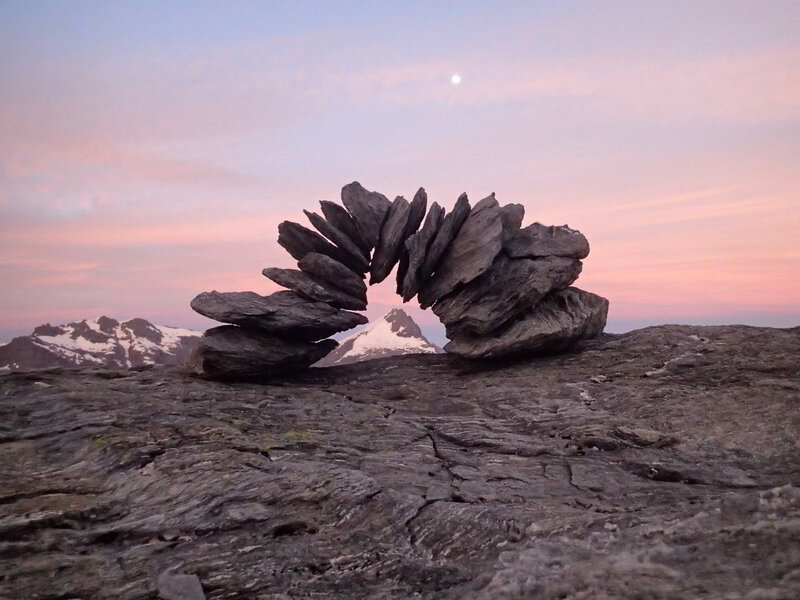 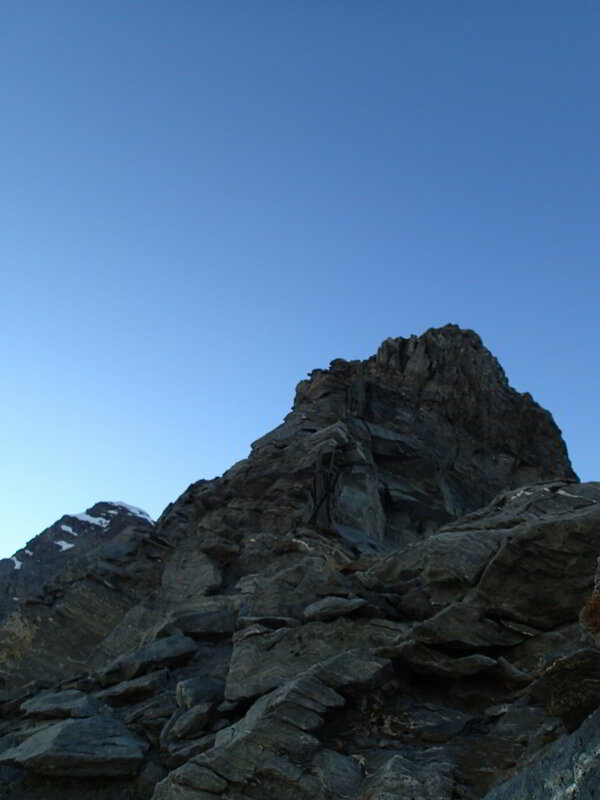 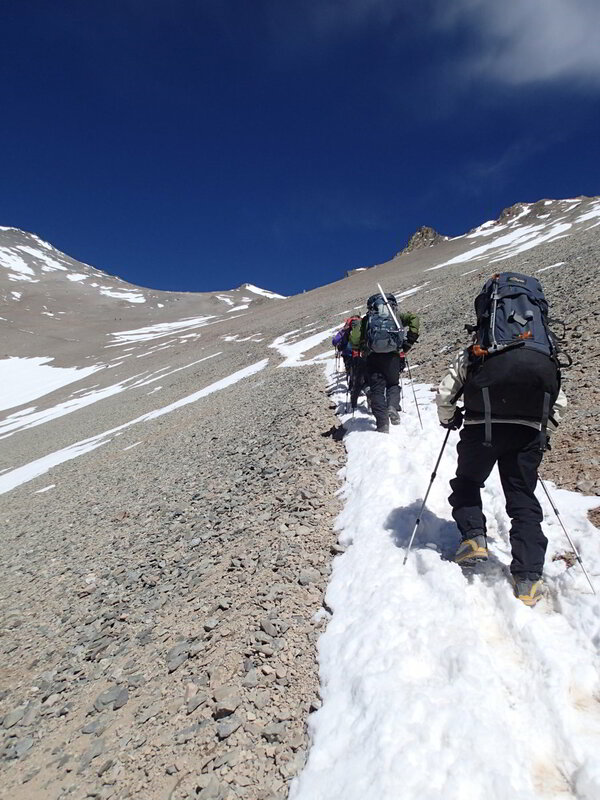 It is often used as a stepping stone for climbers towards the 8,000+ meter peaks and a test of how one is physically able to cope with altitude. 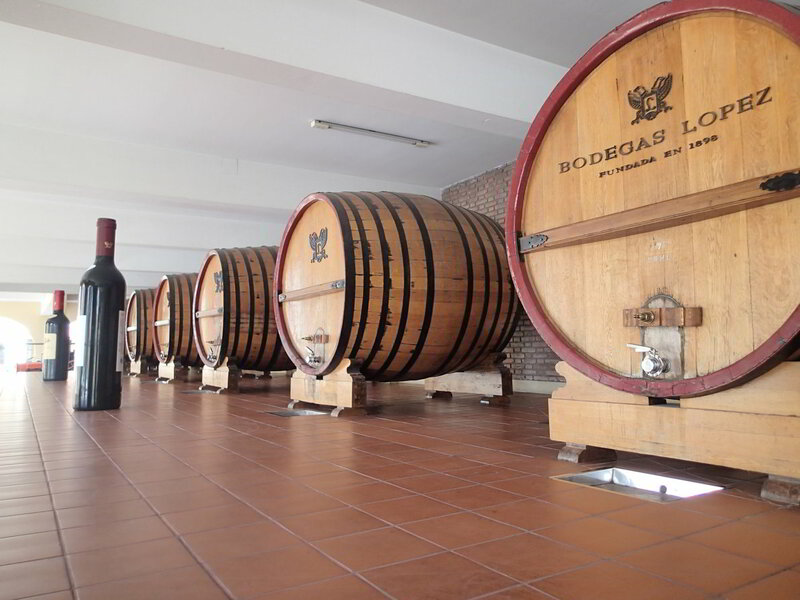 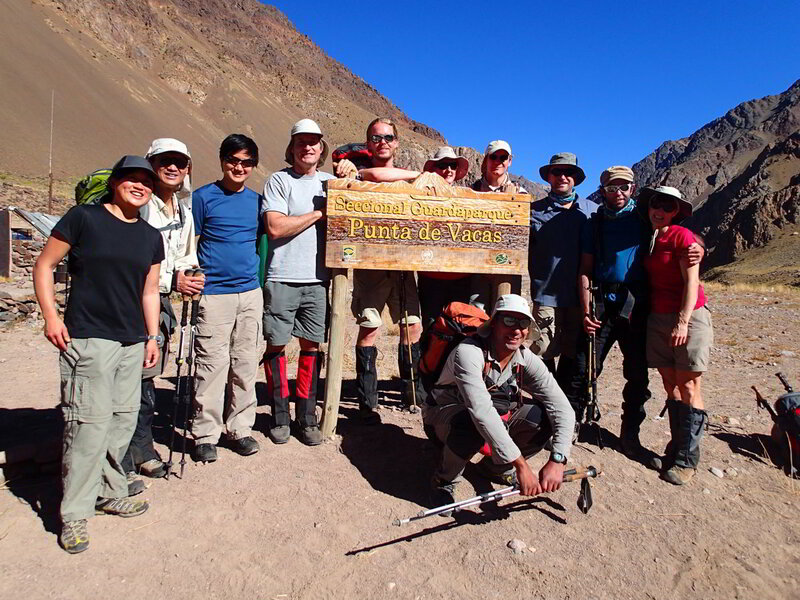 I joined a group of nine climbers gathering in the Argentinian town of Mendoza. 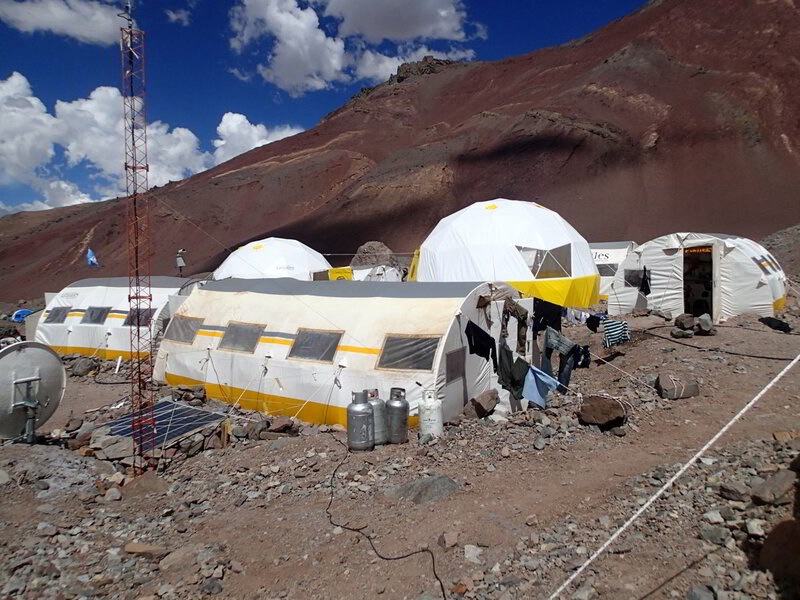 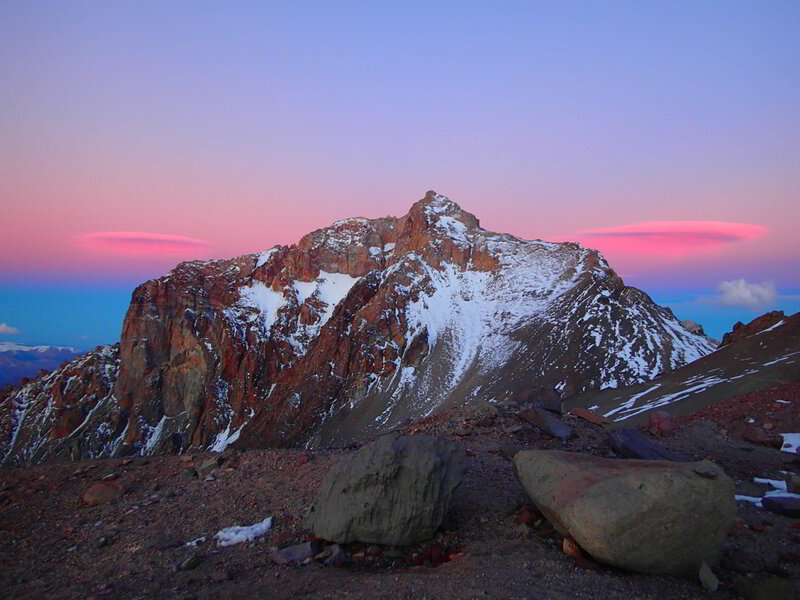 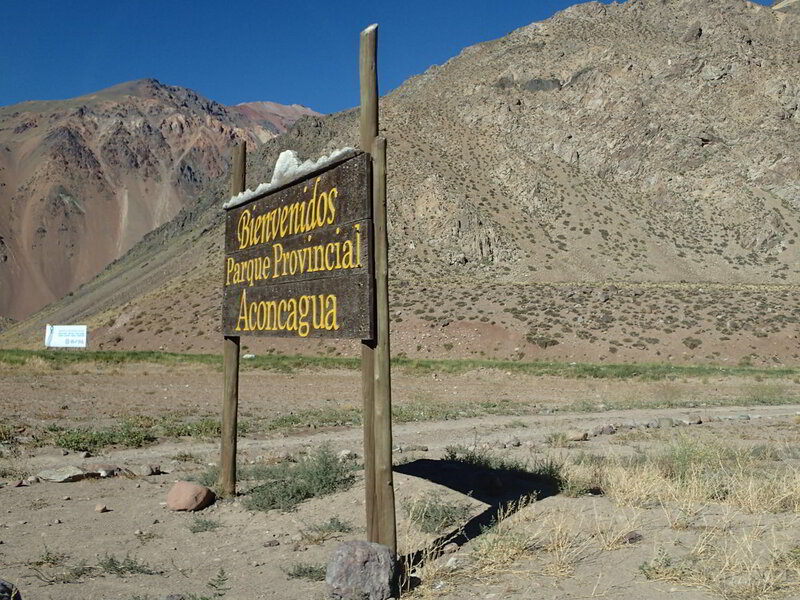 Aconcagua is situated just on the Argentinian side of the Argentina/Chile border. 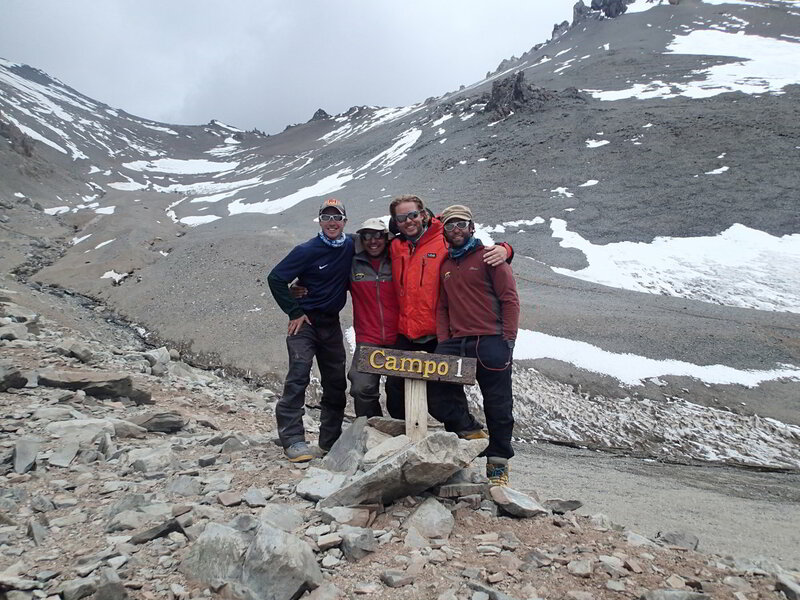 We had three great guides, Matias (Chilean), Leo and Nanika (both Argentinians). 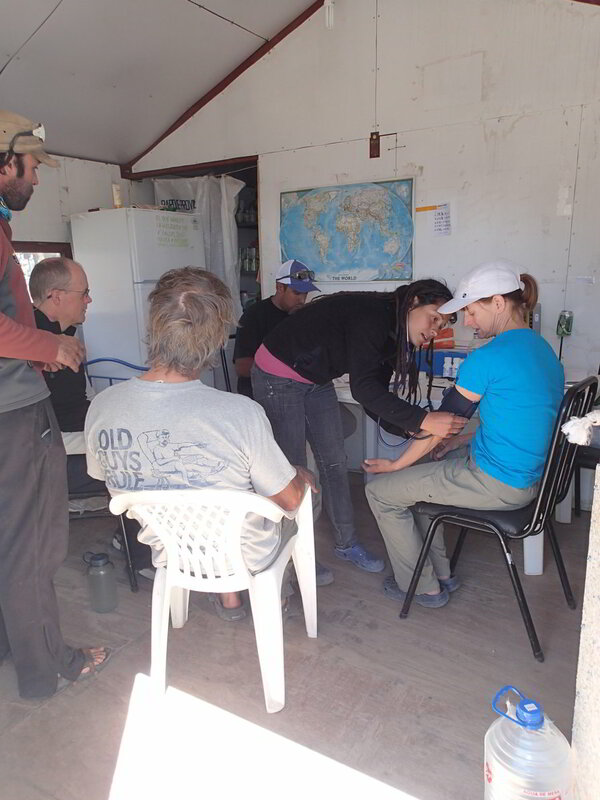 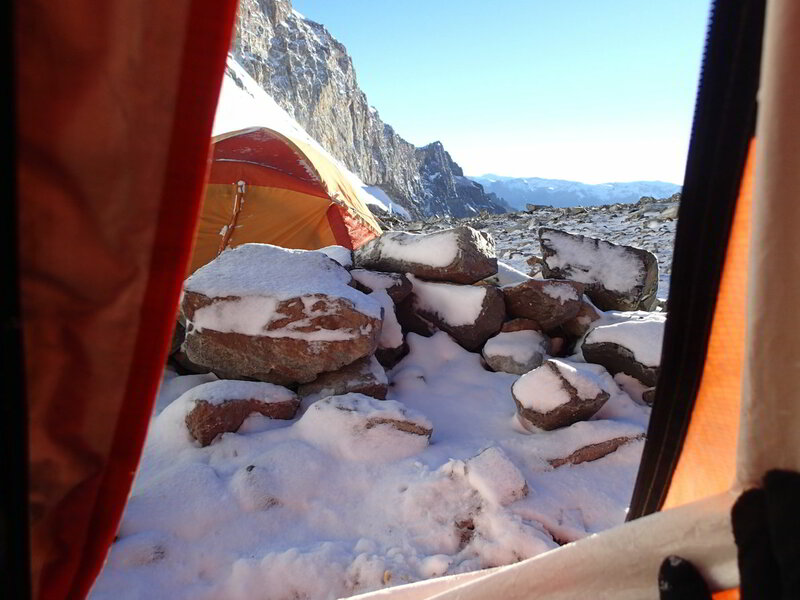 The trip was three weeks long, with two weeks on the mountain staying in a tent. 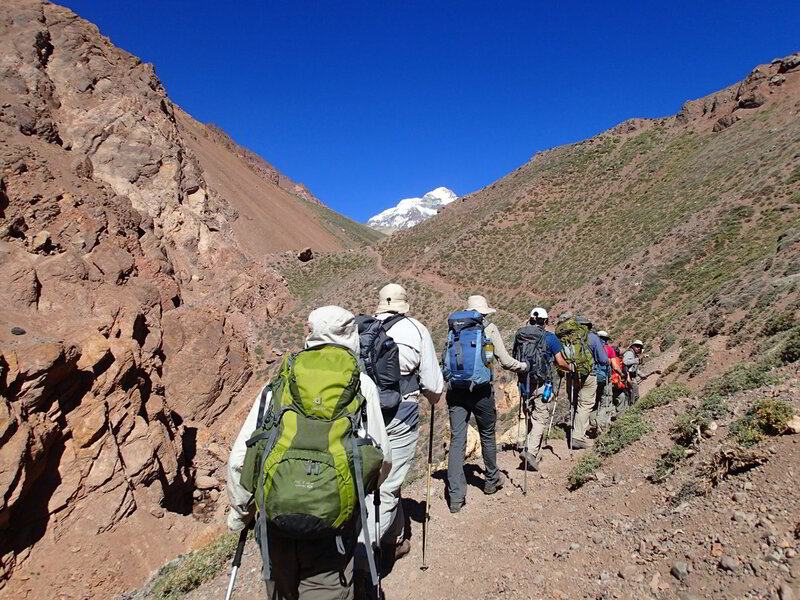 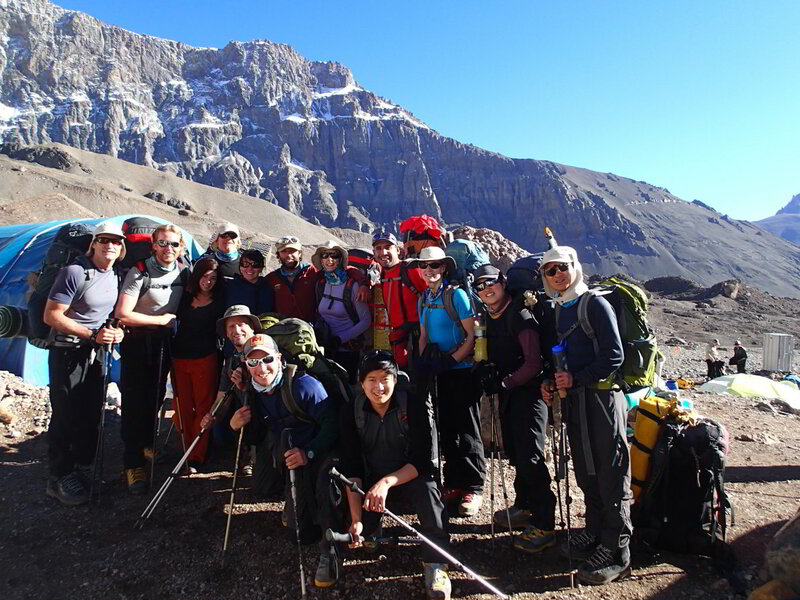 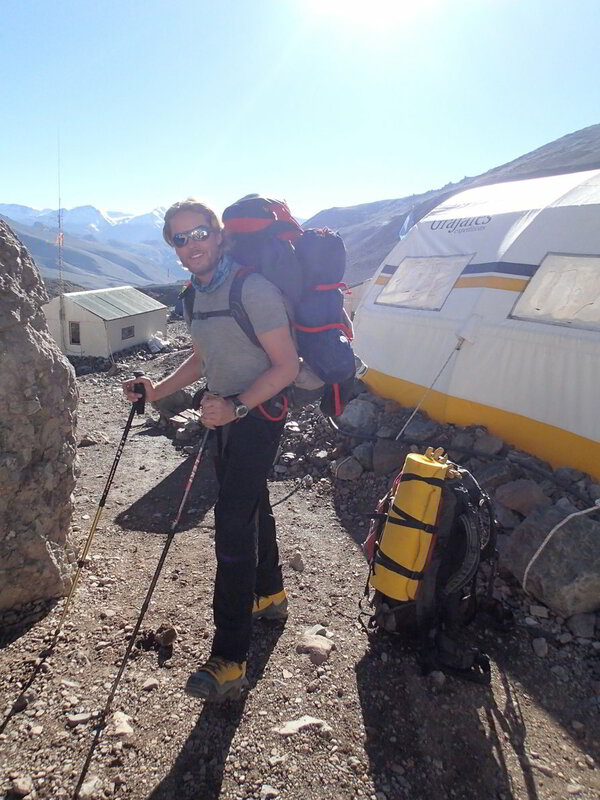 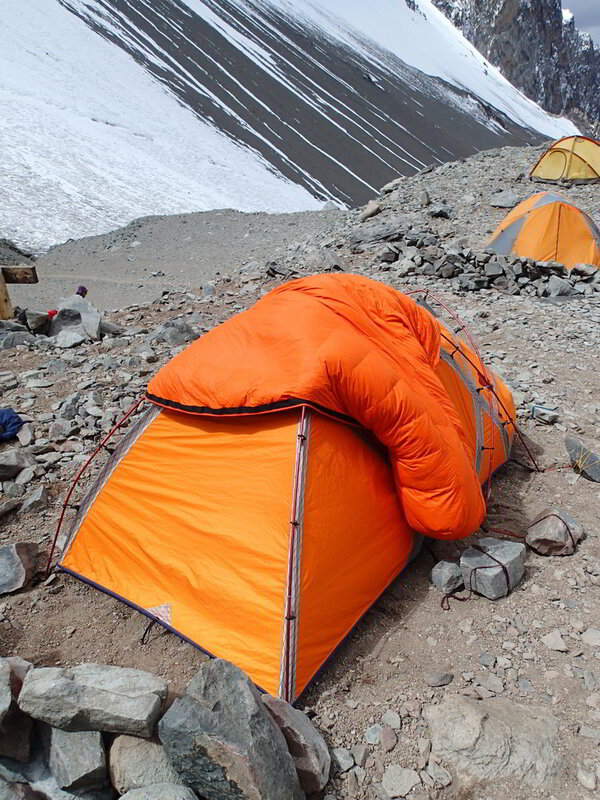 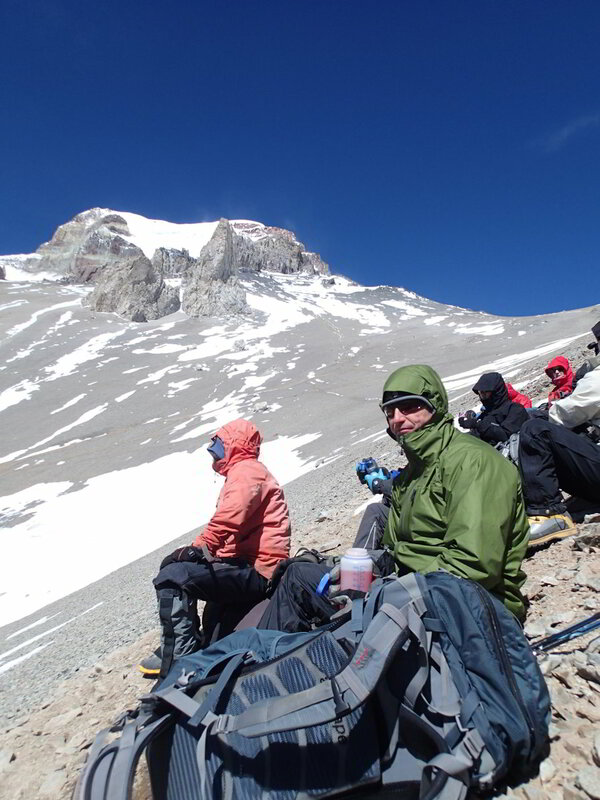 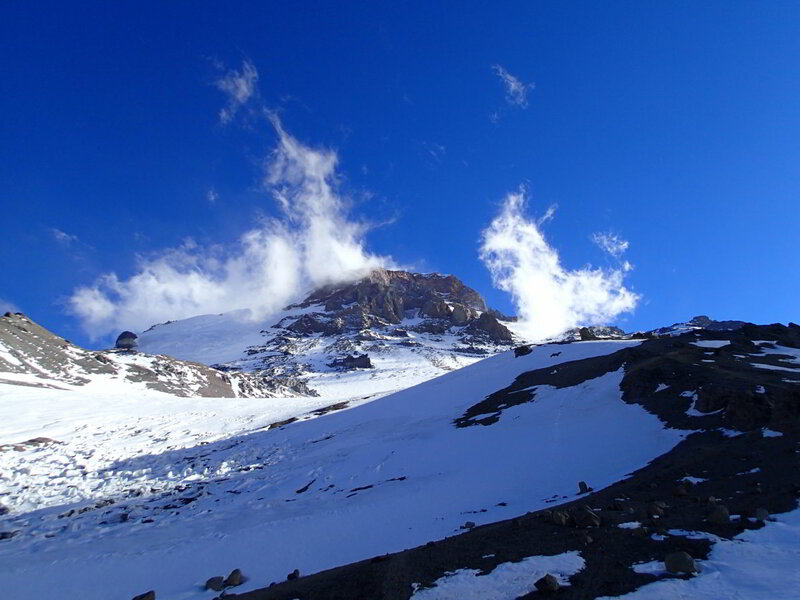 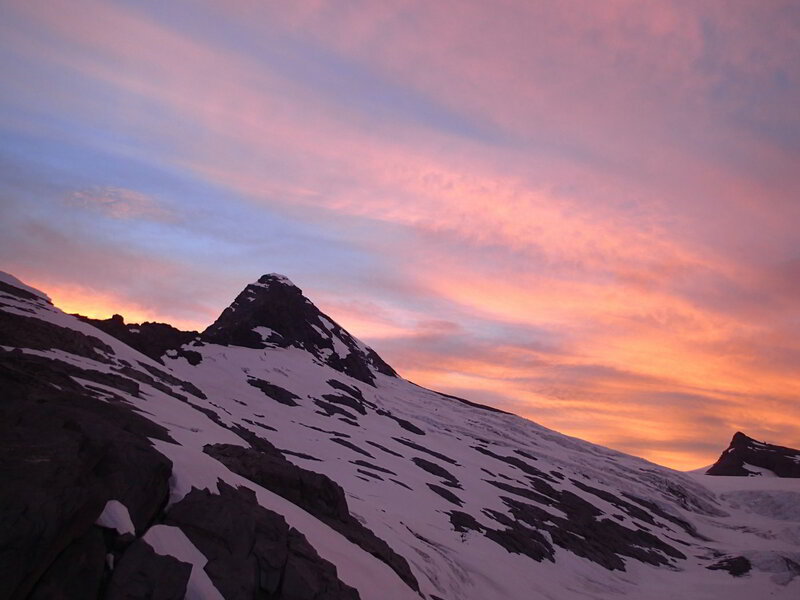 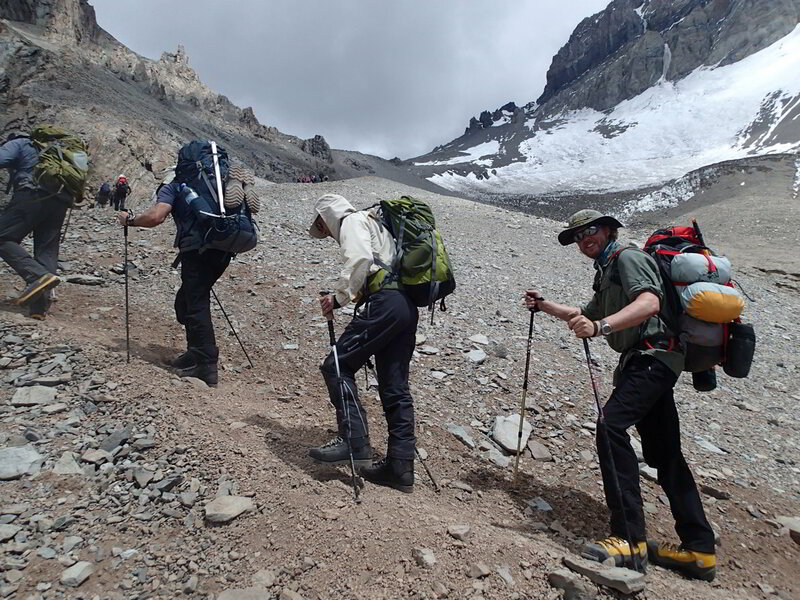 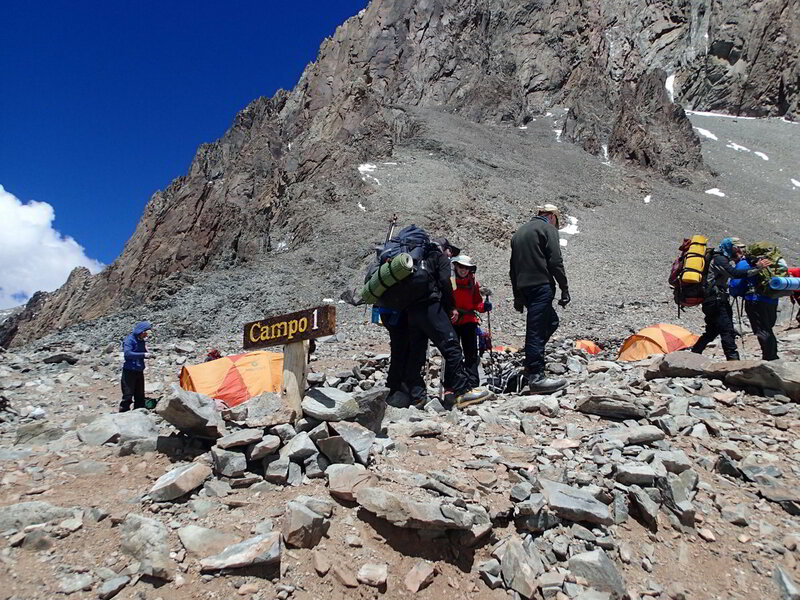 Aconcagua is more like a high altitude (very challenging) trek, rather than technical climbing. 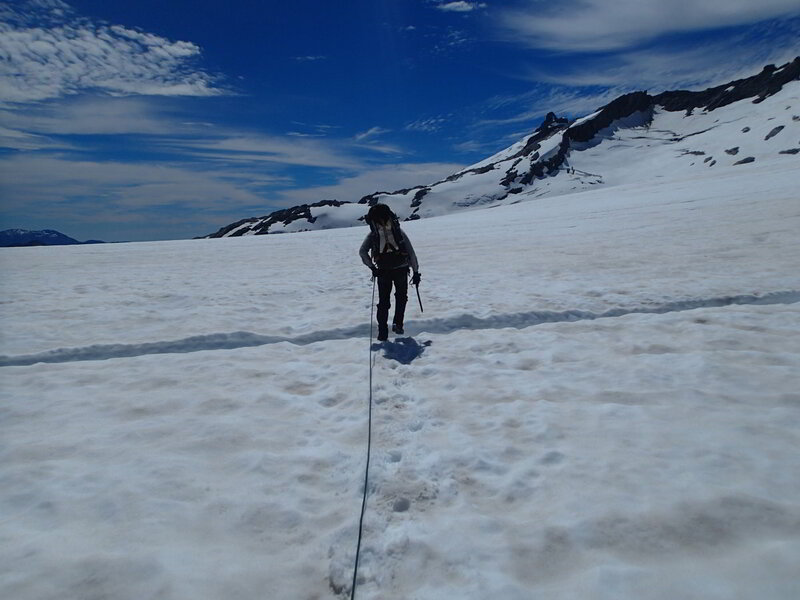 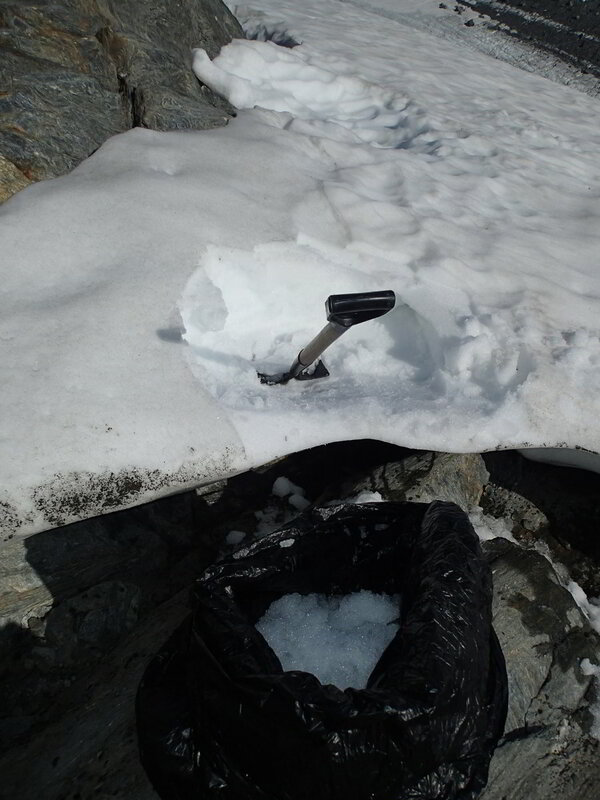 On summit day, we needed crampons and we were bringing ice axes although we didn’t need to use them, instead just using our walking sticks (ski poles). 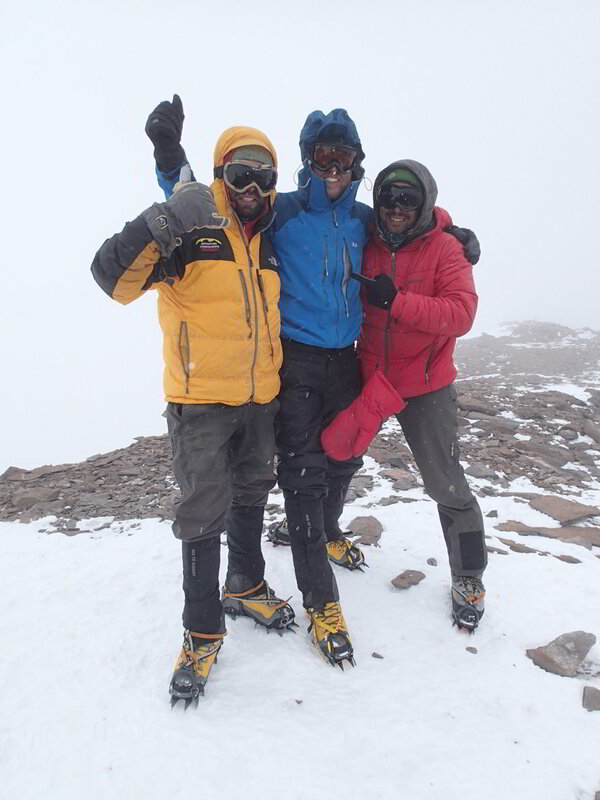 Despite bad weather, we (5 out of 9 climbers) were successful in summiting, arriving on the 6,962m top at 2.30pm on February 14. 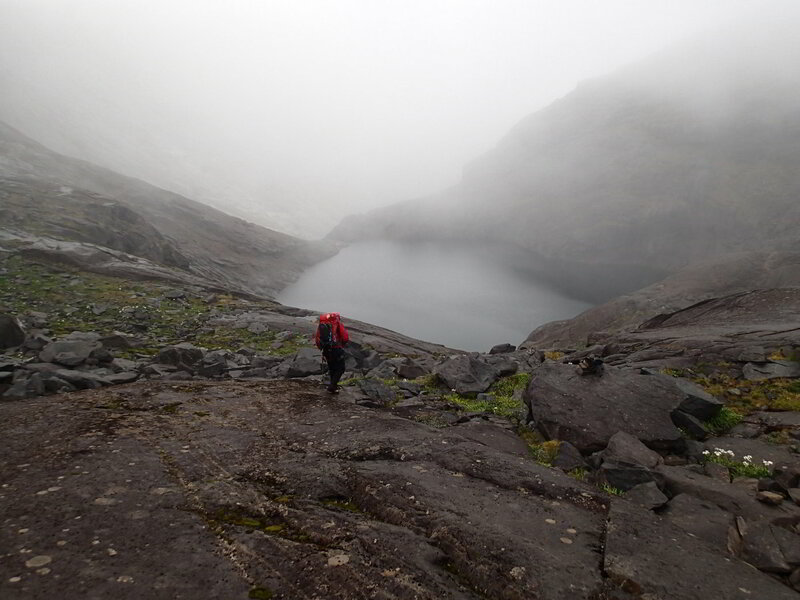 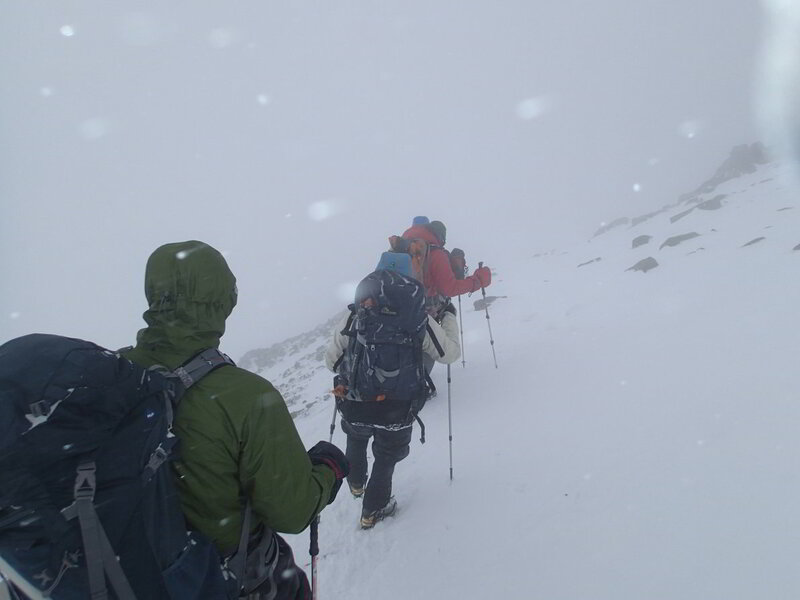 On the way down, the weather took a turn for the worse and on the “traverse” section, it was a minor snowstorm. 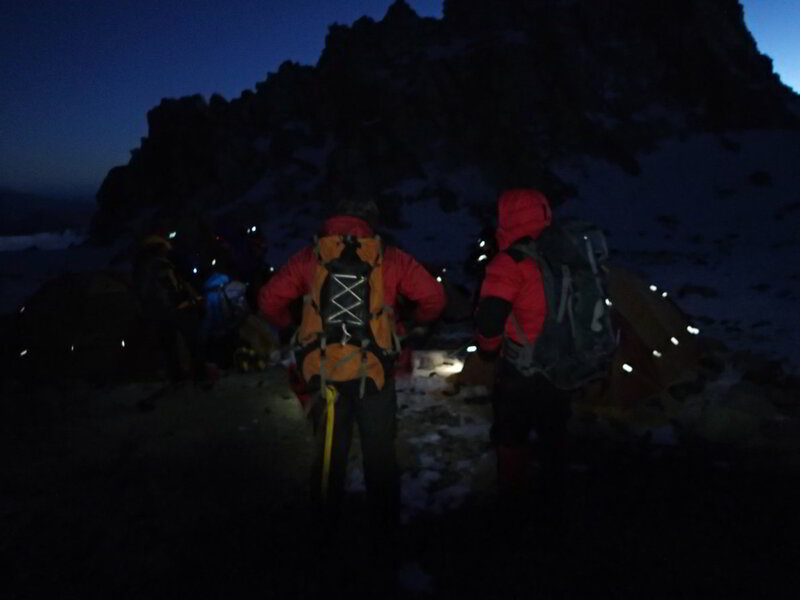 So there was a little of drama, but at the same time I never felt there was any real danger as we had very good guides. 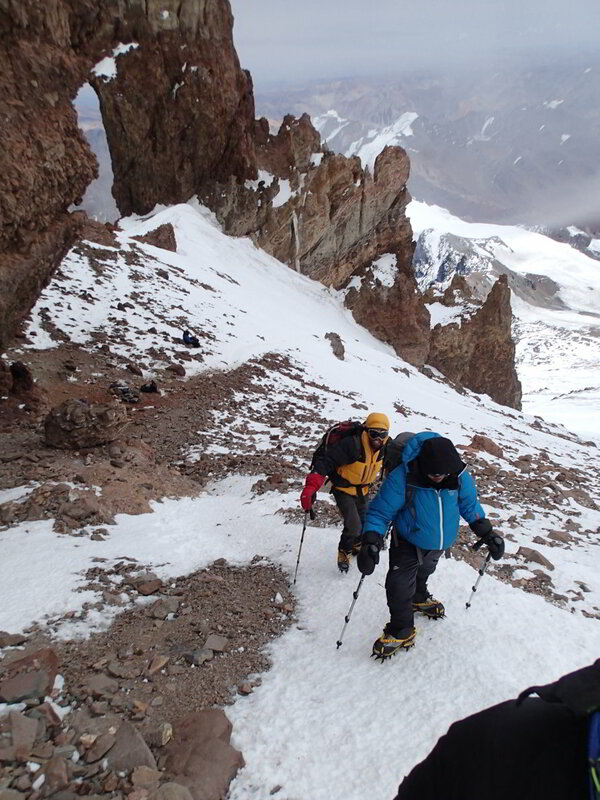 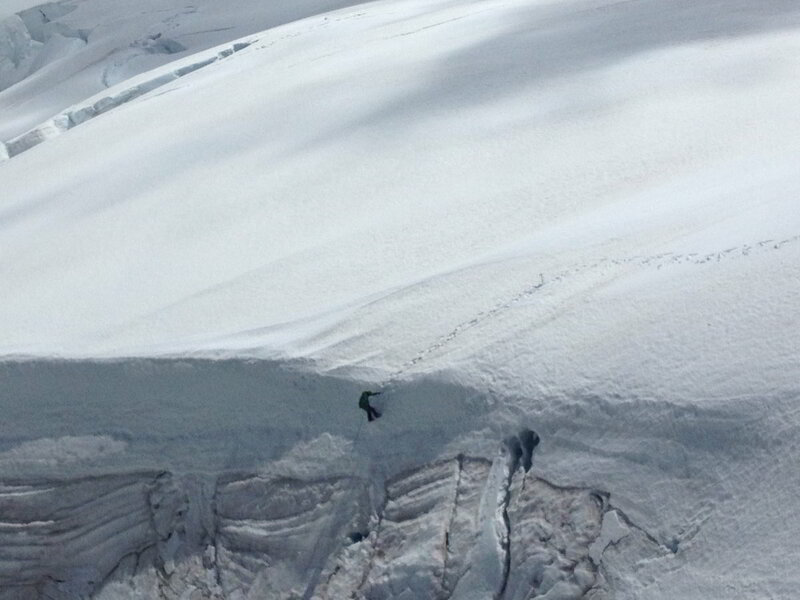 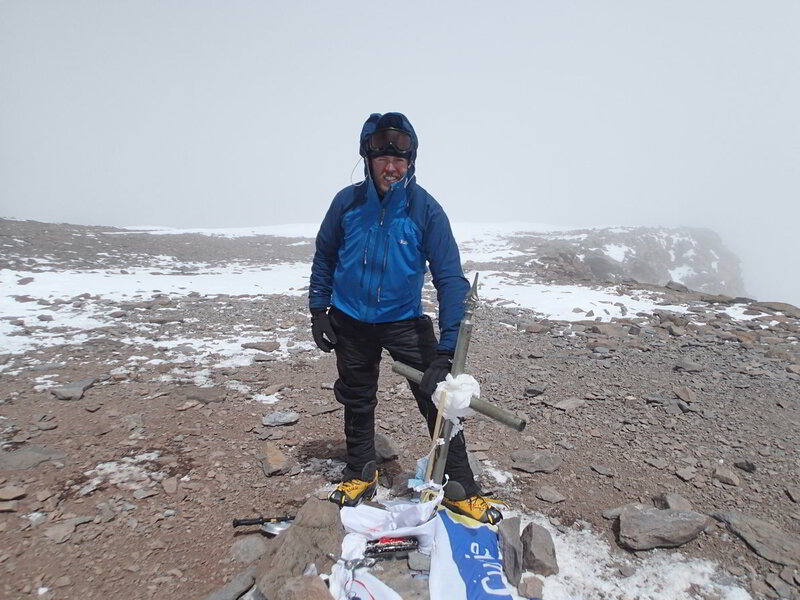 Actually we were quite lucky to have been able to summit at all, because the weather can be quite treacherous at Aconcagua – with very heavy wind and snow, and most expeditions are not set up to have much more than 2 or 3 potential summit days. 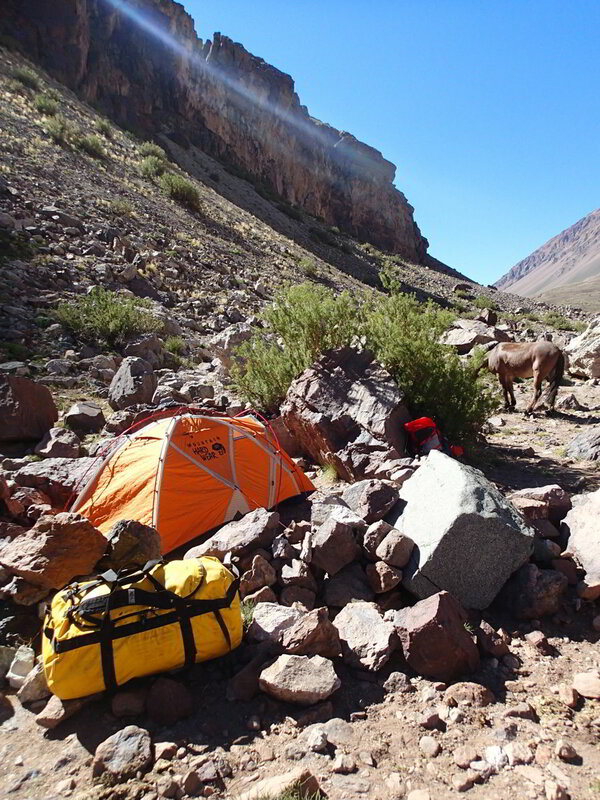 With my goal set on Everest, I wanted to use Aconcagua as a test and get the most training possible, so whilst most people used porters to carry their loads I decided to carry all my own gear, my tent – and my share of group gear! 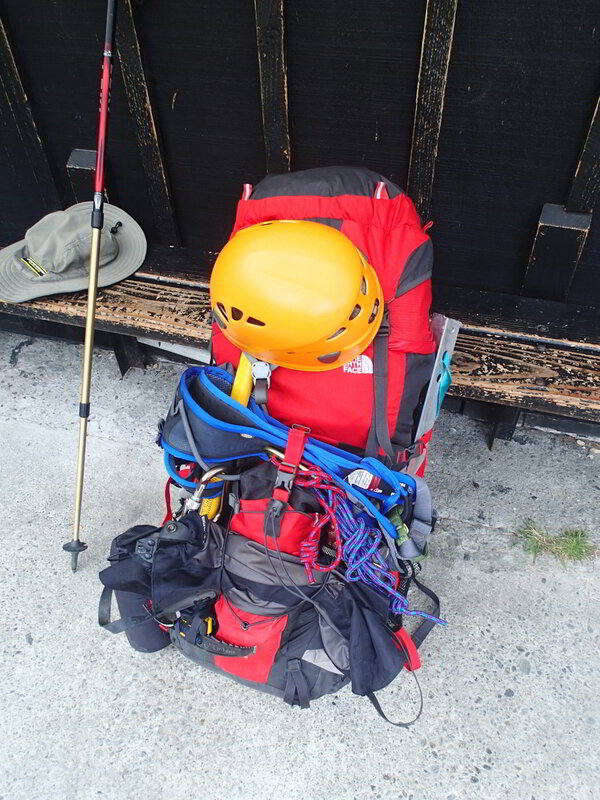 That was quite a challenge, but a good exercise. 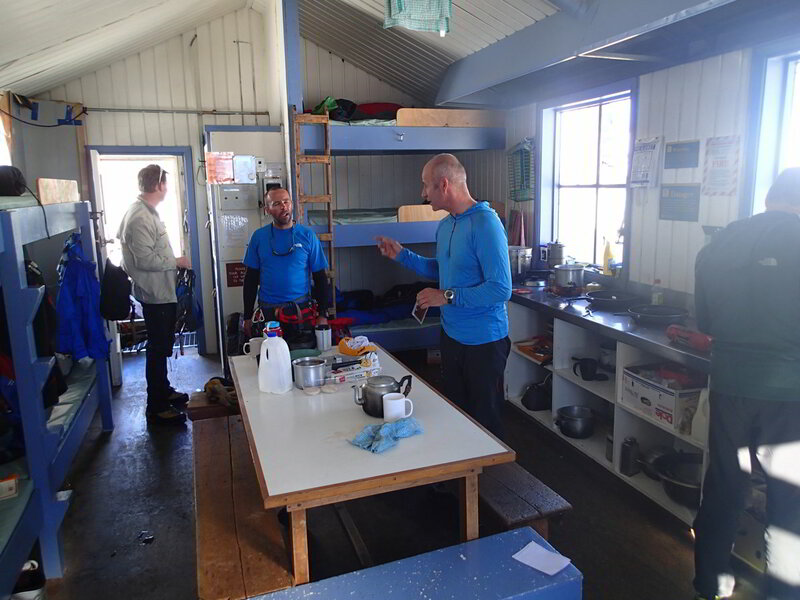 After Aconcagua, I went back to New Zealand’s South Island, and started a new set of technical training, this time with a guide, Mike, who has been on Everest 8 times! 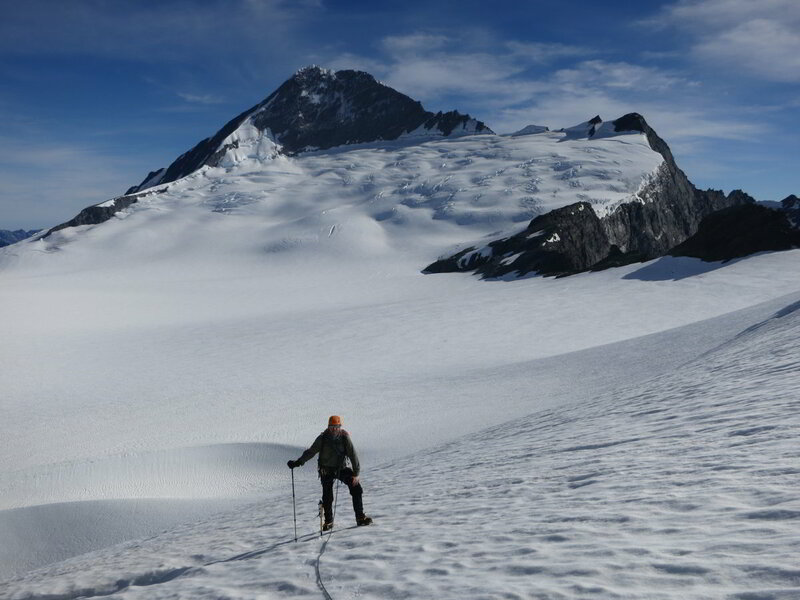 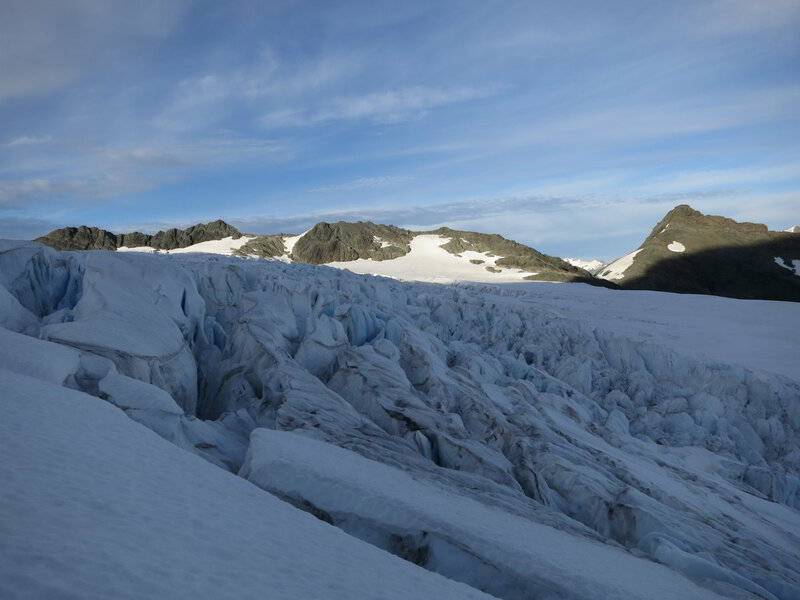 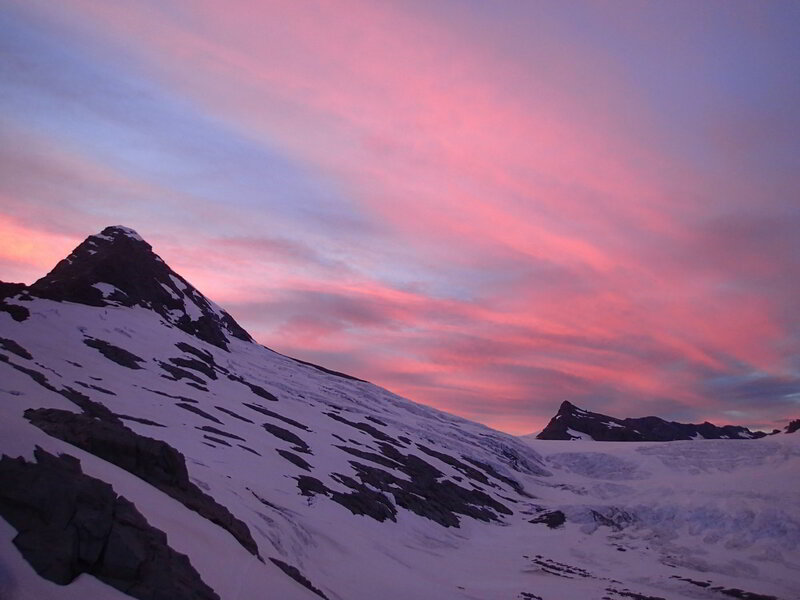 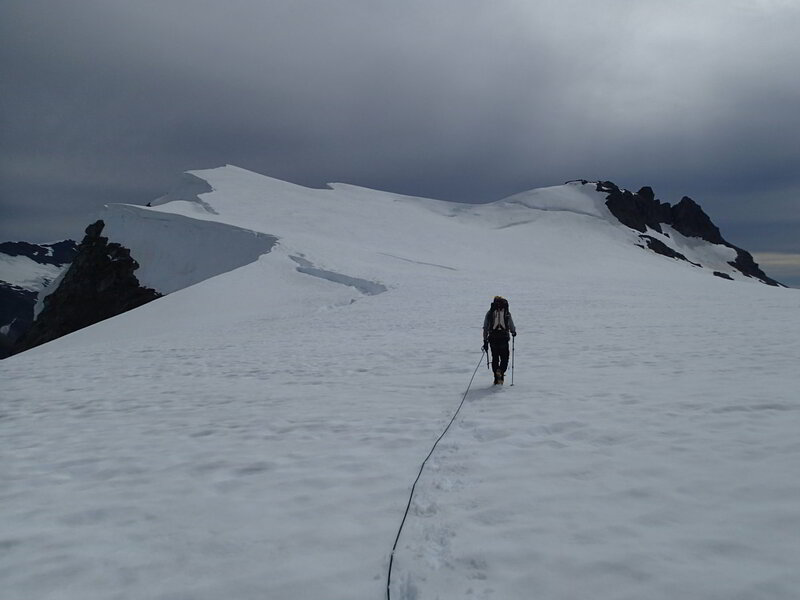 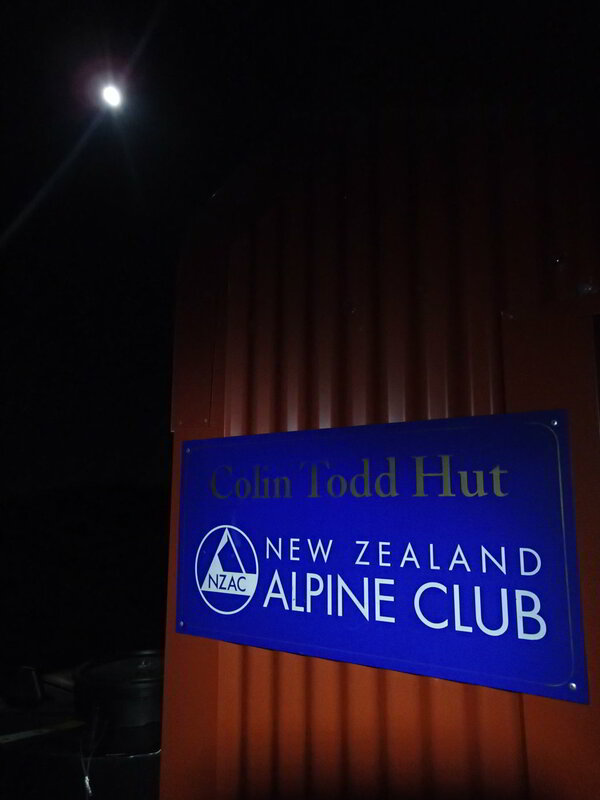 We had a very productive week in the Mt Aspiring National Park, with three peaks in three days: Mt Aspring, Mt Bevan, and Mt Avalanche, using the Colin Todd Hutt as our base, then traversing the Quarterdeck Glacier down to French Ridge Hut (which included having to jump 2 meters across a super deep crevasse!) 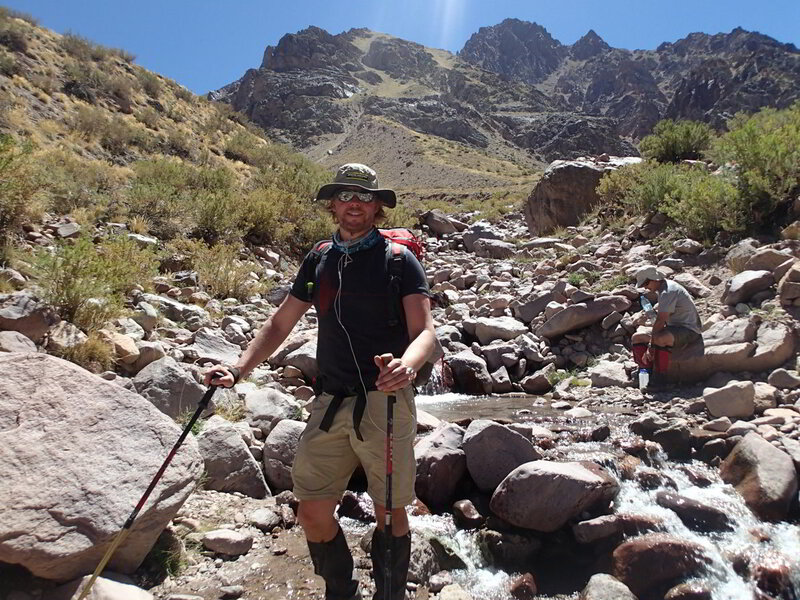 and trekking down to Aspiring Hut, where I got eaten alive by sand flies!. 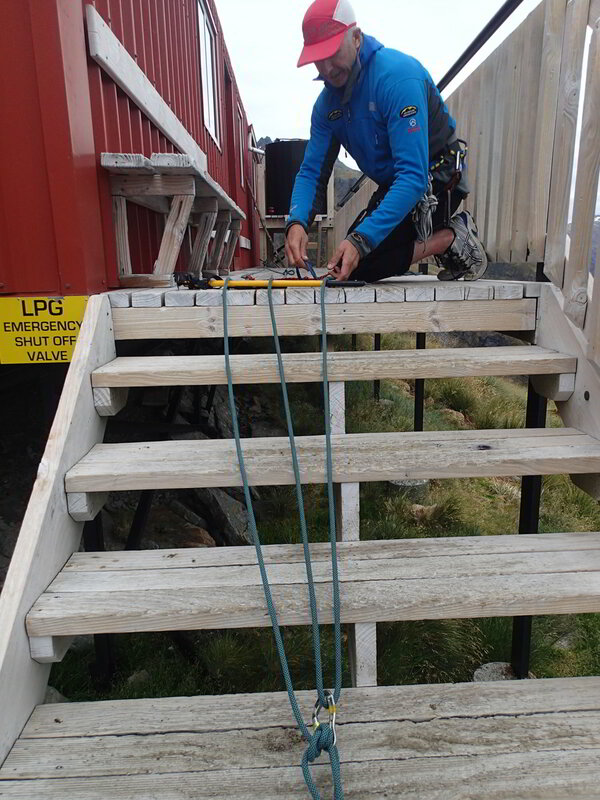 We also managed to get some great rope/knot training, and an advanced course in glacier rescue during our rest day at the French Ridge Hut. 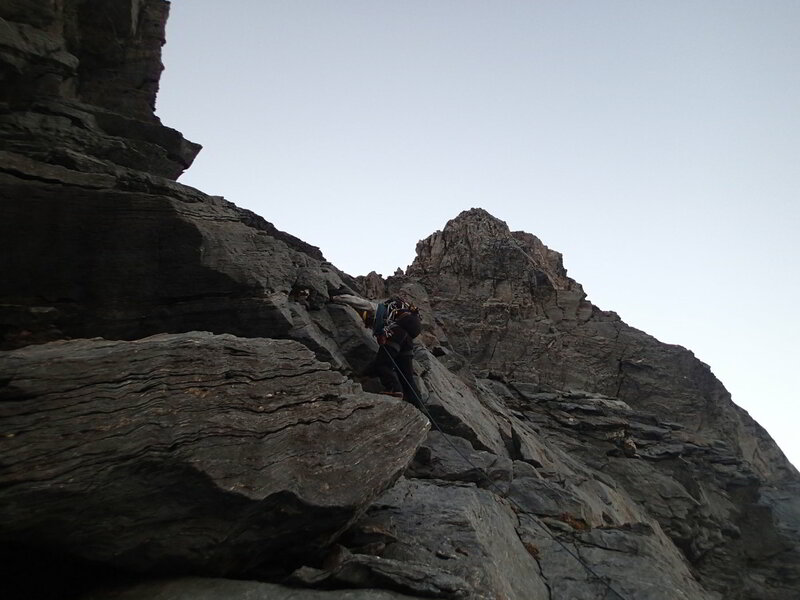 On the way back from Aspiring National Park, we even got a little bit of rock climbing squeezed in. 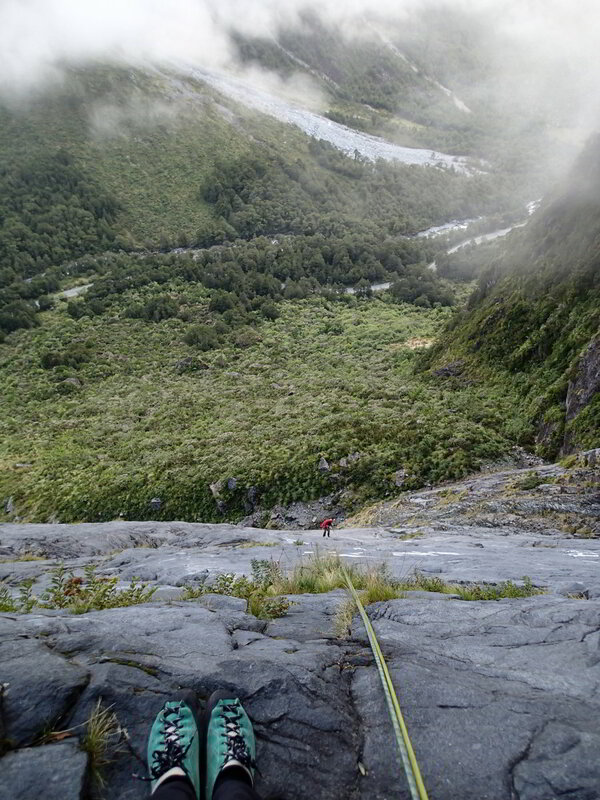 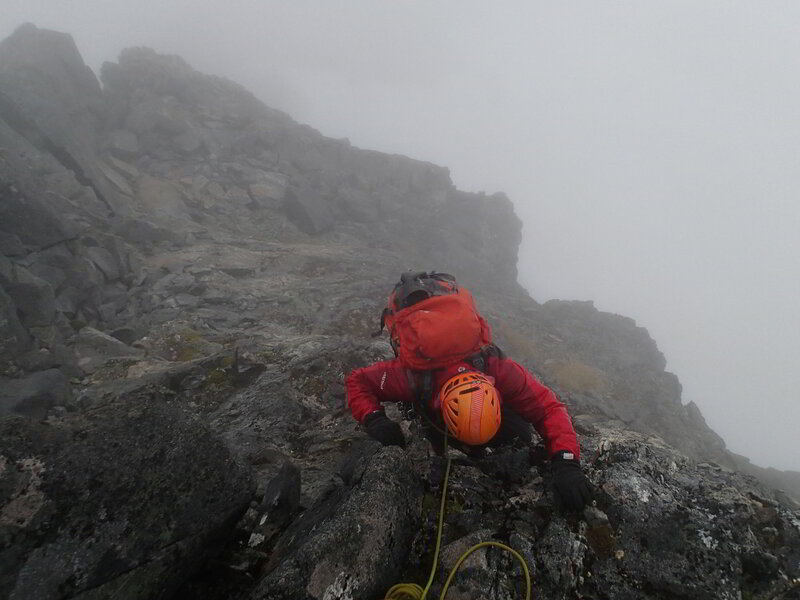 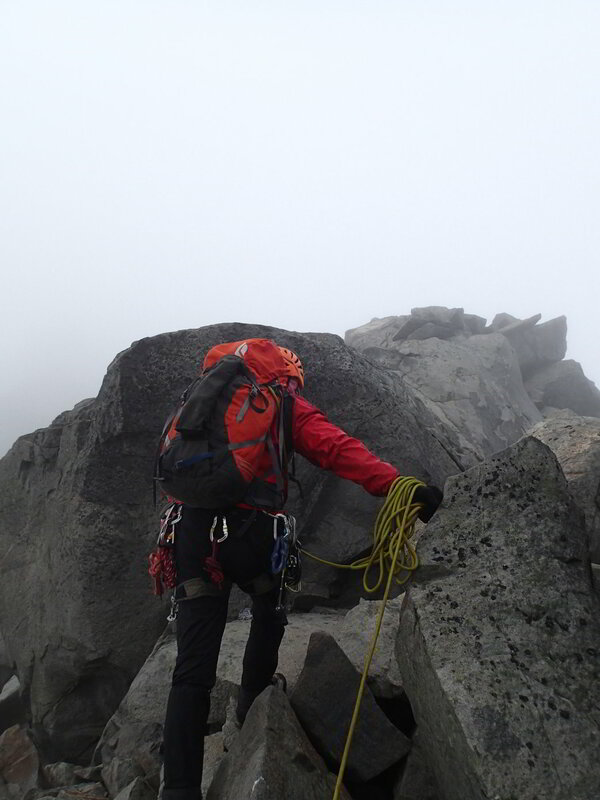 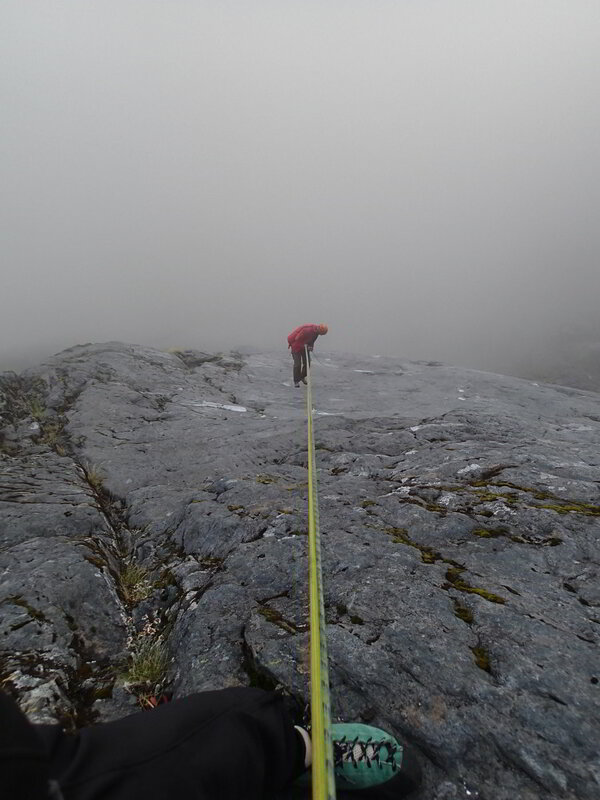 After the week with Mike, I had a further week’s training with Nick, another very experienced climber with a 40 year career of pioneering new routes, often very challenging ones, around New Zealand. 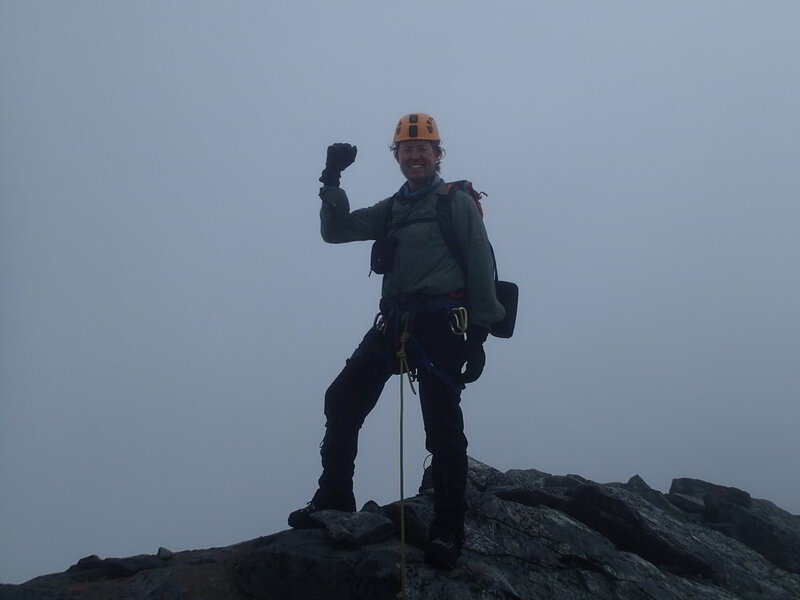 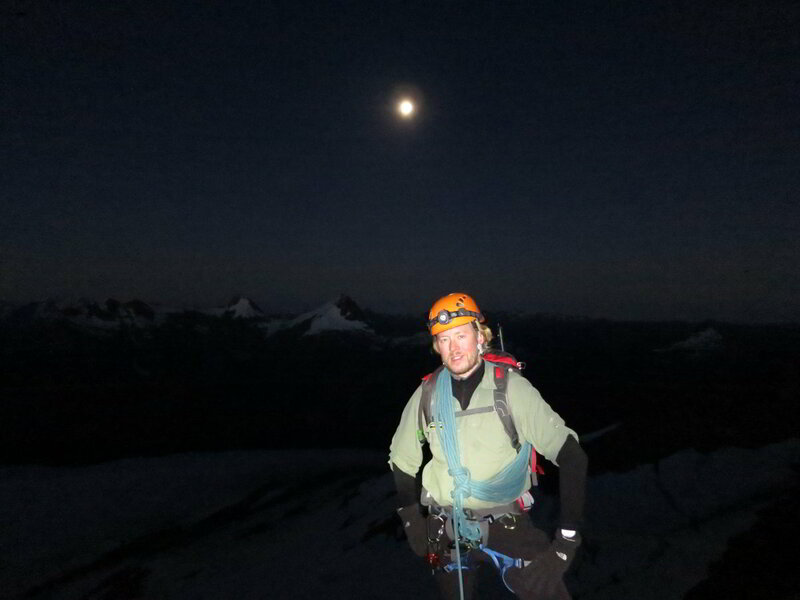 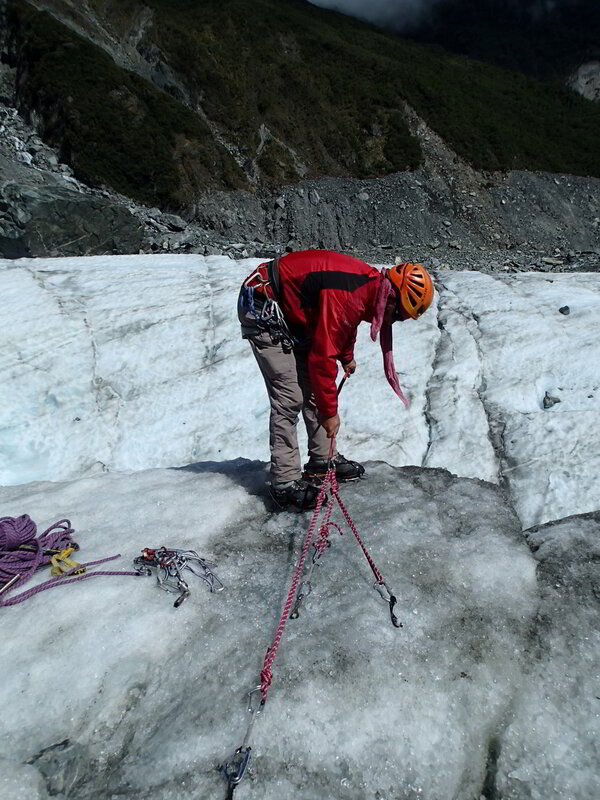 Nick has always been less into the Big Mountain mountaineering expeditions, and more into rock climbing as well as technical mountaineering. 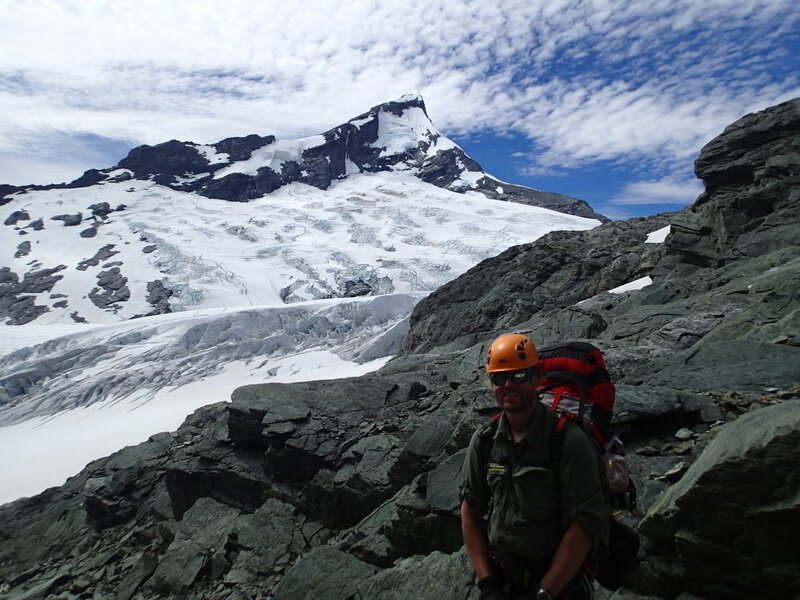 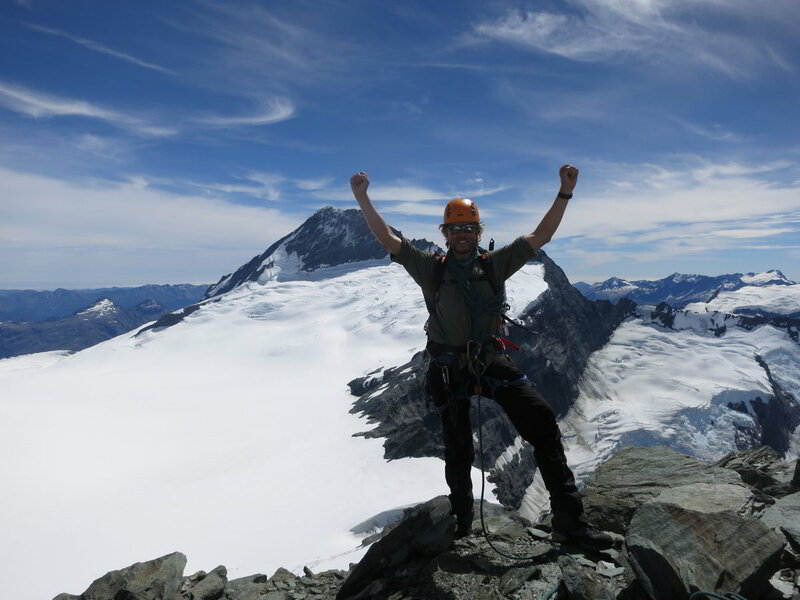 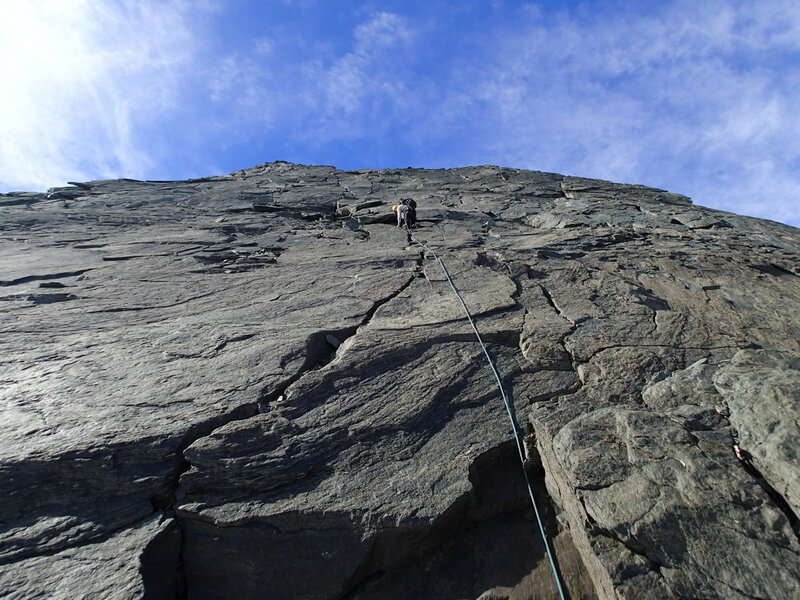 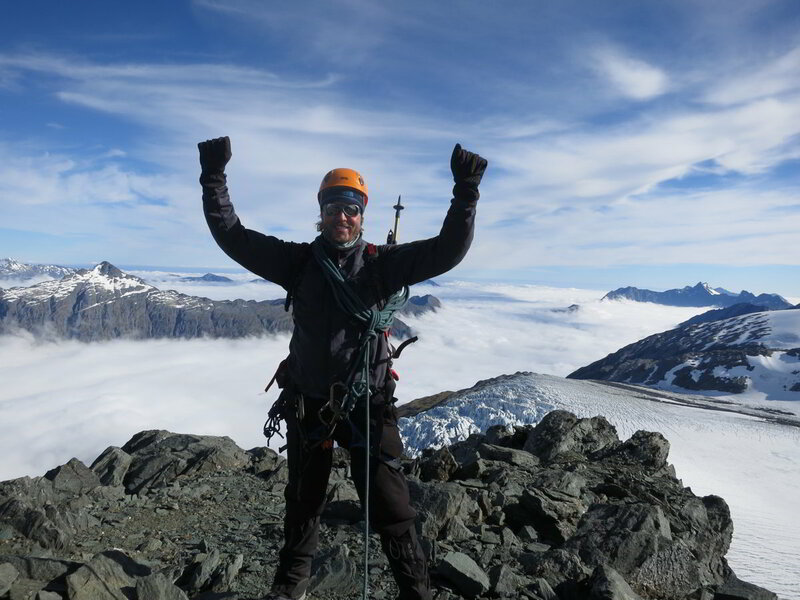 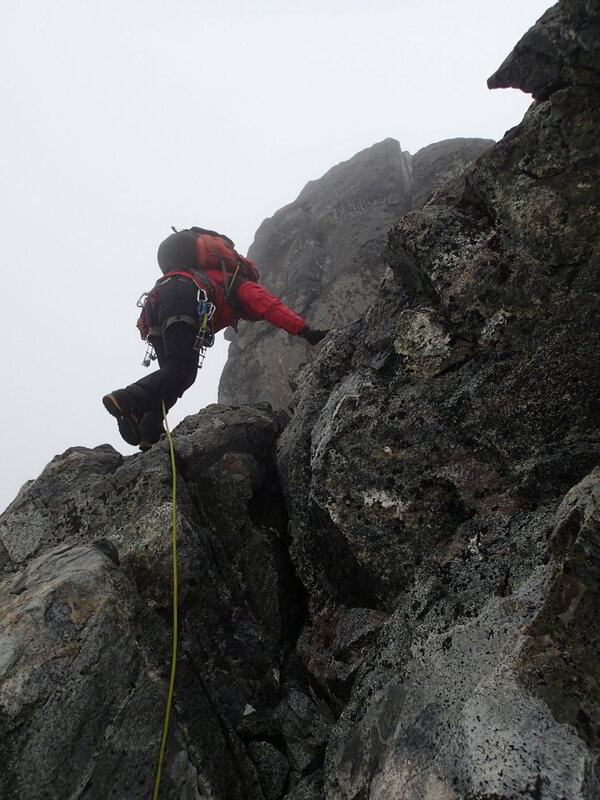 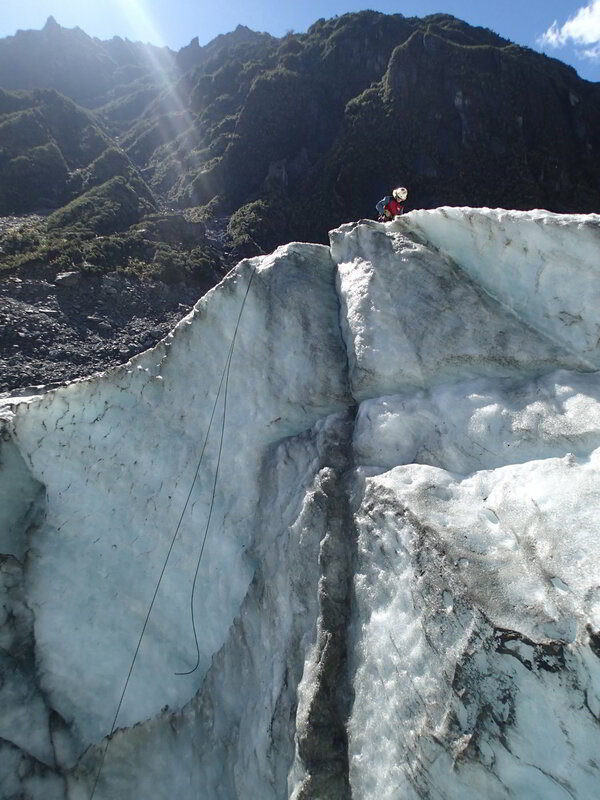 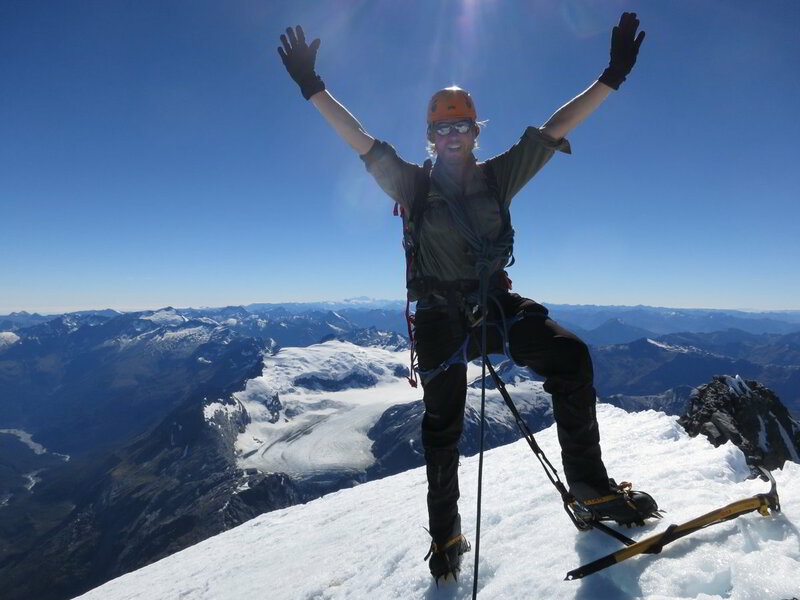 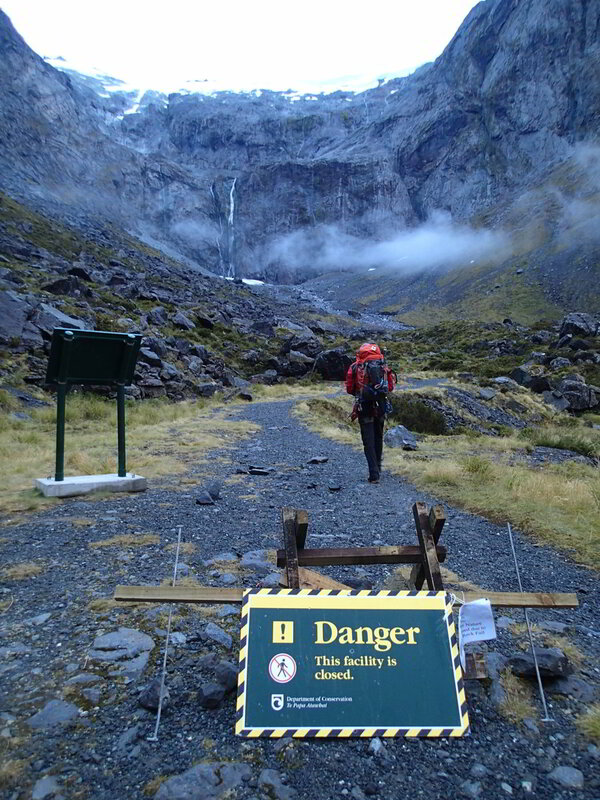 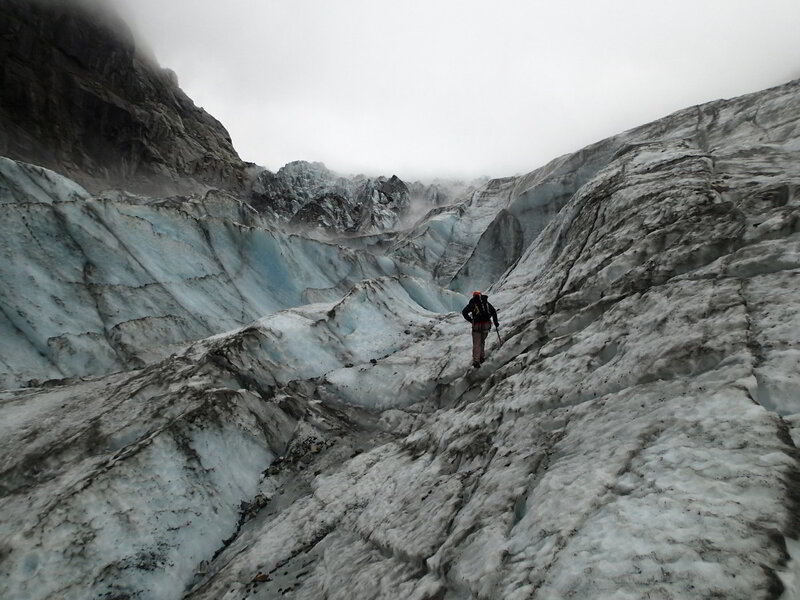 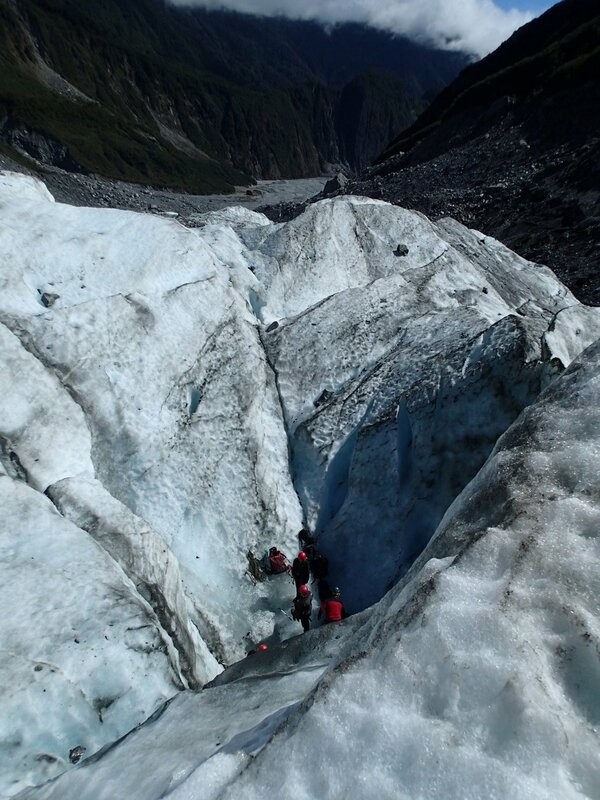 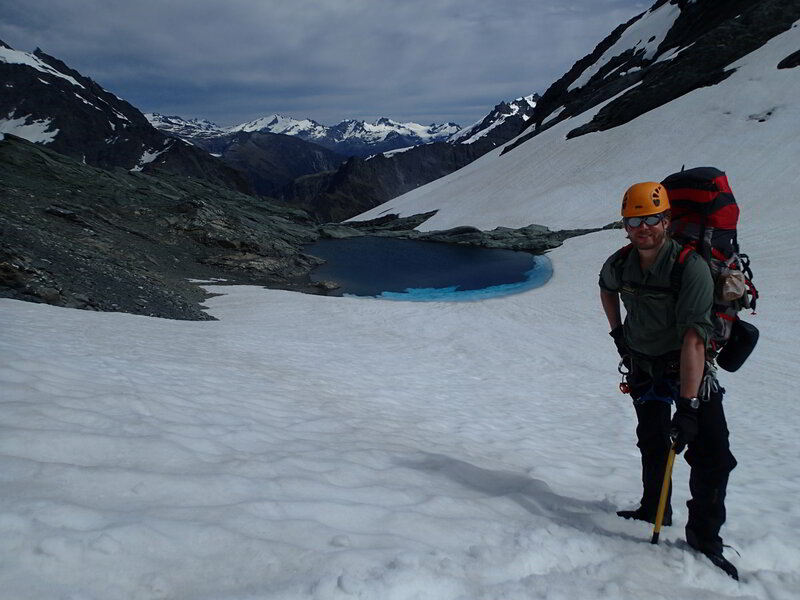 We had a great week, both in the Fiordland/Milford Sound region where we did some great rock climbing as well as climbed Mount Talbot, and also in the Fox Glacier region where we did some vertical ice wall climbing – one of my favorites for sure!! 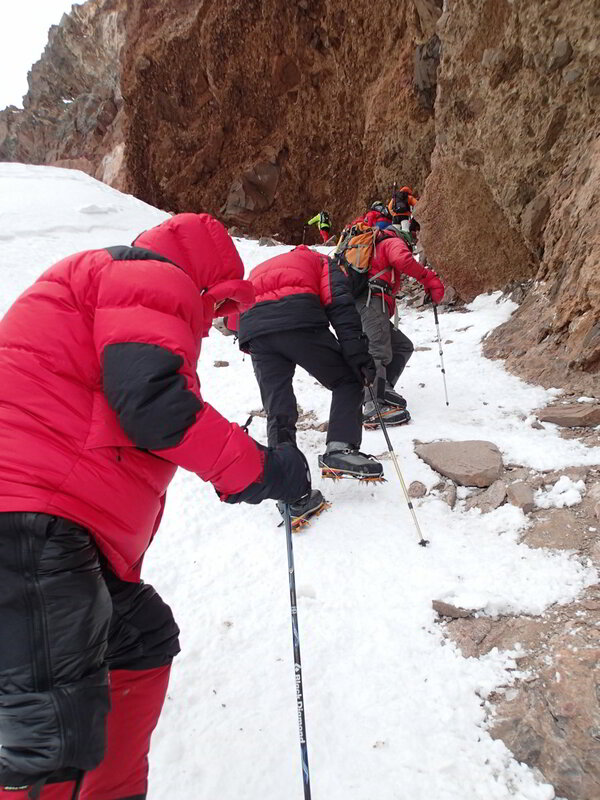 I had a great time with each of Paul, Mike and Nick, and it was awesome to be trained by three different guides, each with their own style and approach. 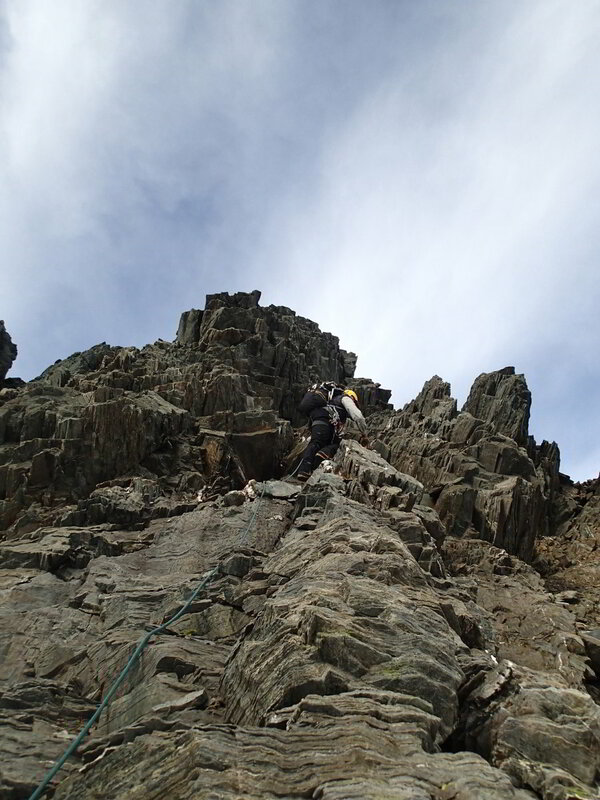 That way I learnt that there are several different ways to address each issue, and through this intensive program I also got a lot of mileage by doing different peaks. 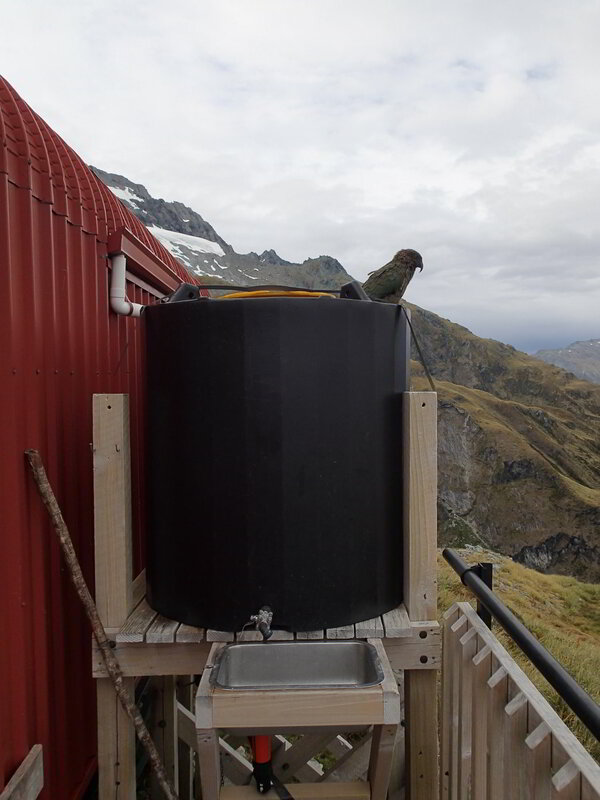 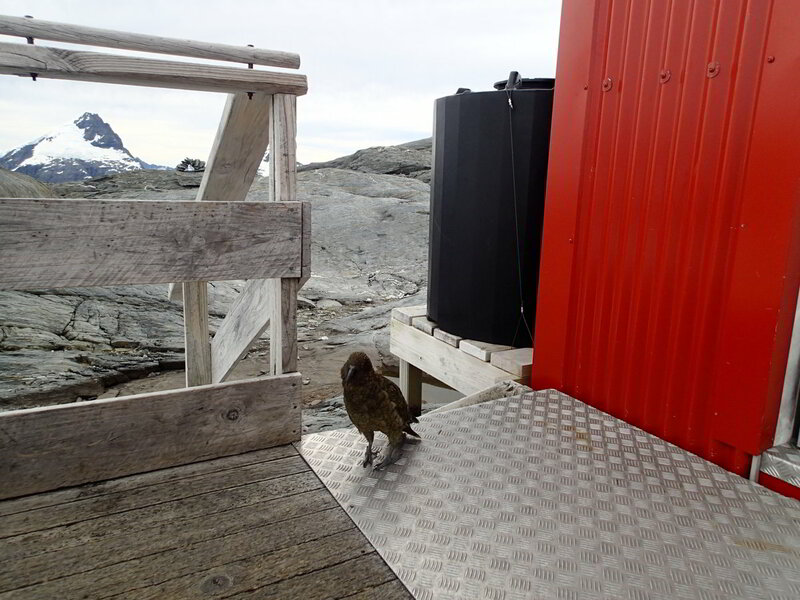 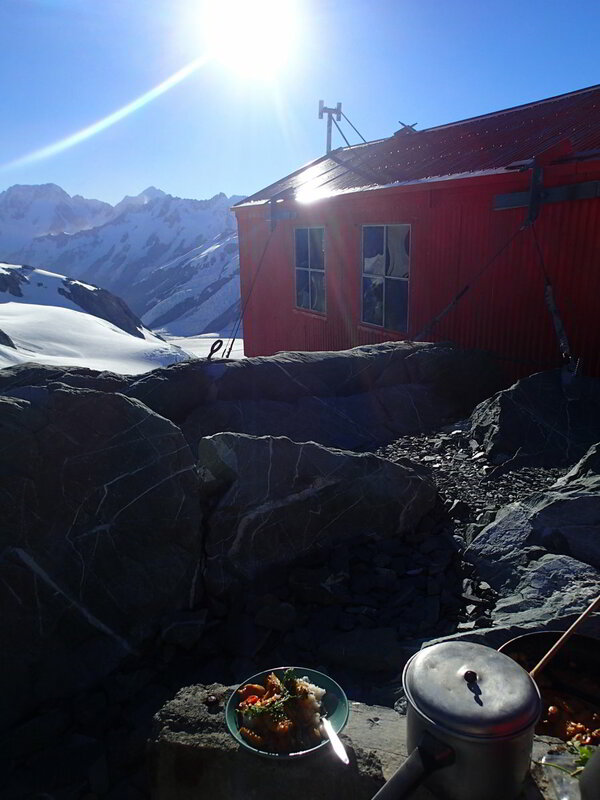 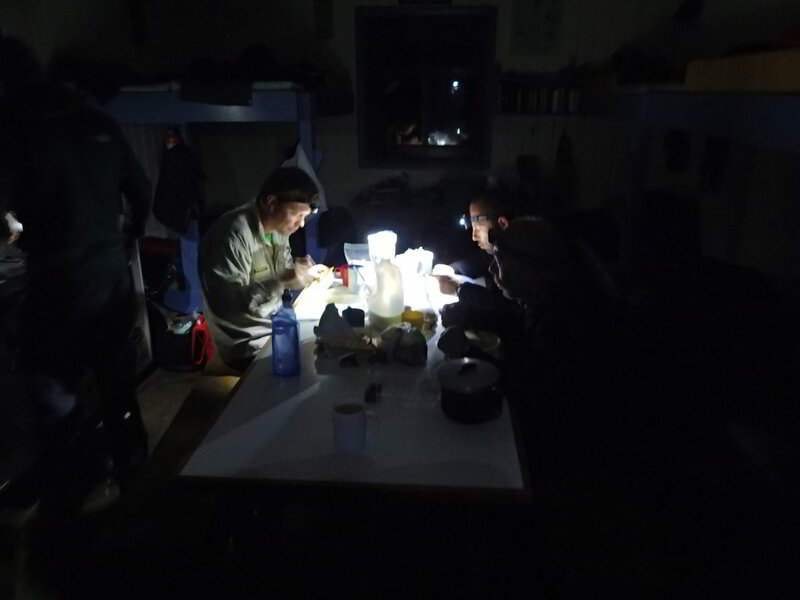 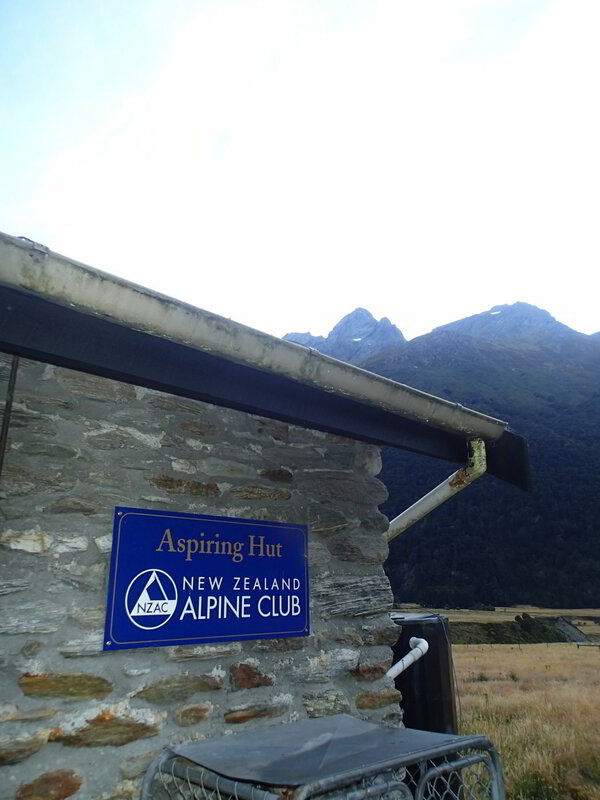 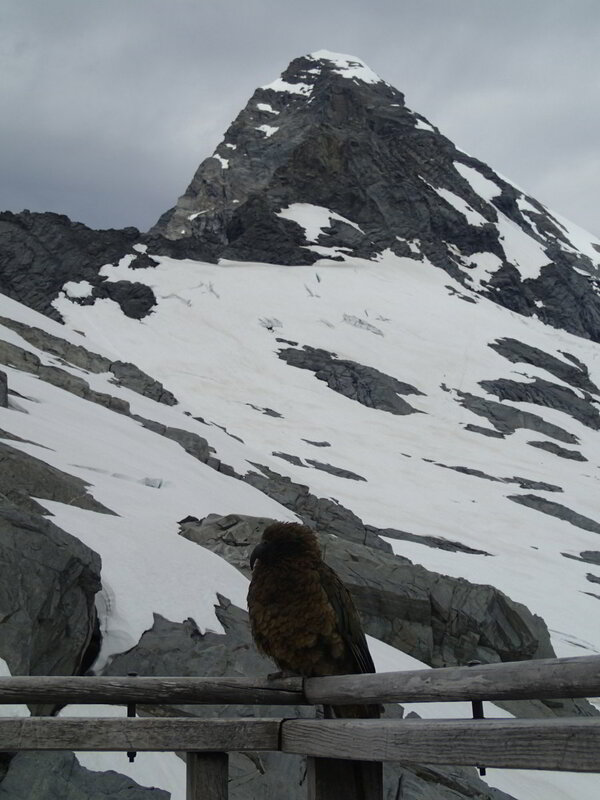 It was also pretty cool to stay in the New Zealand Alpine Club huts, and enjoy the tranquillity – only interrupted by Keas (NZ alpine parrots) that are trying to steal all your stuff and sabotage the calm! 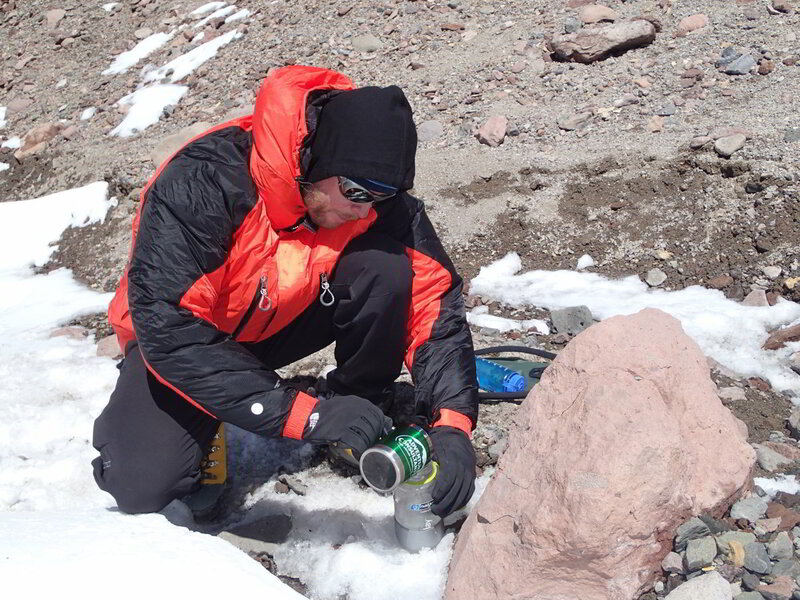 I hope that thanks to this training, combined with the successful altitude test at Aconcagua, I will be in the best possible position to give Everest my best try. 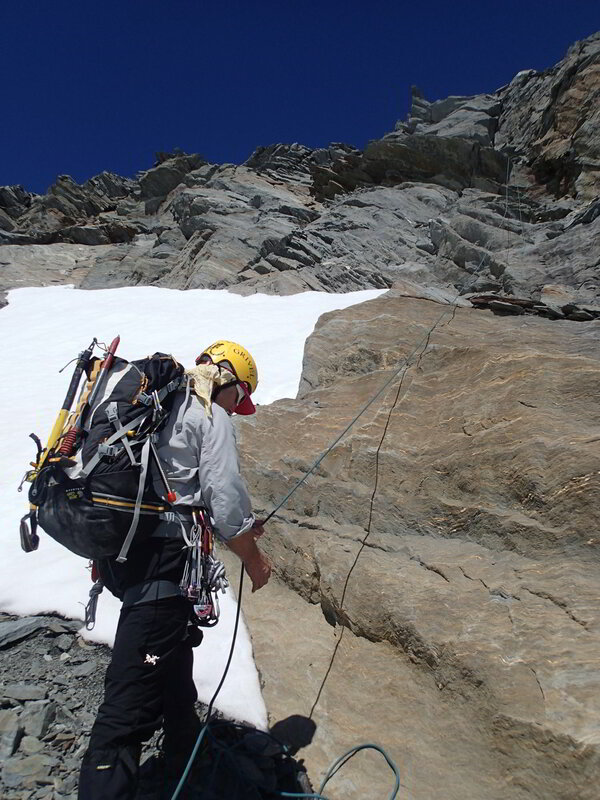 Everest is not super technical climbing compared to some other peaks – including those I climbed in New Zealand, although anything you try to do above 8,000m becomes VERY challenging. 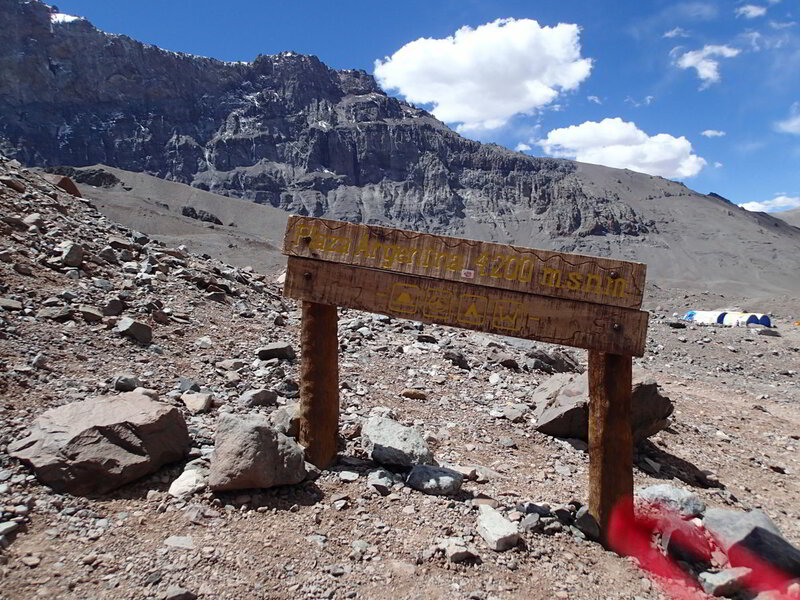 It’s also another 1,900m higher than Aconcagua so in a different league altitude wise, but on the other hand I will use bottled oxygen which should help somewhat. 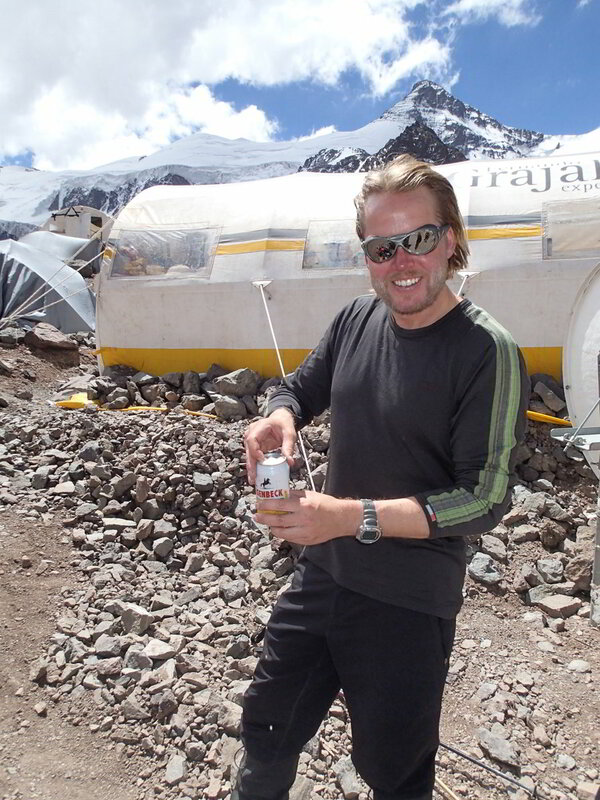 I’m not like that crazy maverick Swede Göran Kropp who bicycled from Sweden to Nepal, climbed Everest without oxygen and no external support whatsoever, and then bicycled back to Sweden! 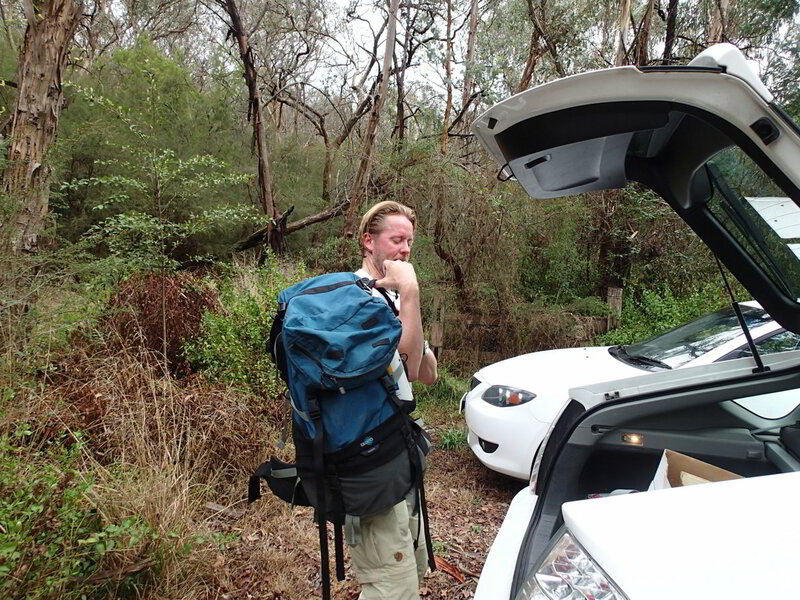 I’m not quite there yet!